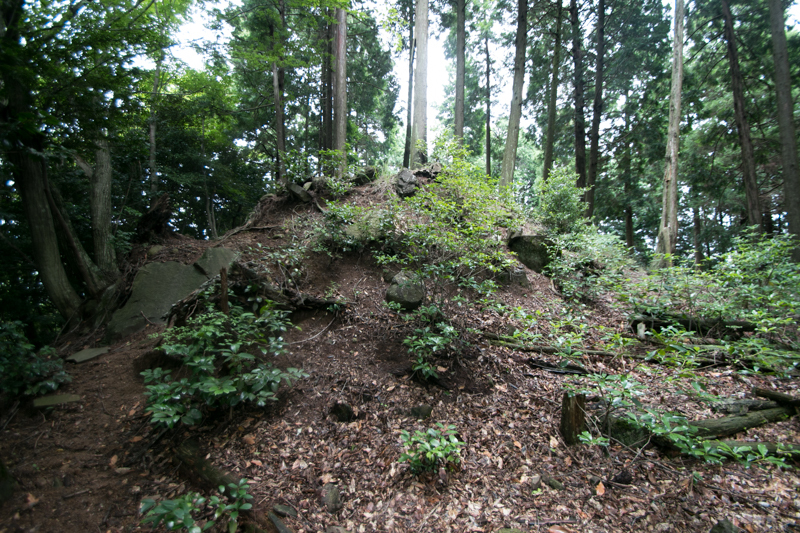 Nagaiwa castle (長岩城) is built on Ogiyama mountain and next peak at the inside of Tsutami valley, which is formed by Tsutami-gawa river that is a tributary of Yamakuni-gawa river. 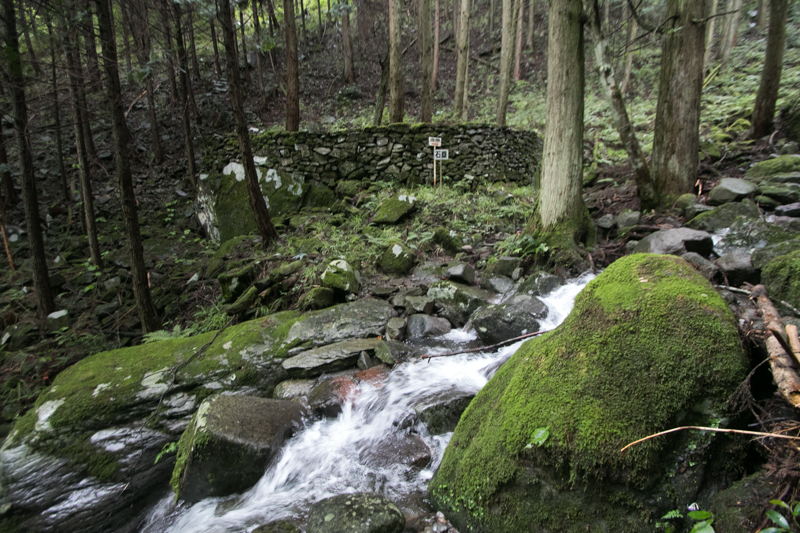 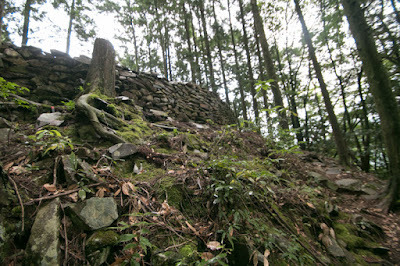 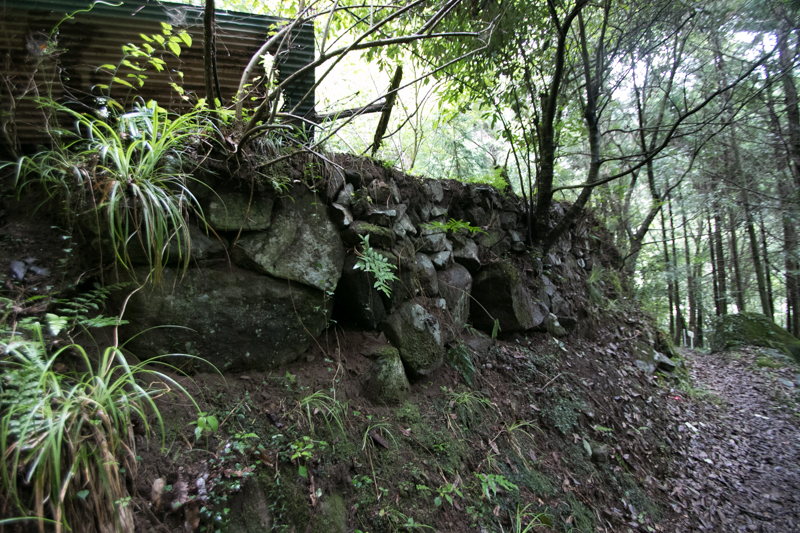 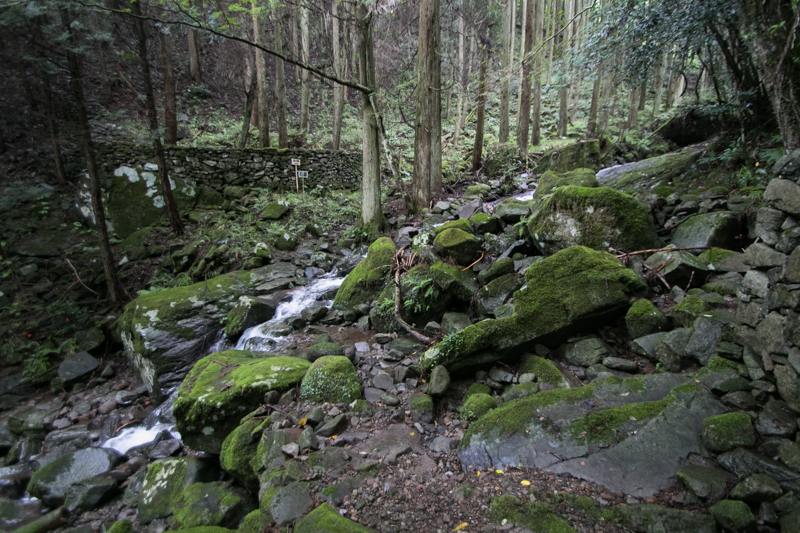 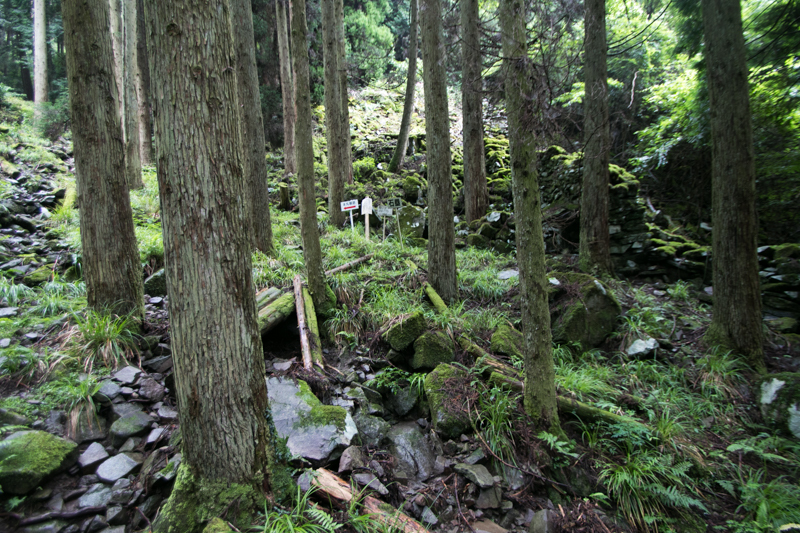 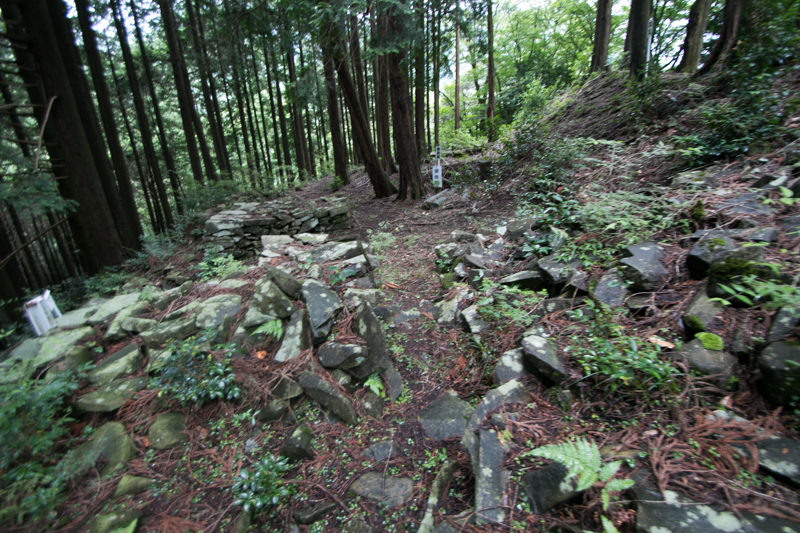 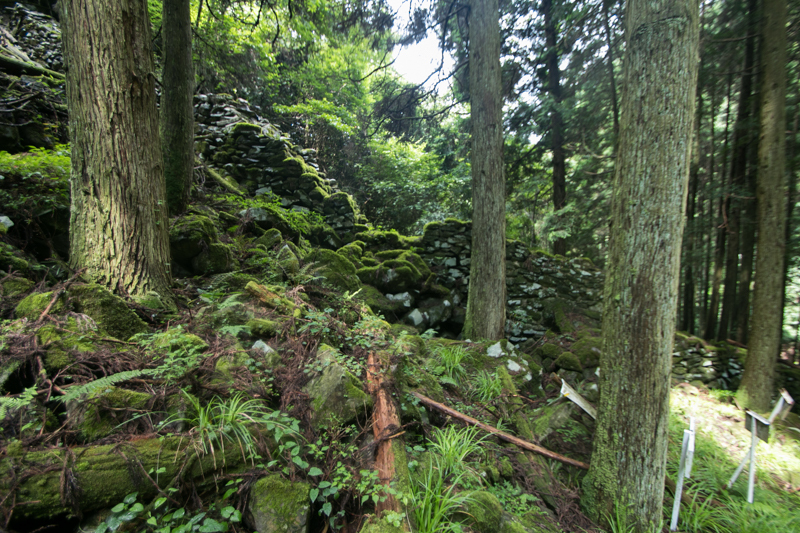 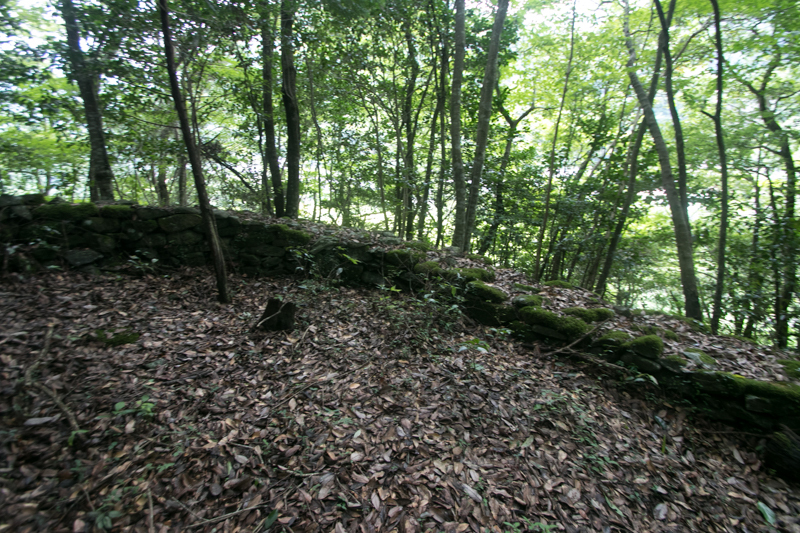 Castle site is at the inside of Yabakei valley, which is a beautiful one formed by Yamakuni-gawa river and its tributary passing protruding strange stones at the southwest of Nakatsu plain. 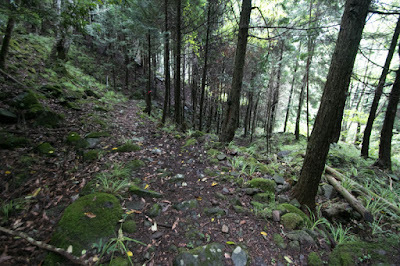 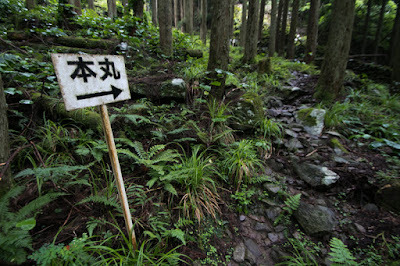 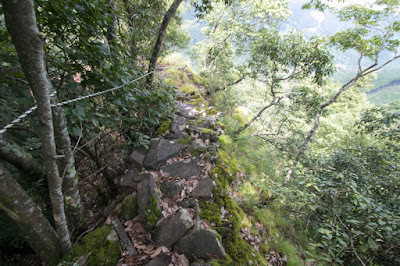 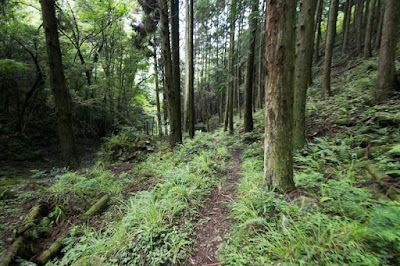 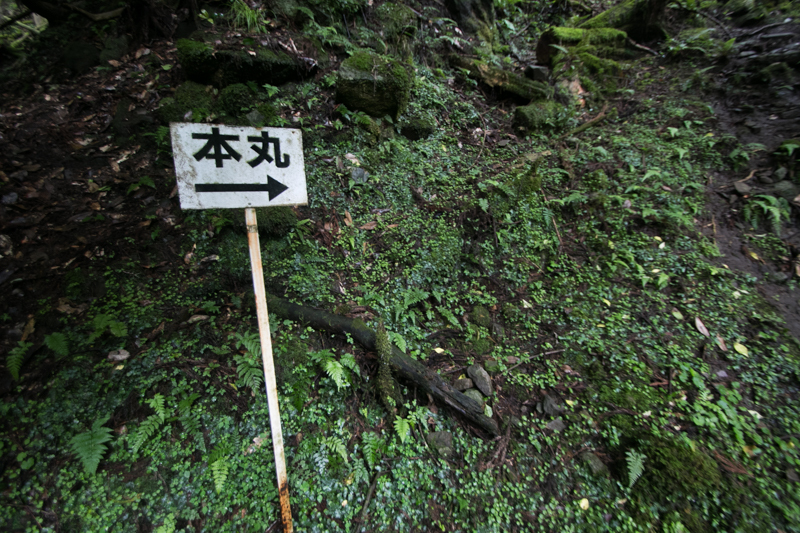 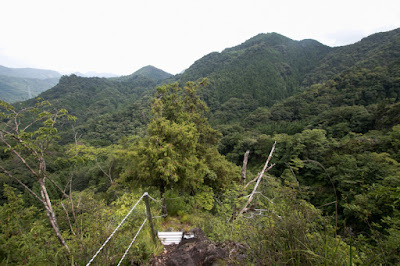 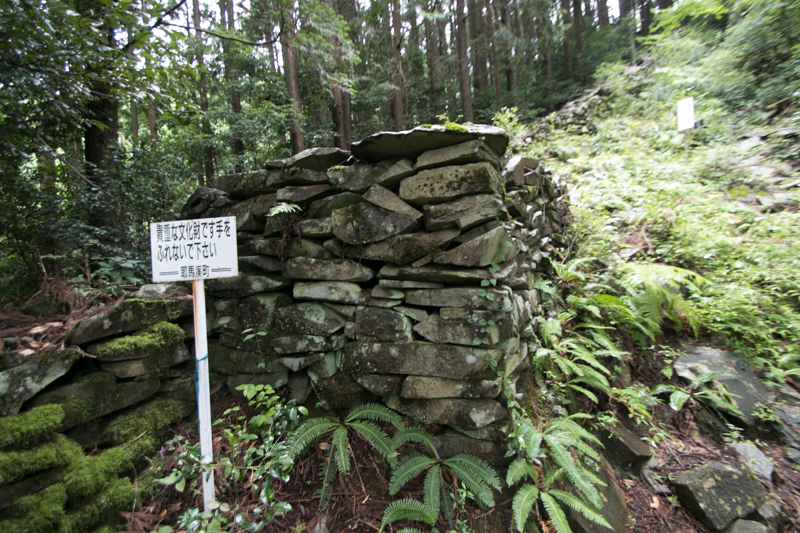 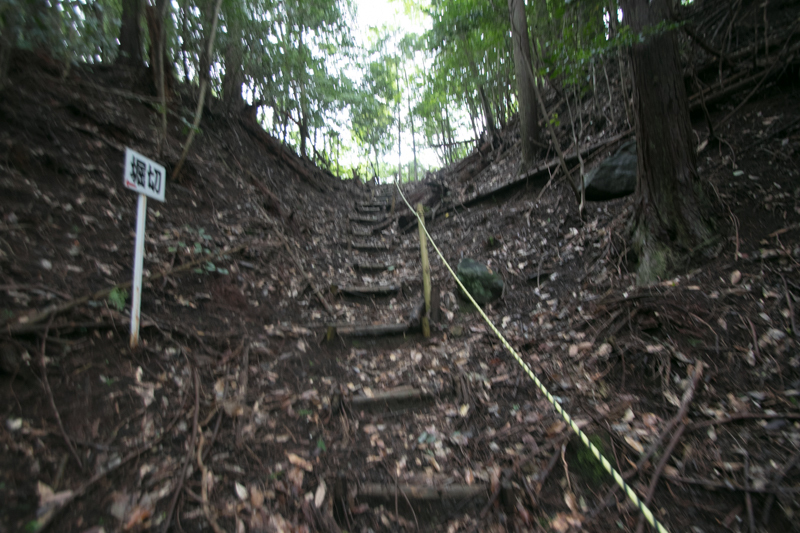 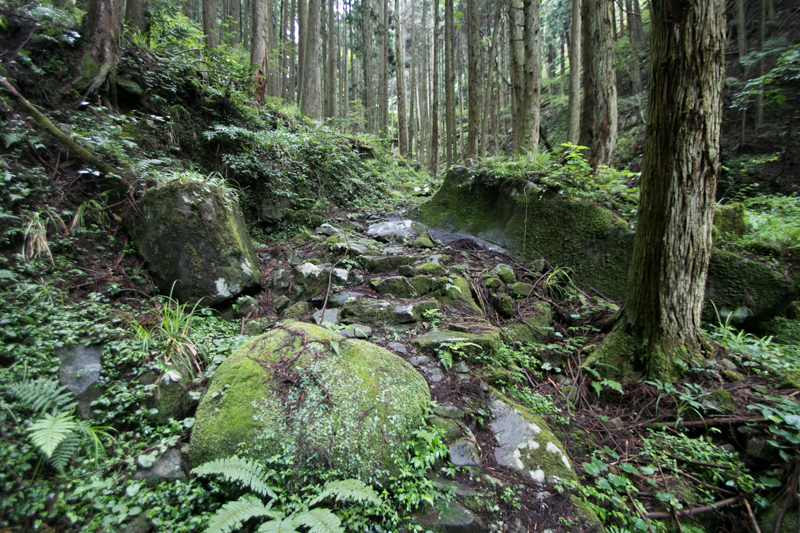 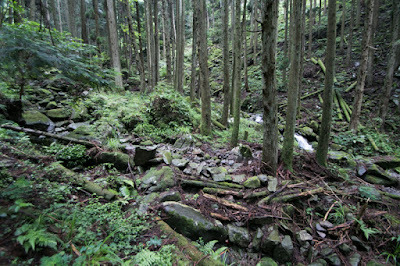 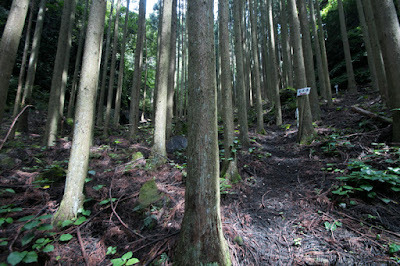 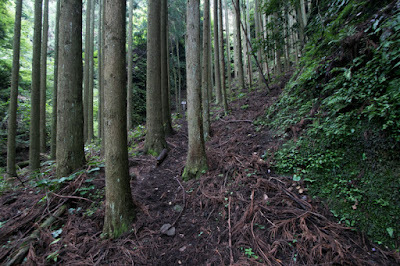 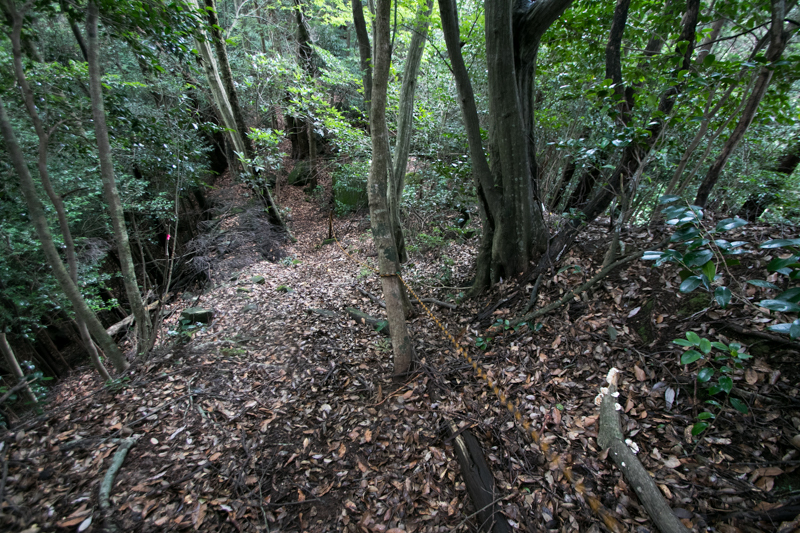 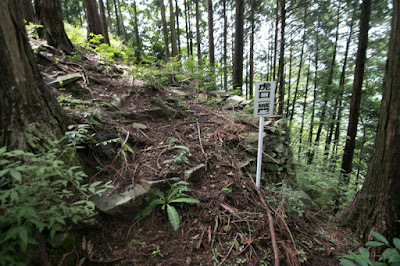 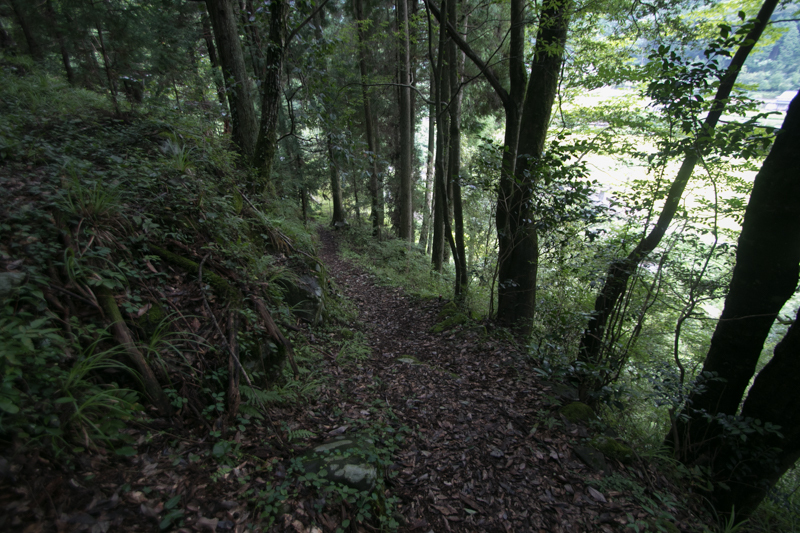 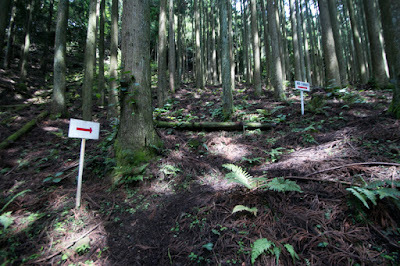 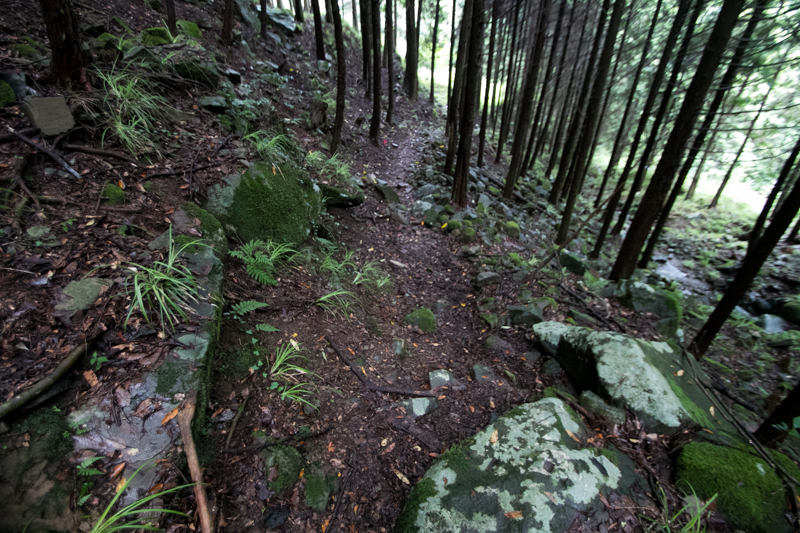 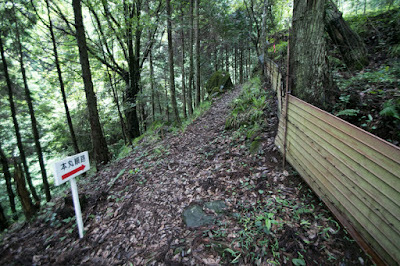 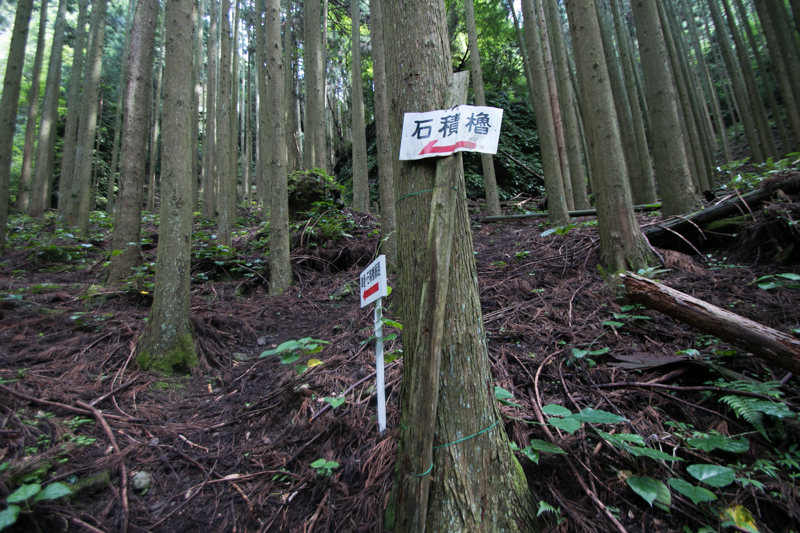 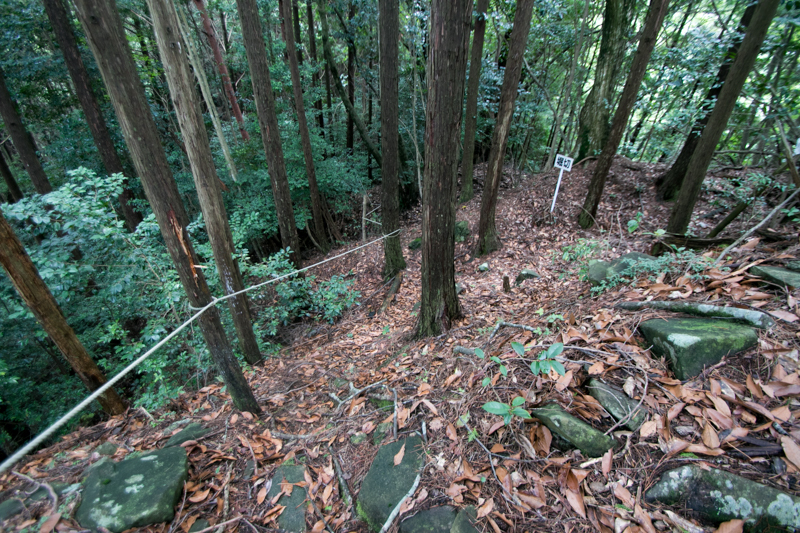 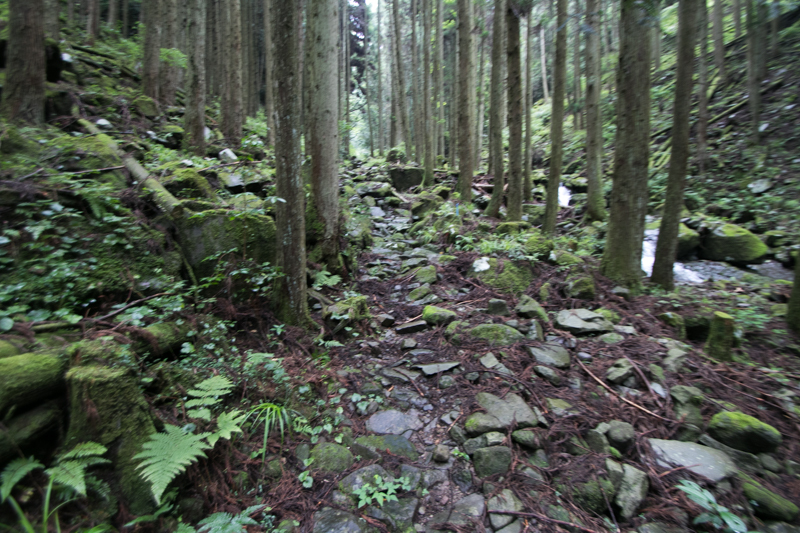 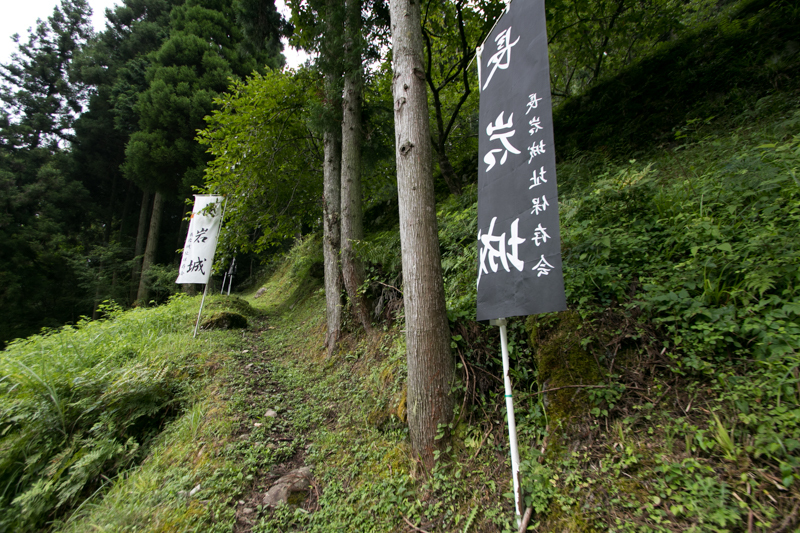 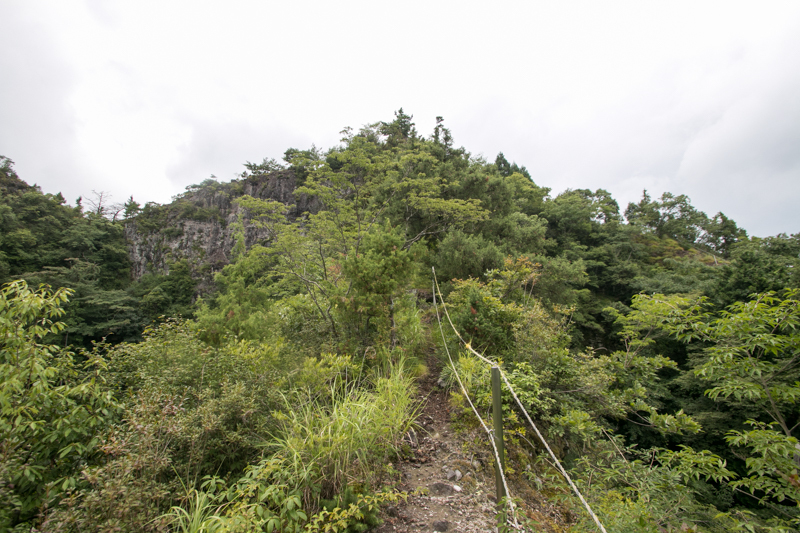 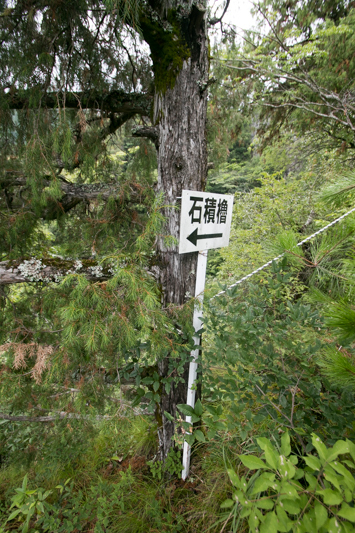 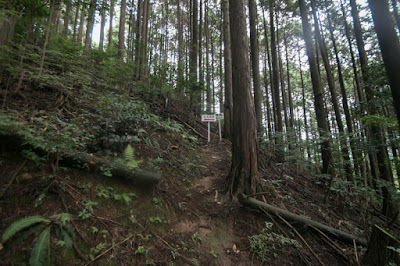 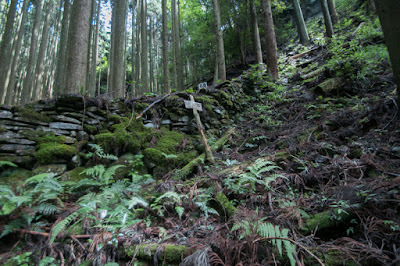 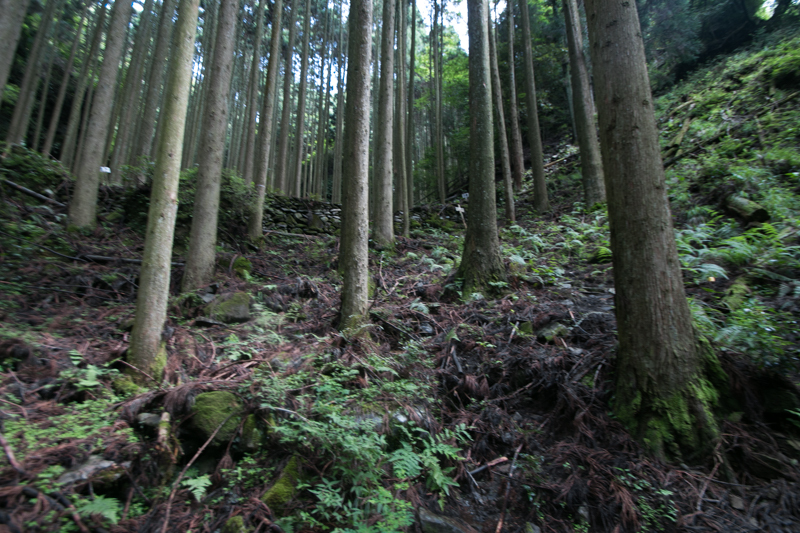 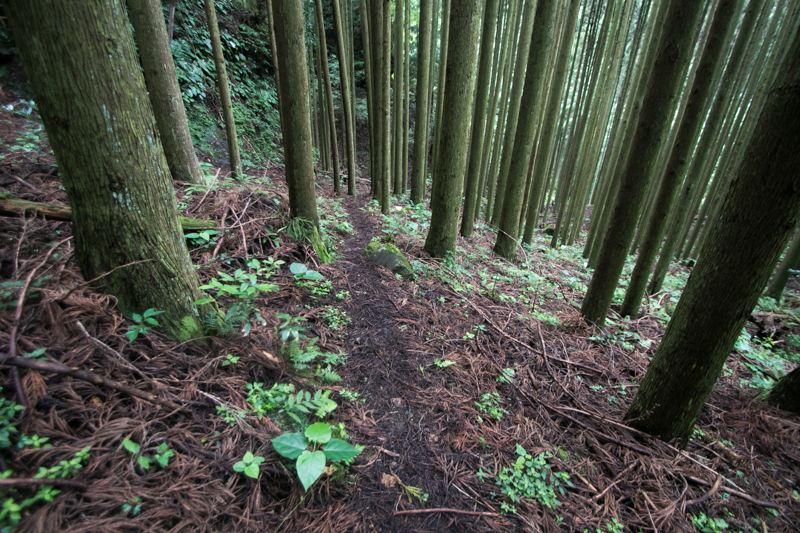 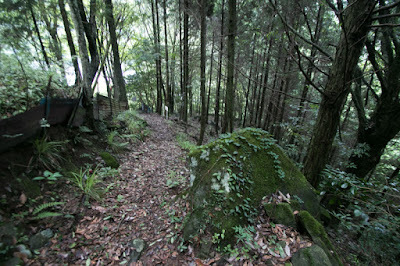 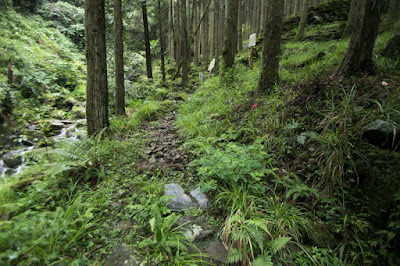 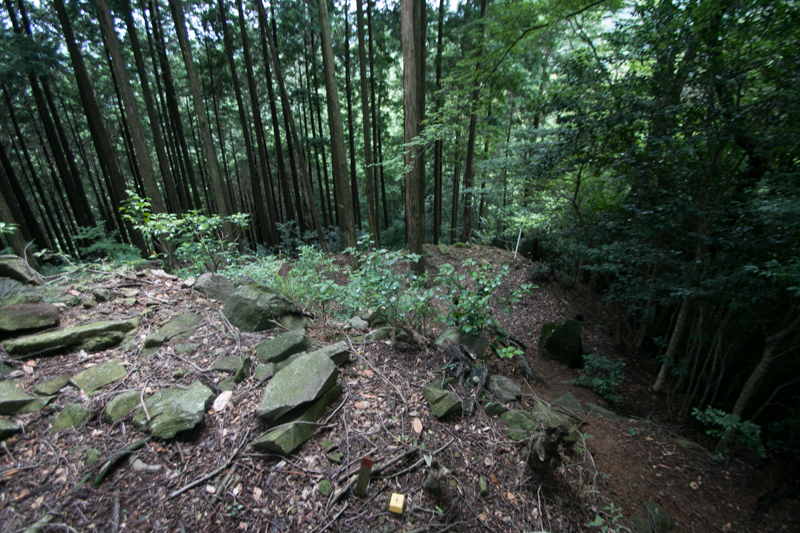 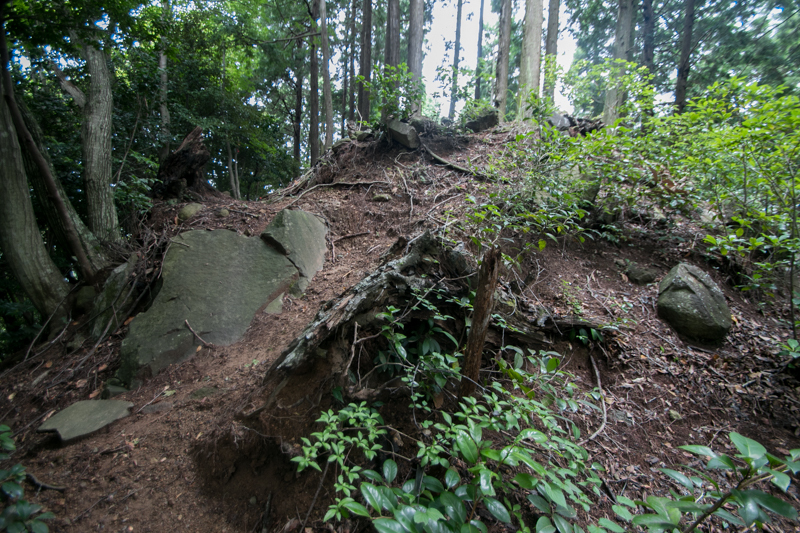 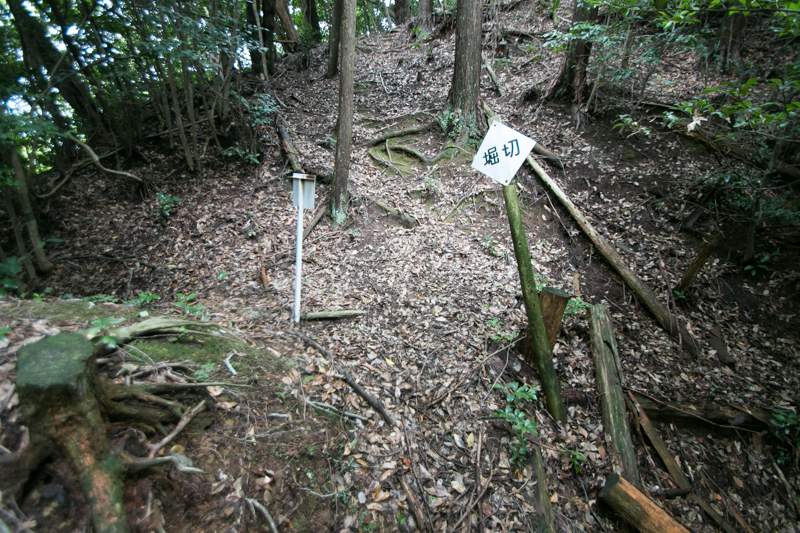 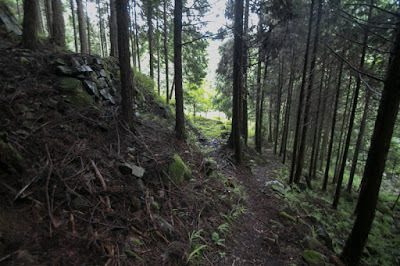 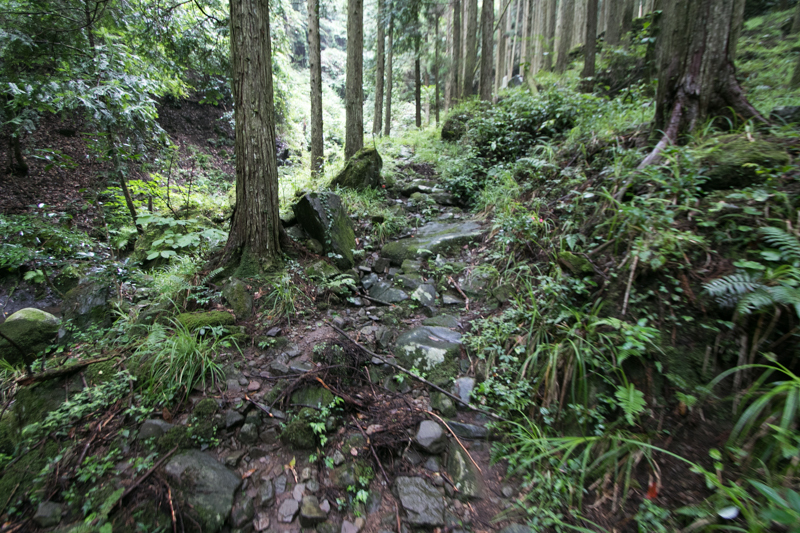 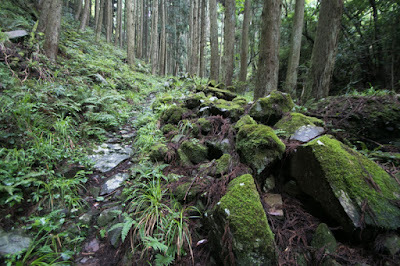 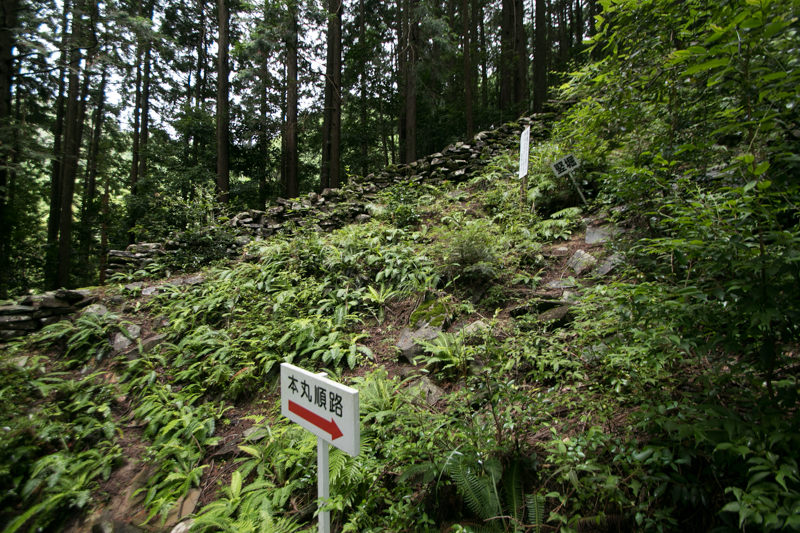 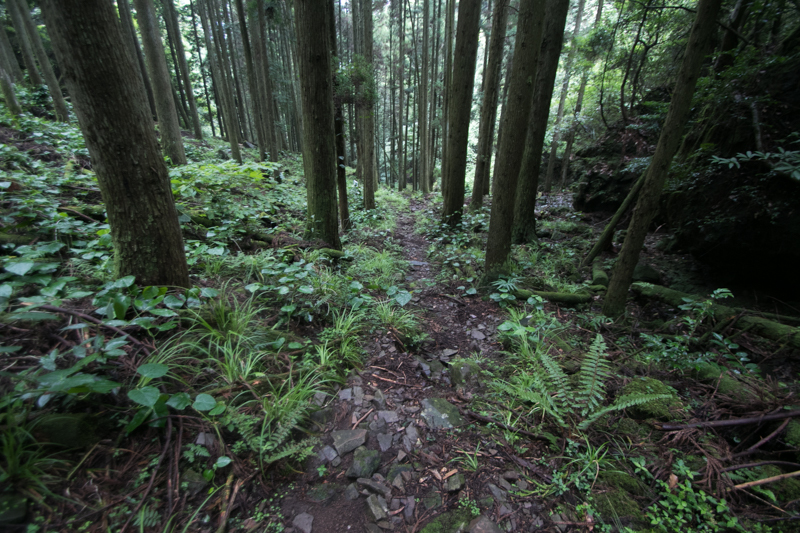 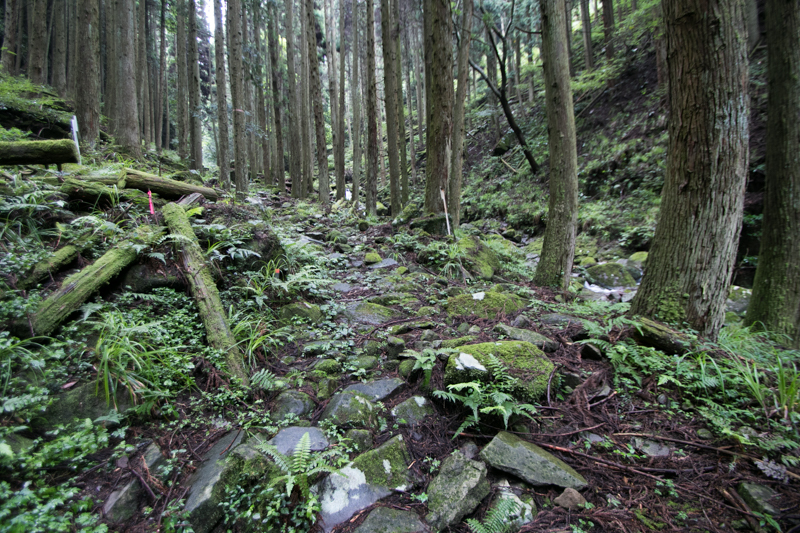 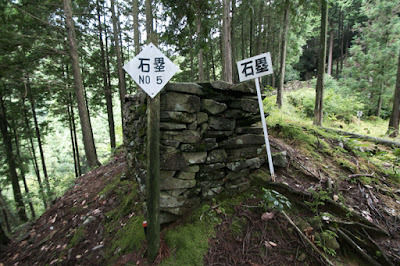 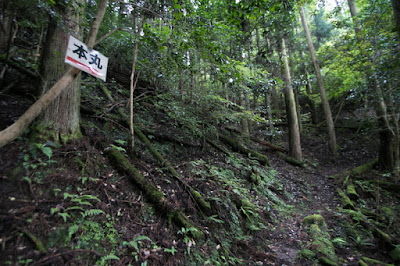 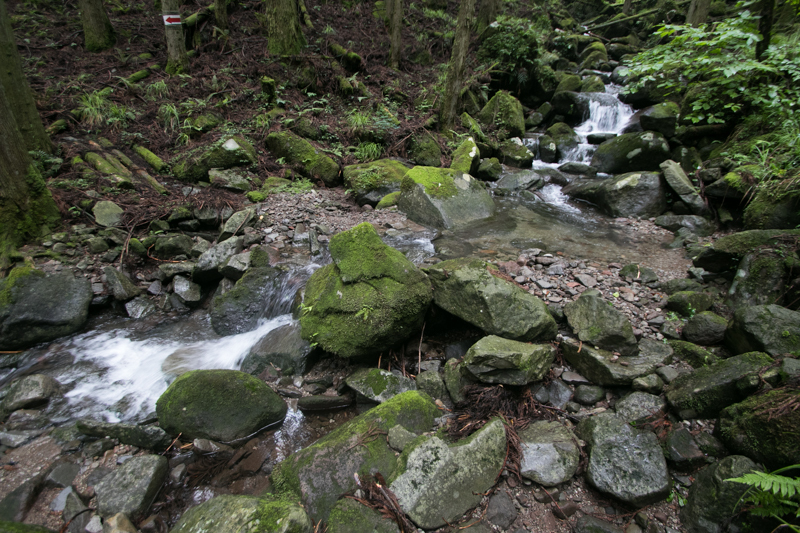 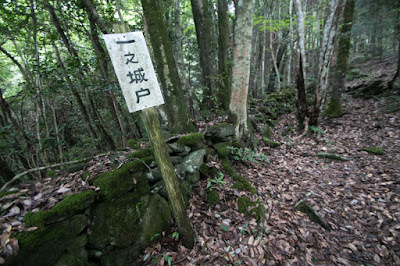 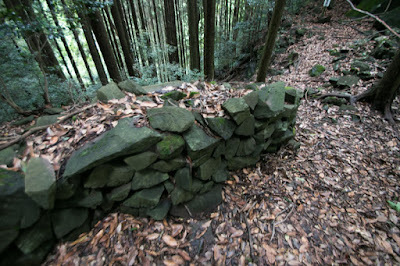 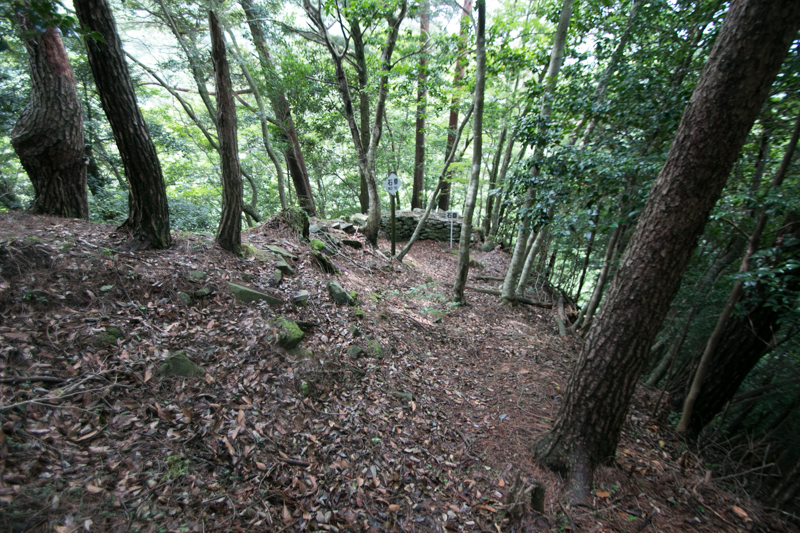 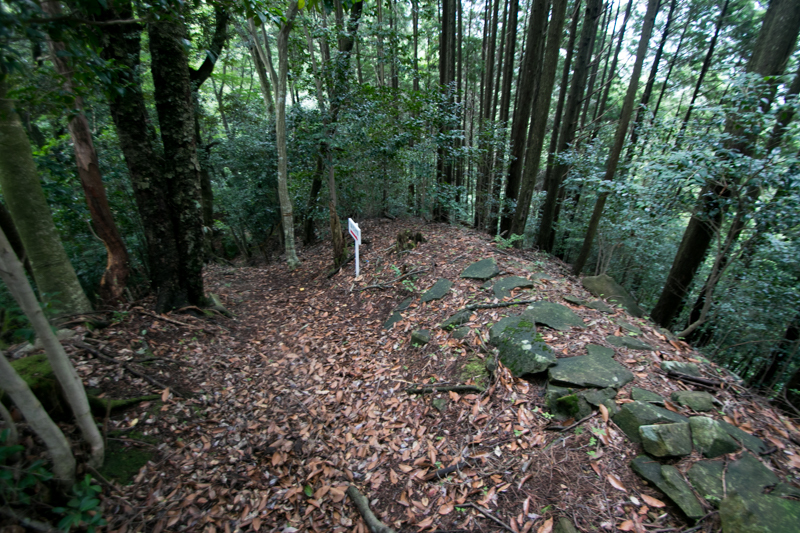 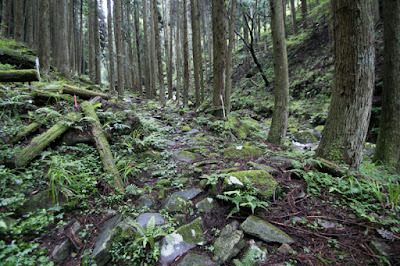 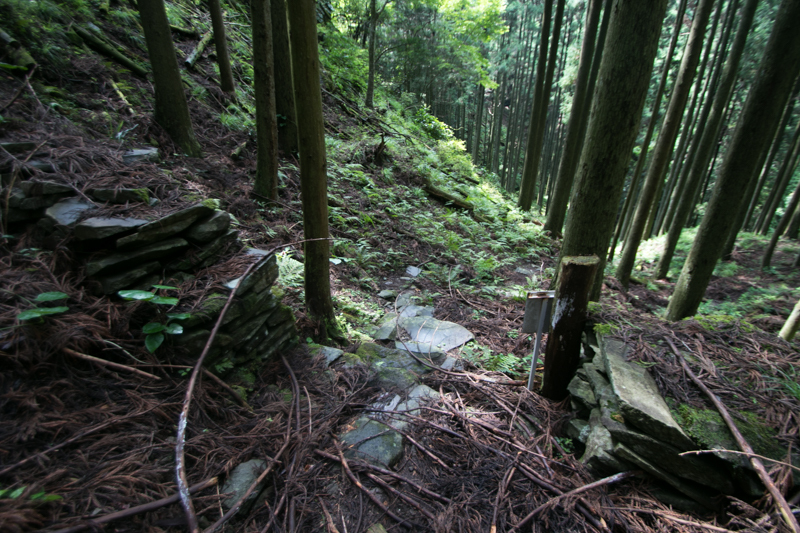 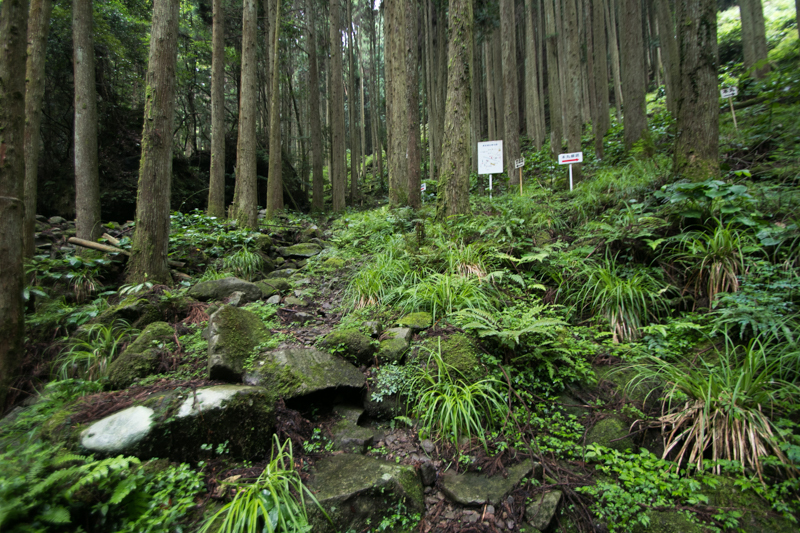 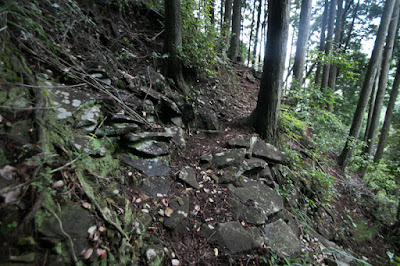 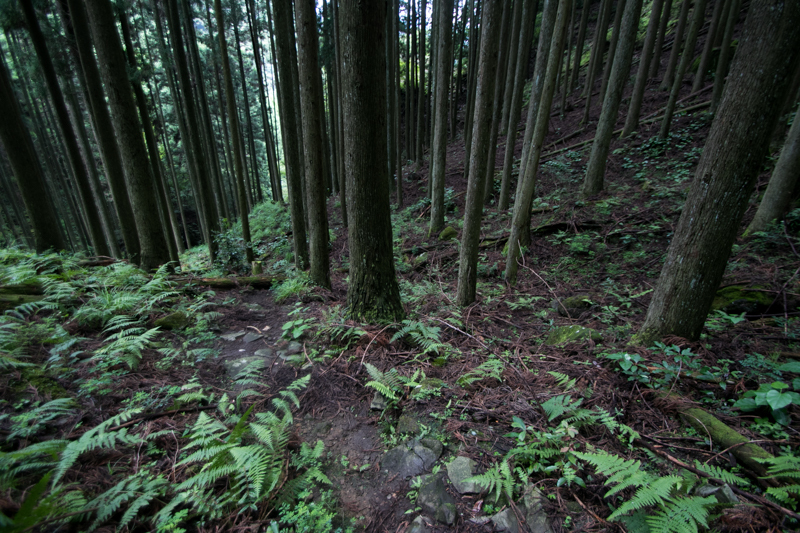 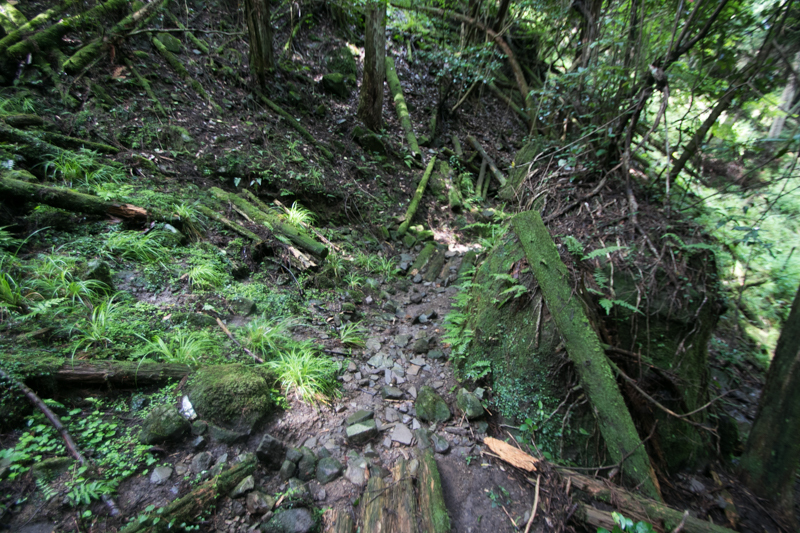 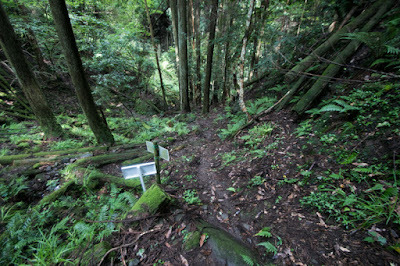 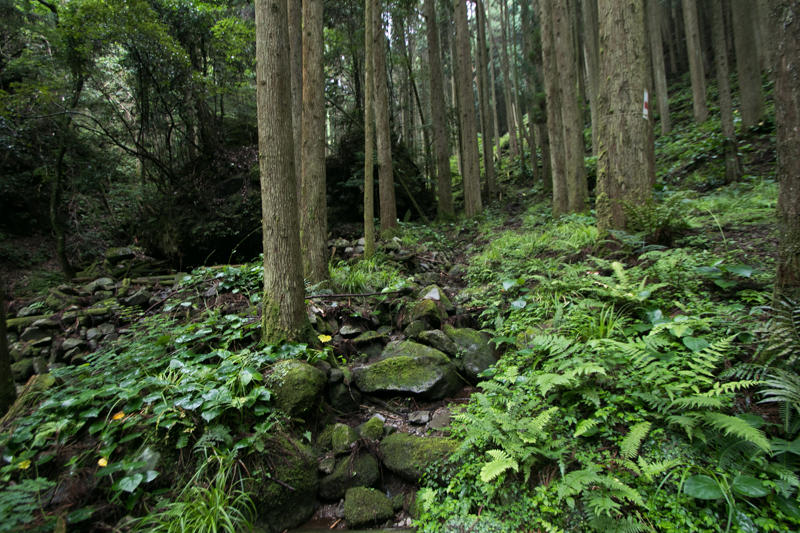 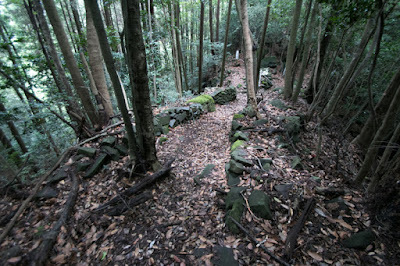 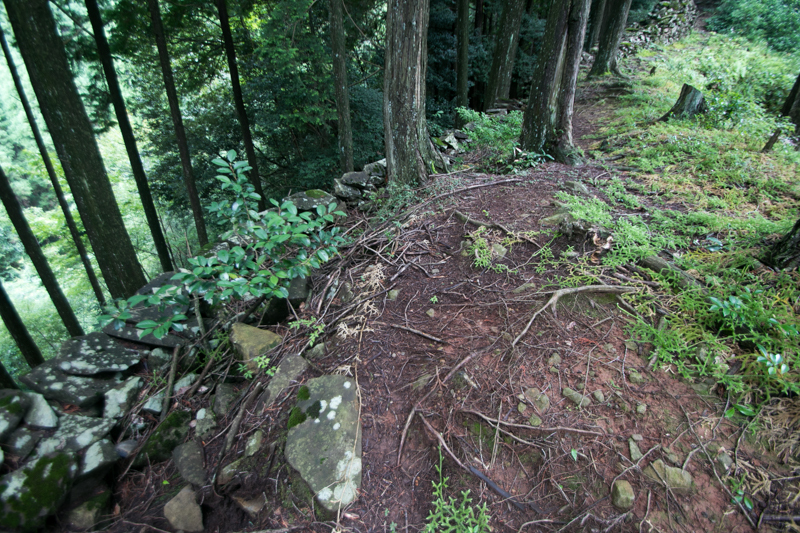 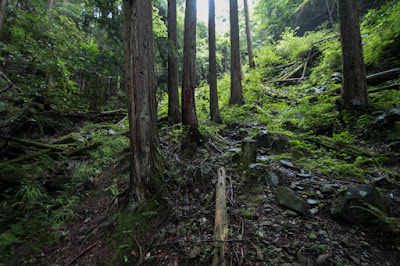 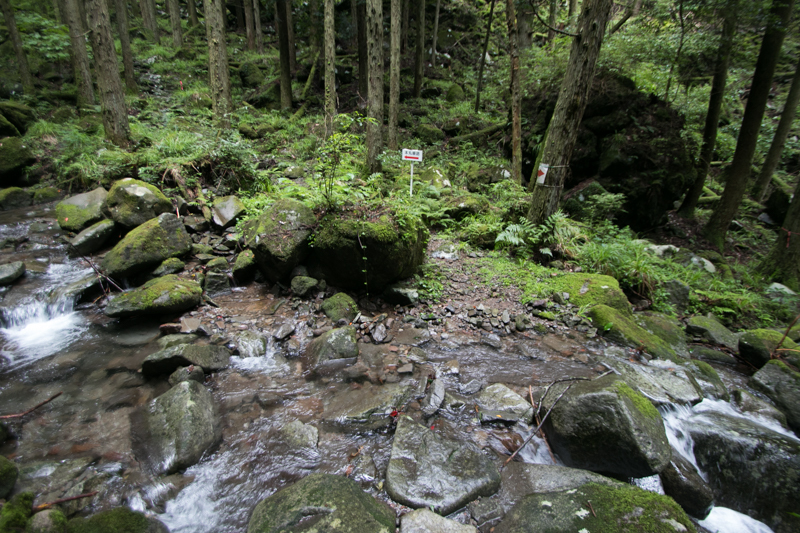 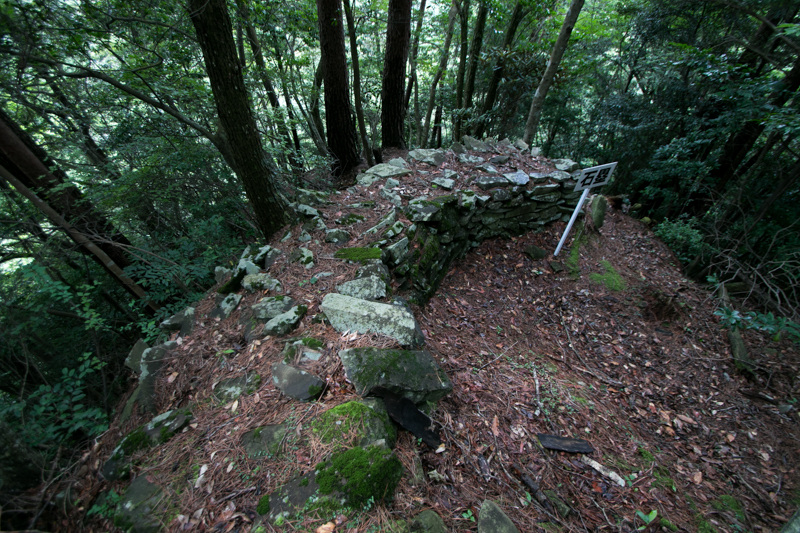 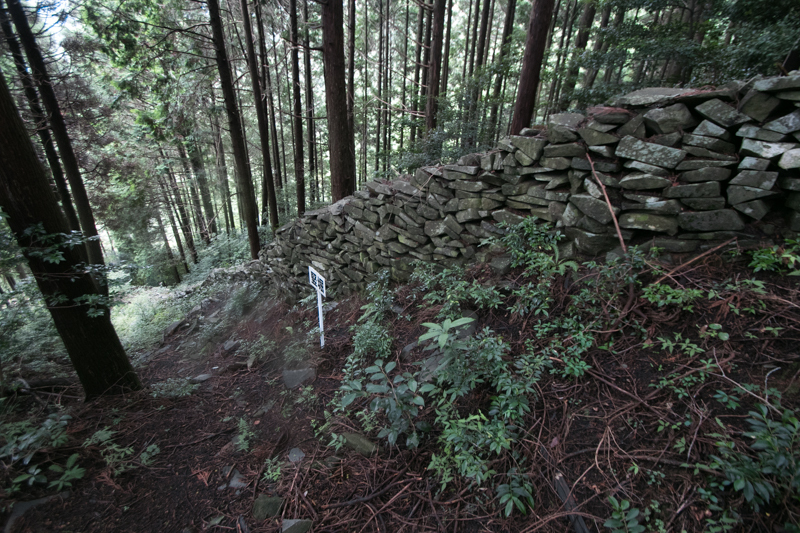 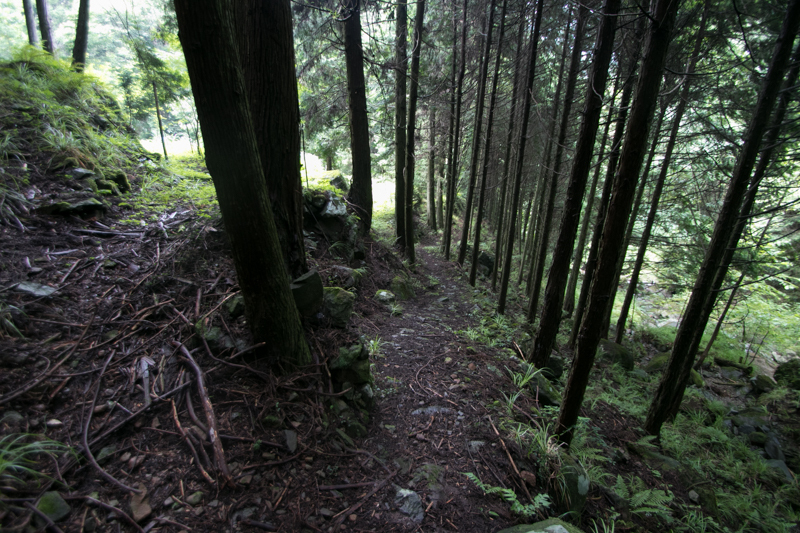 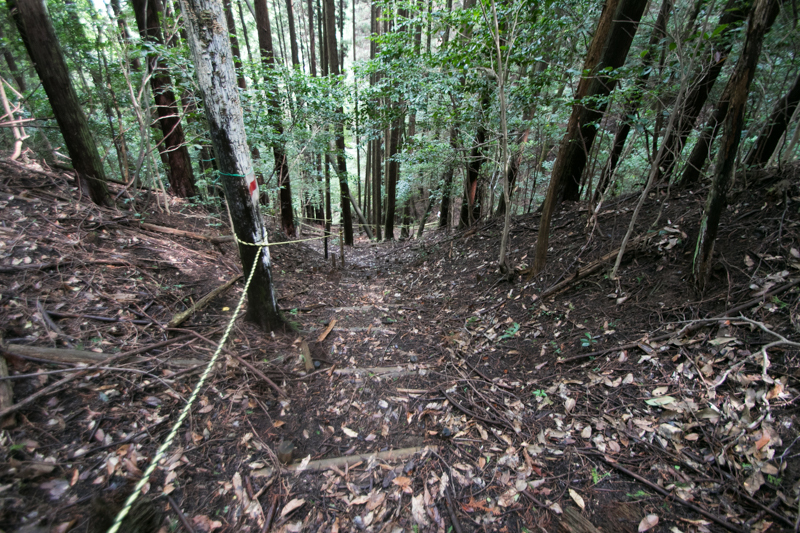 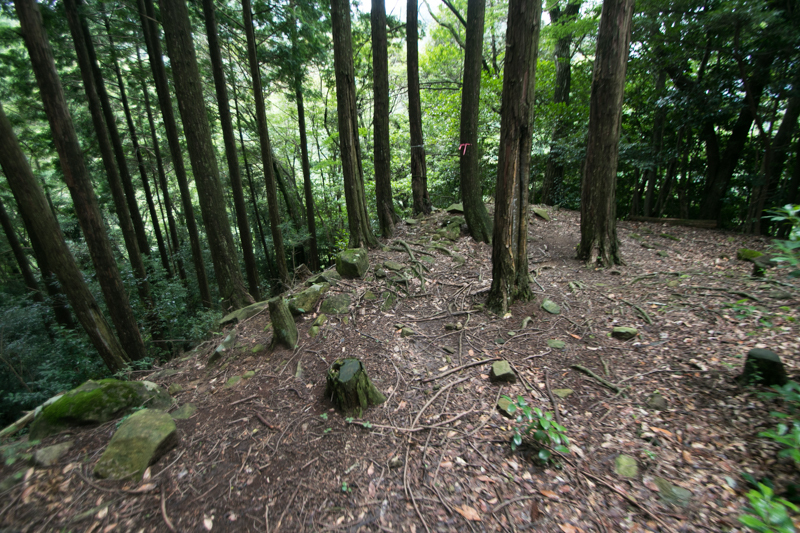 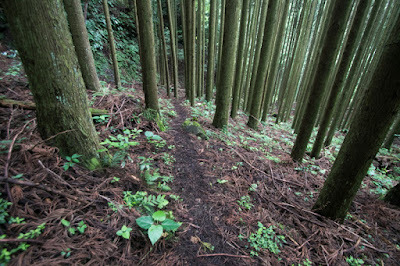 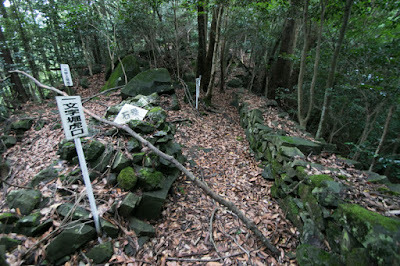 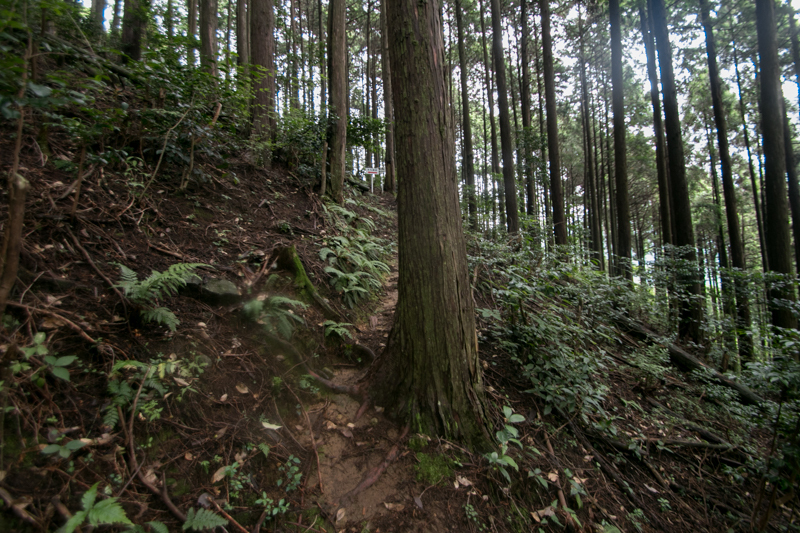 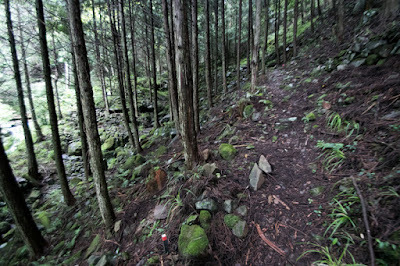 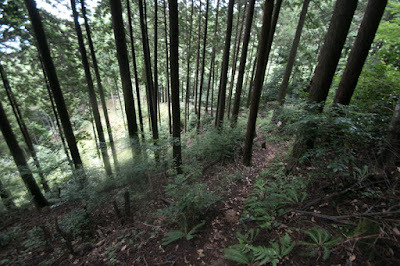 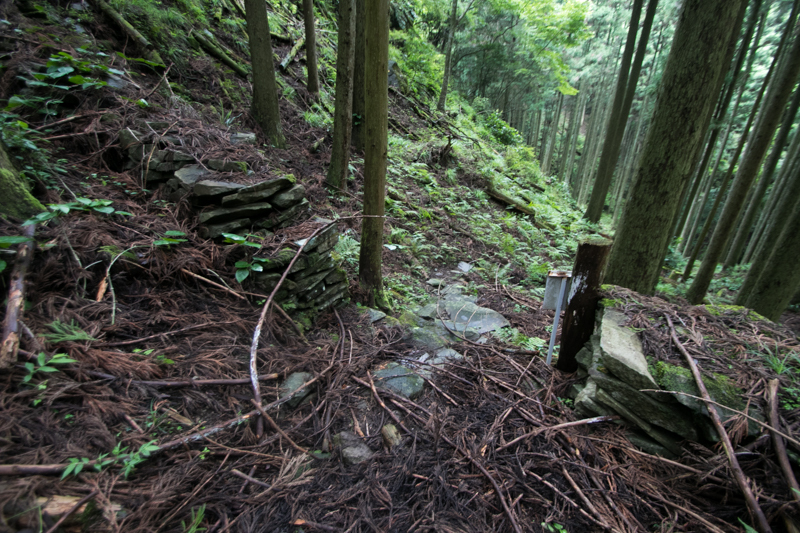 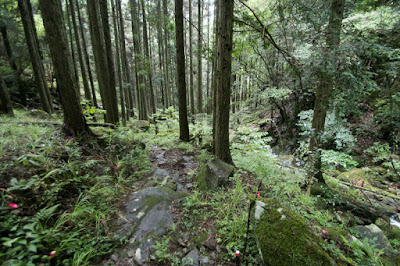 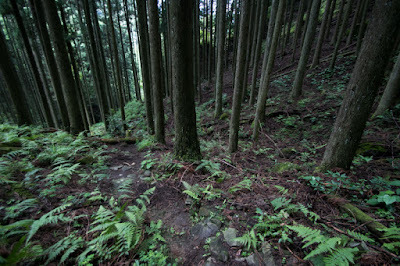 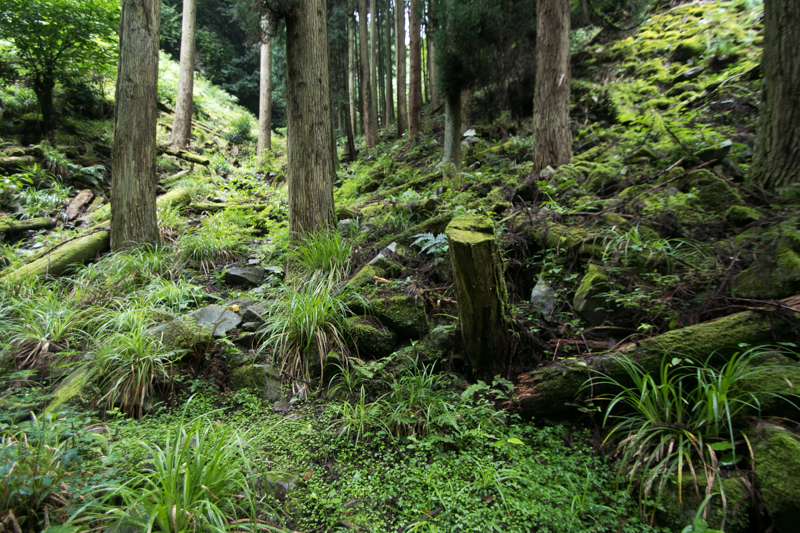 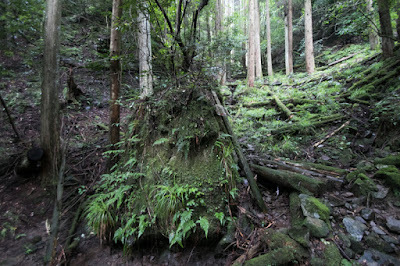 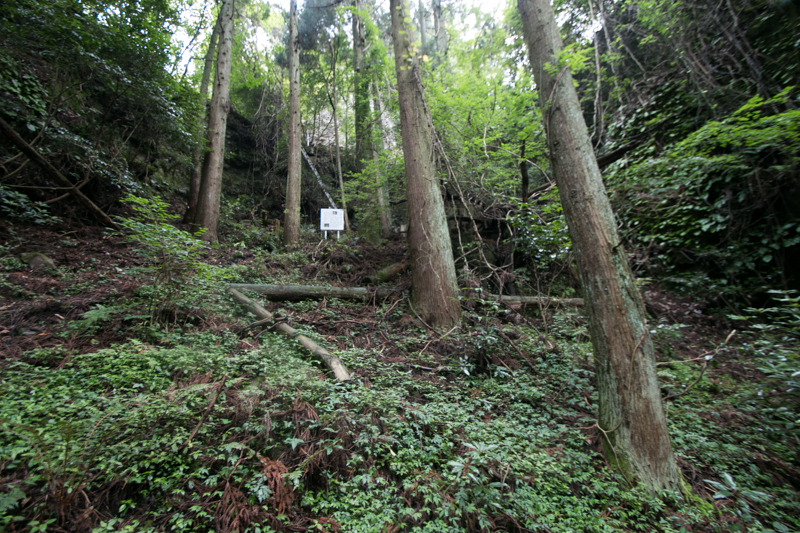 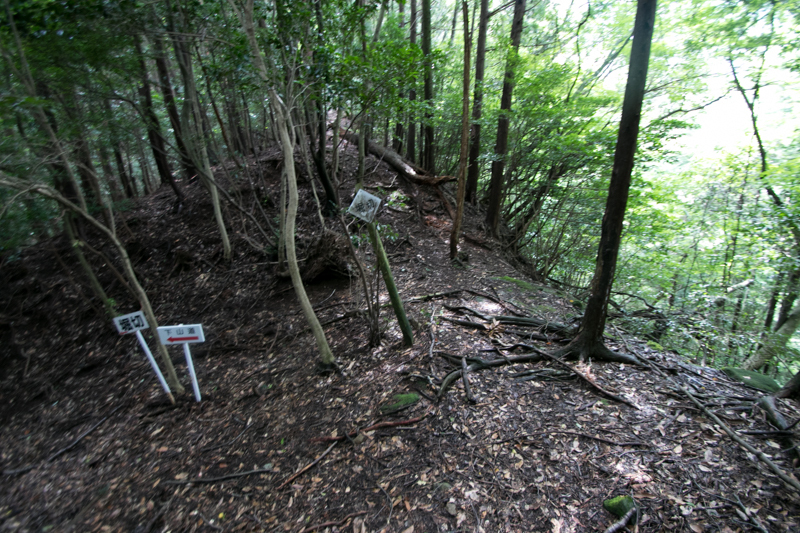 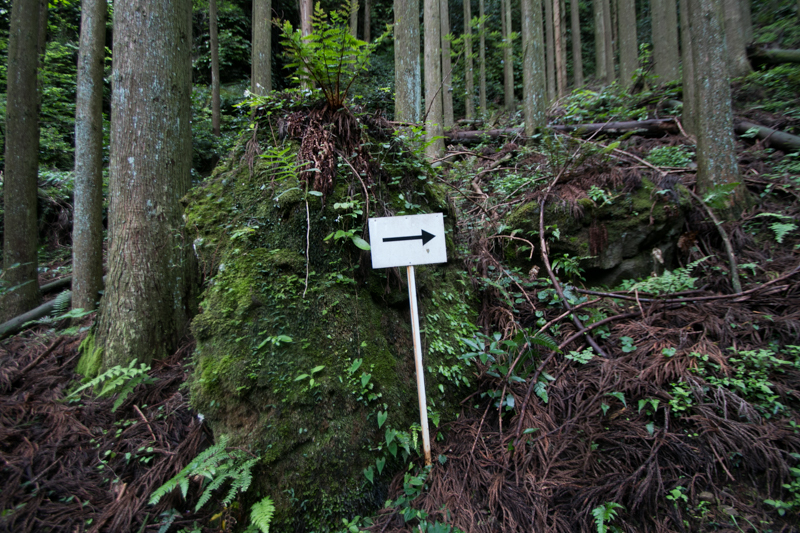 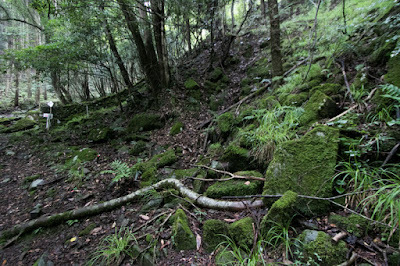 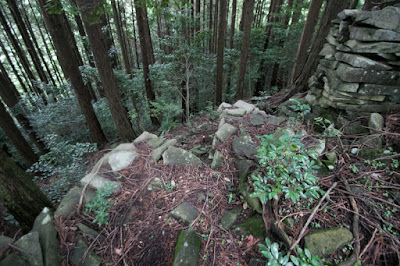 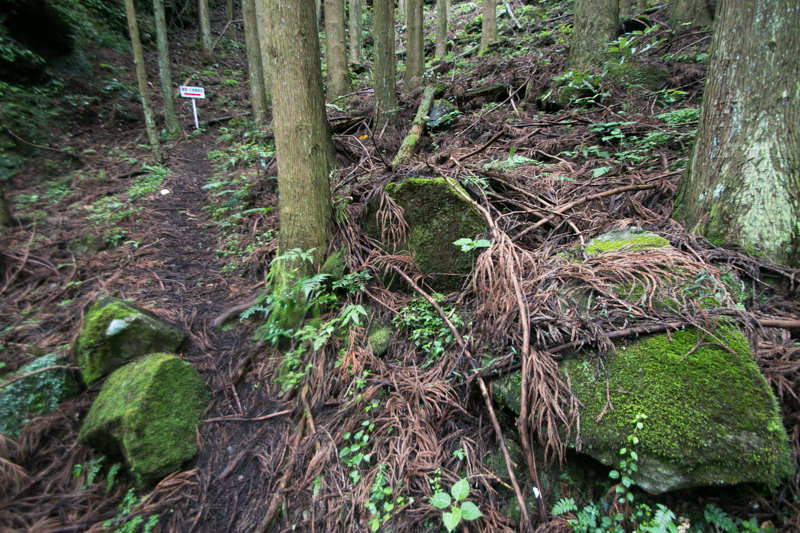 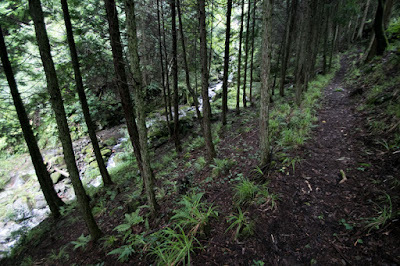 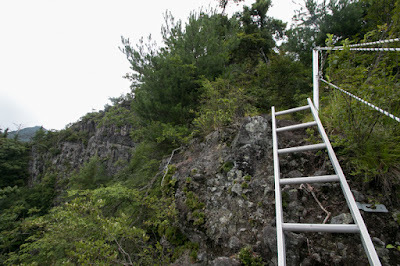 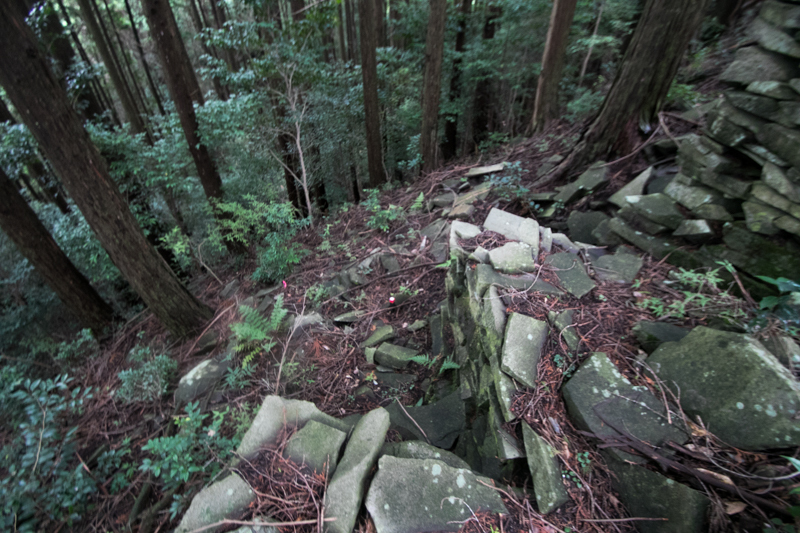 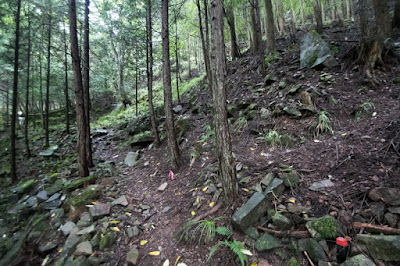 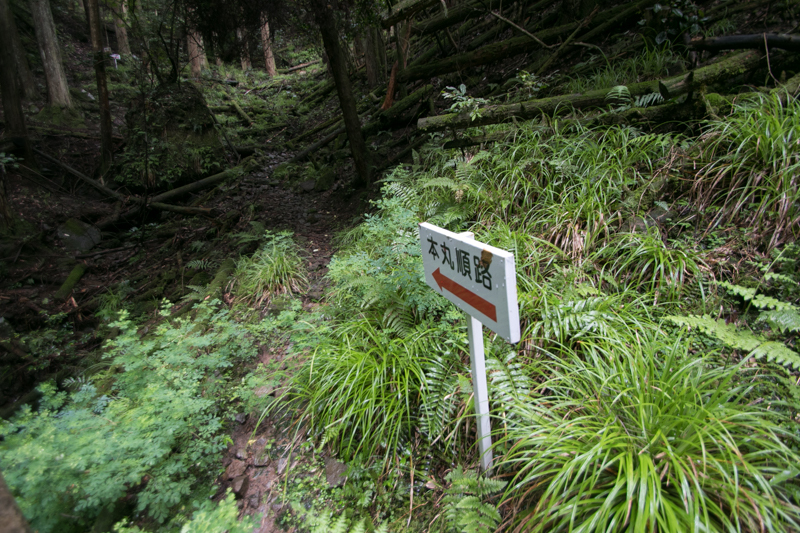 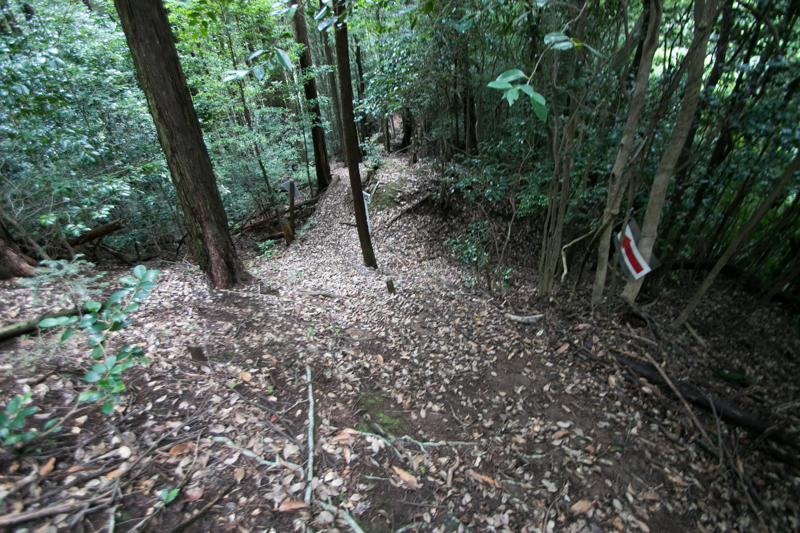 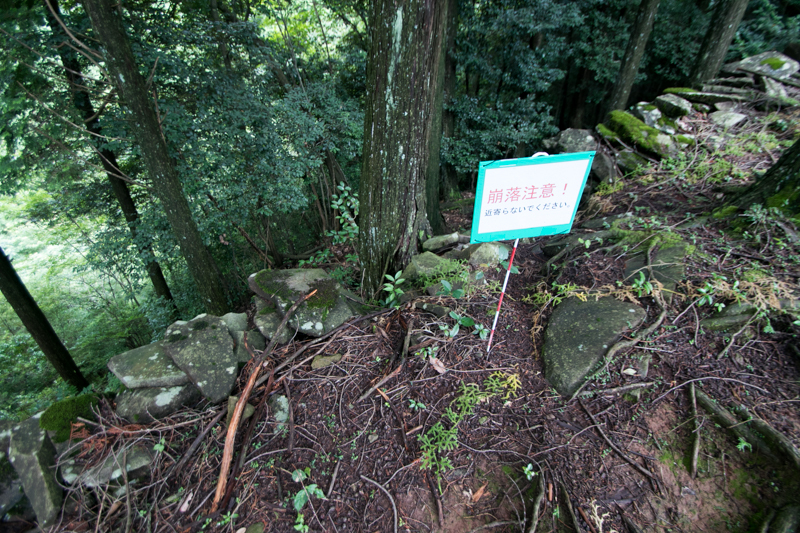 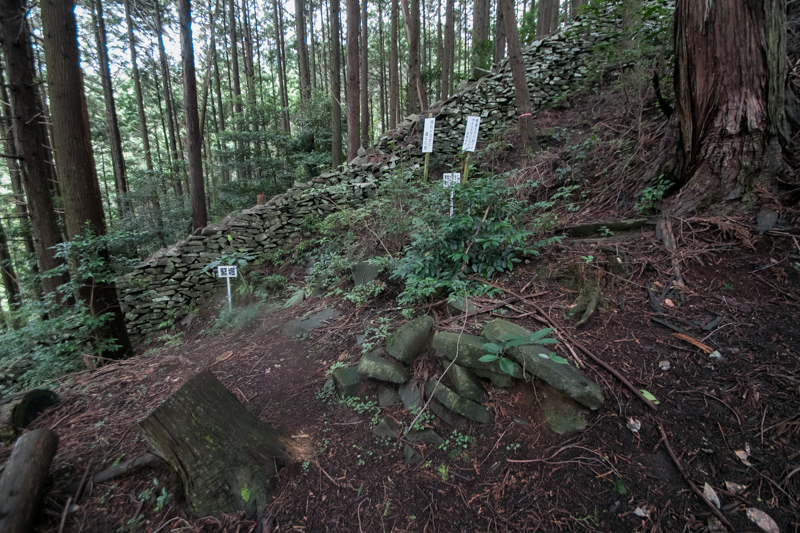 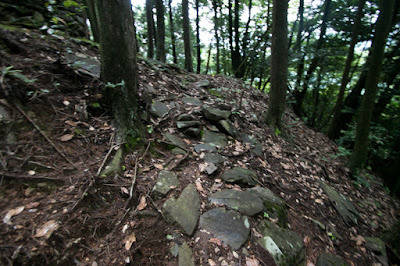 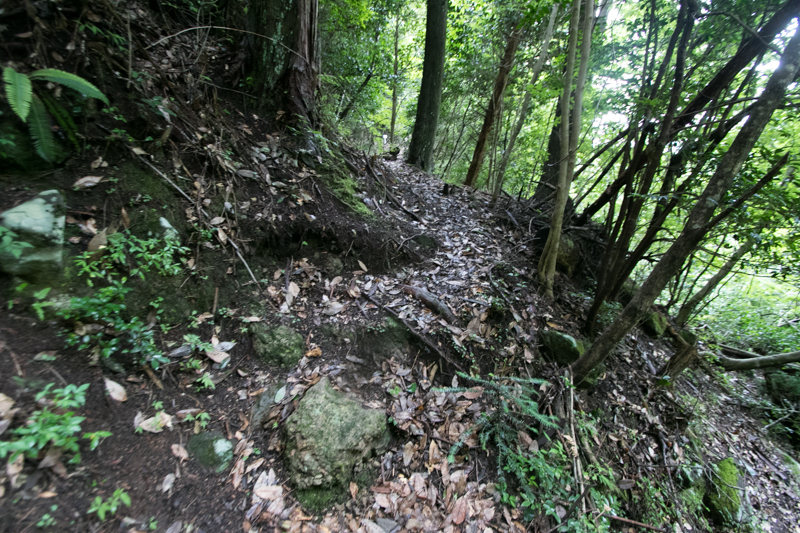 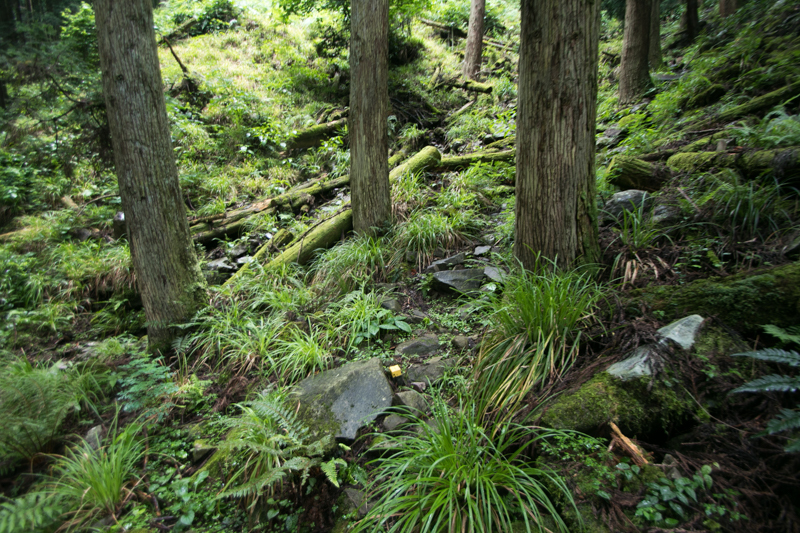 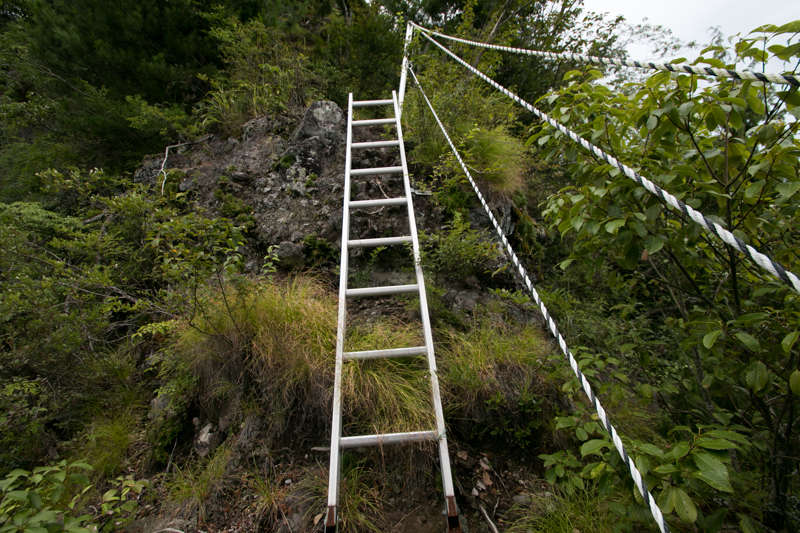 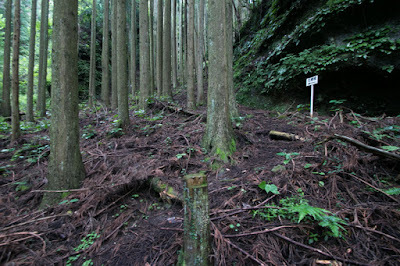 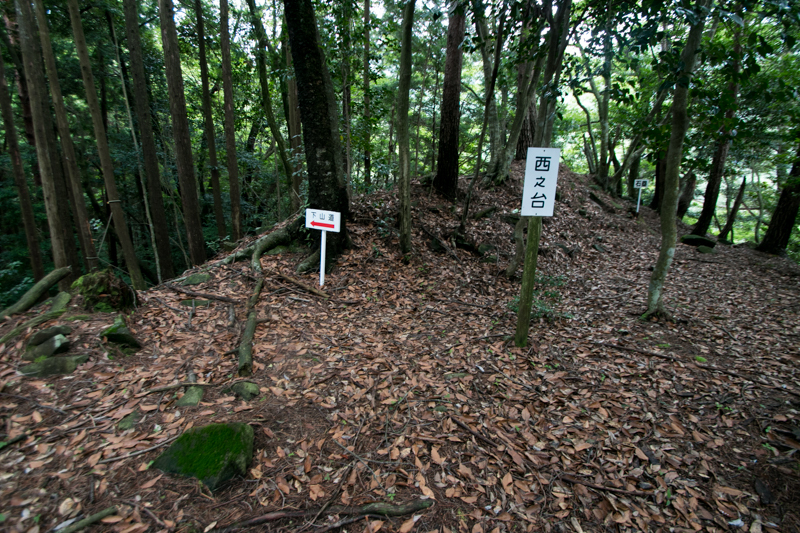 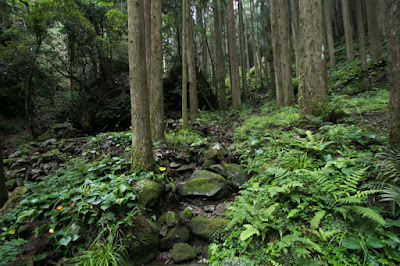 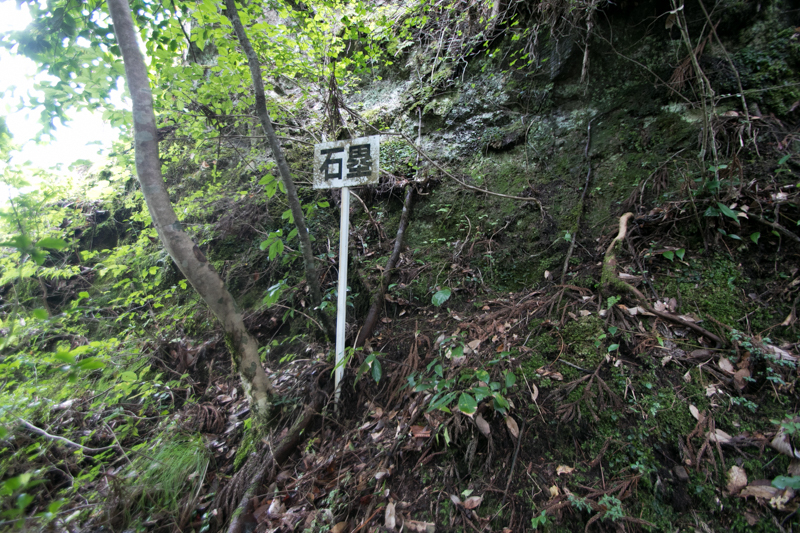 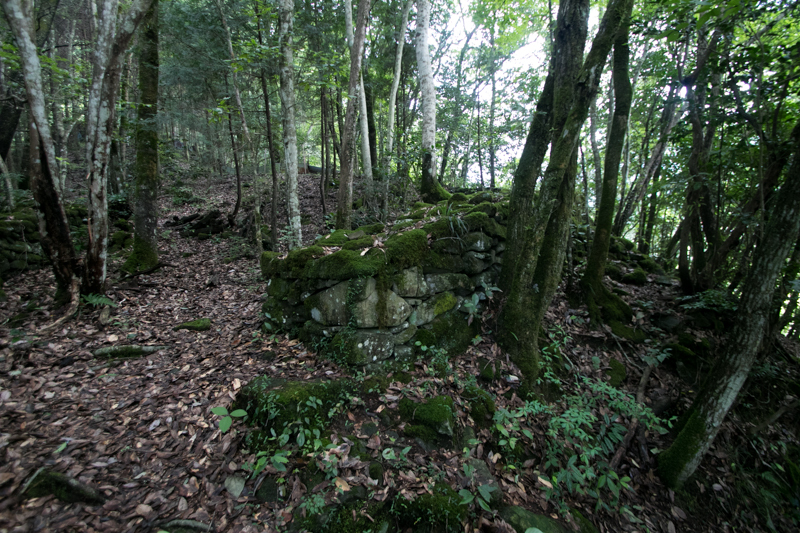 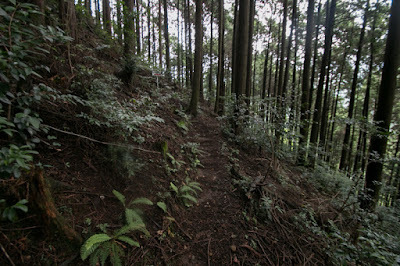 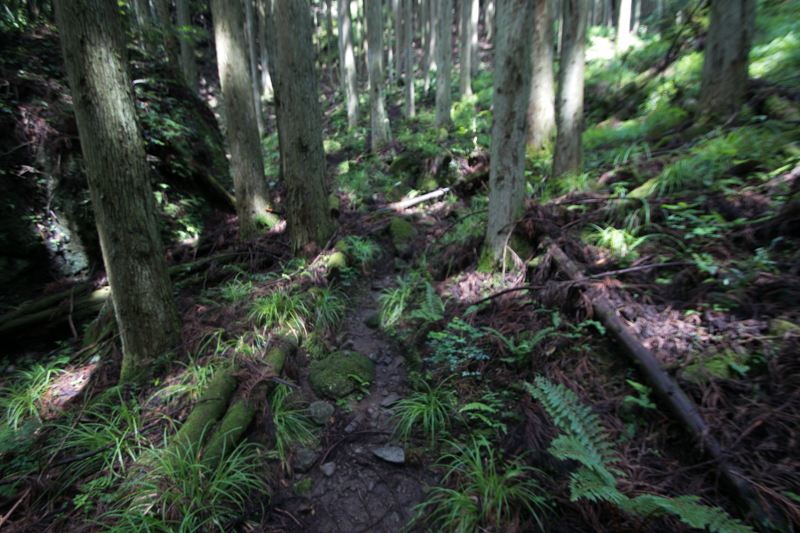 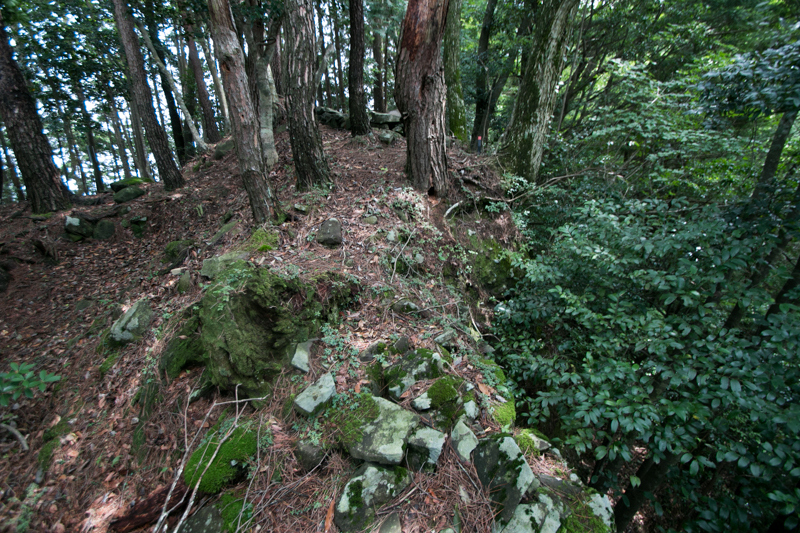 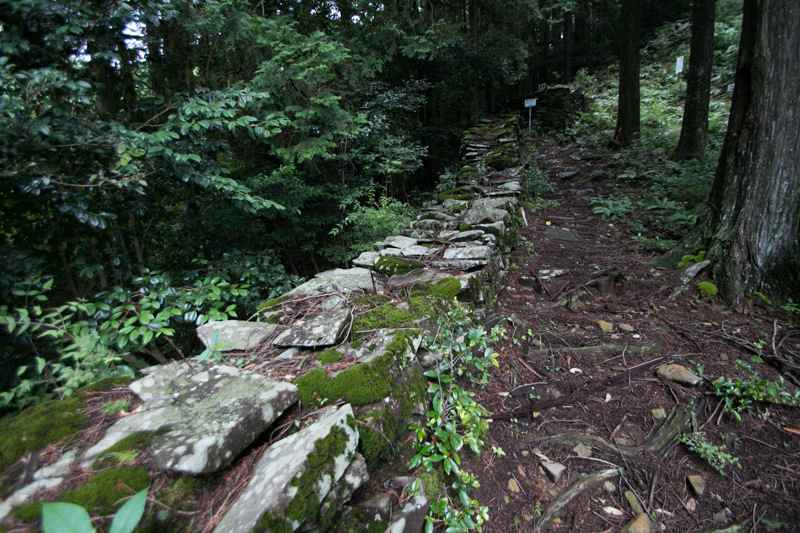 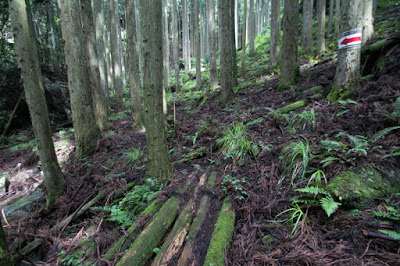 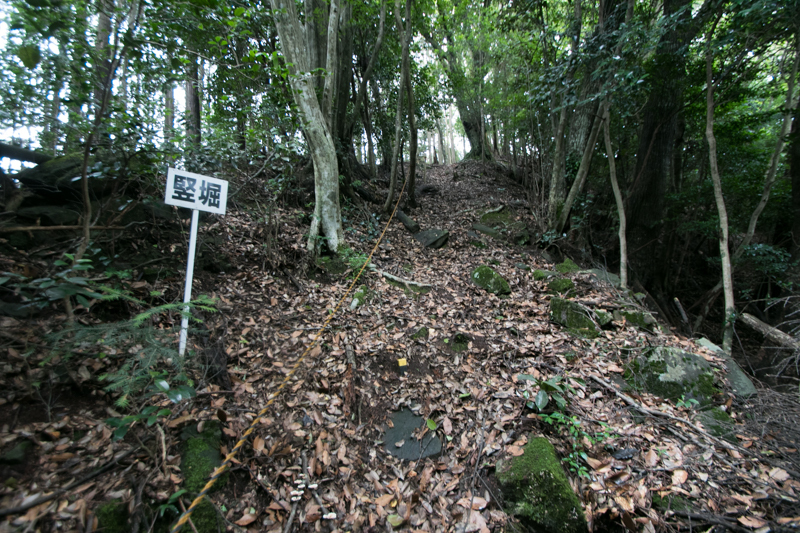 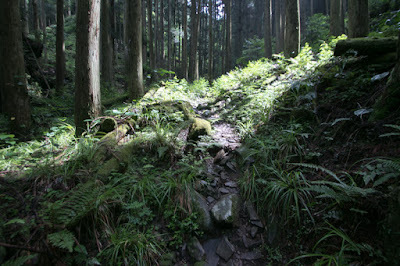 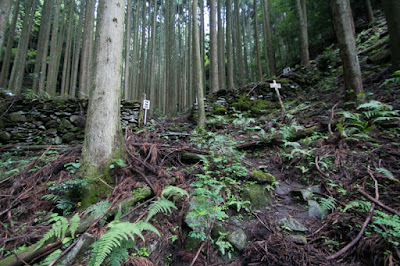 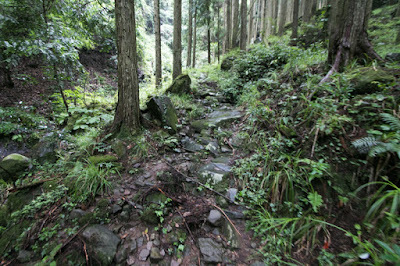 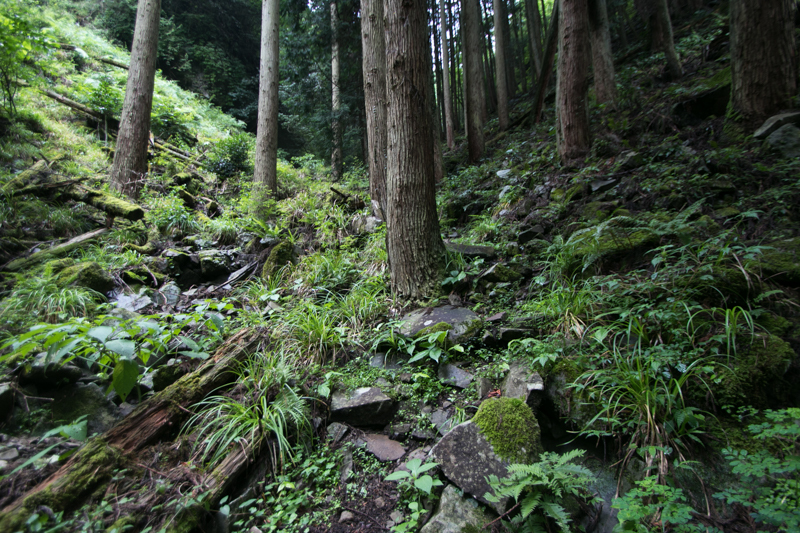 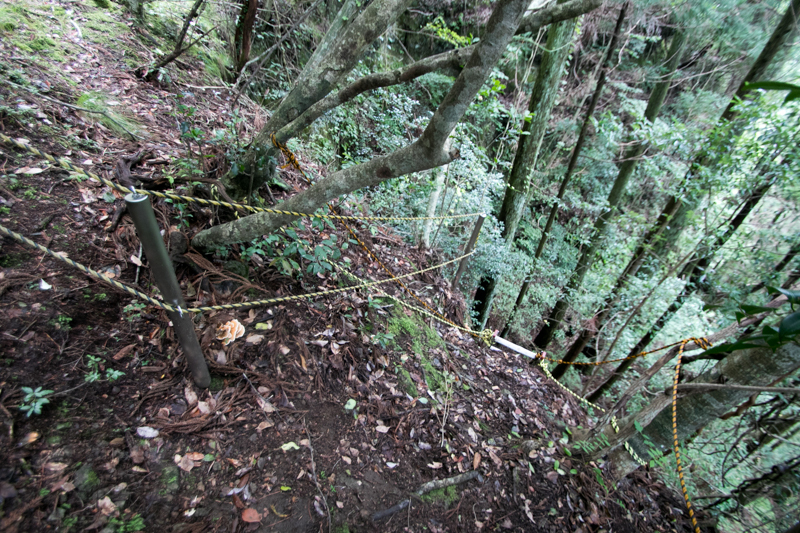 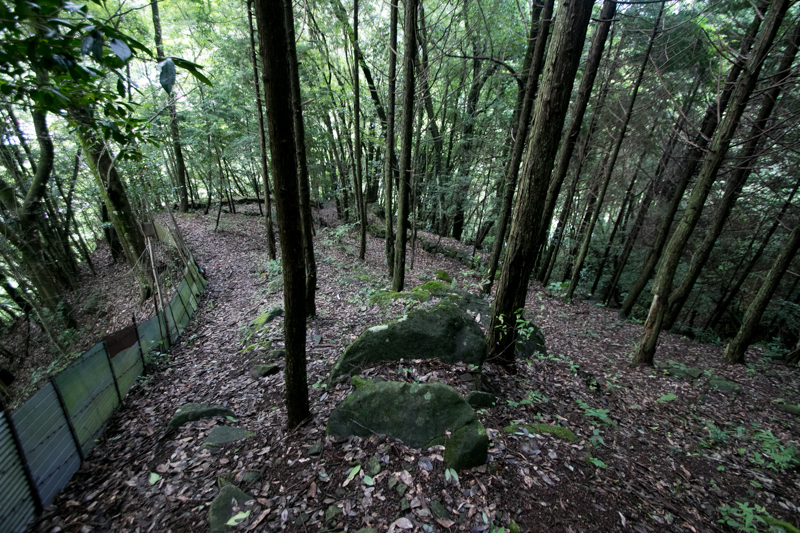 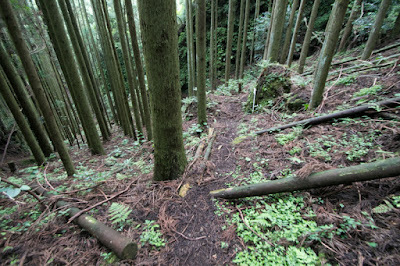 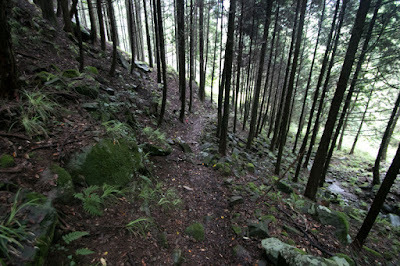 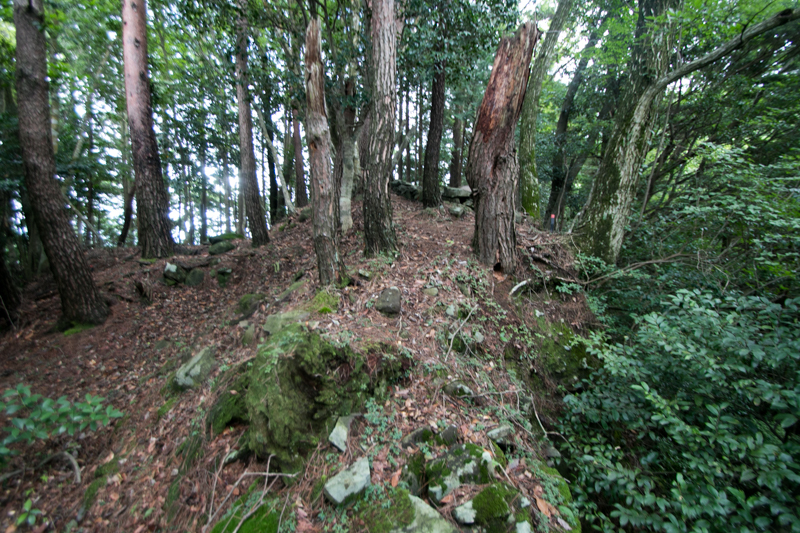 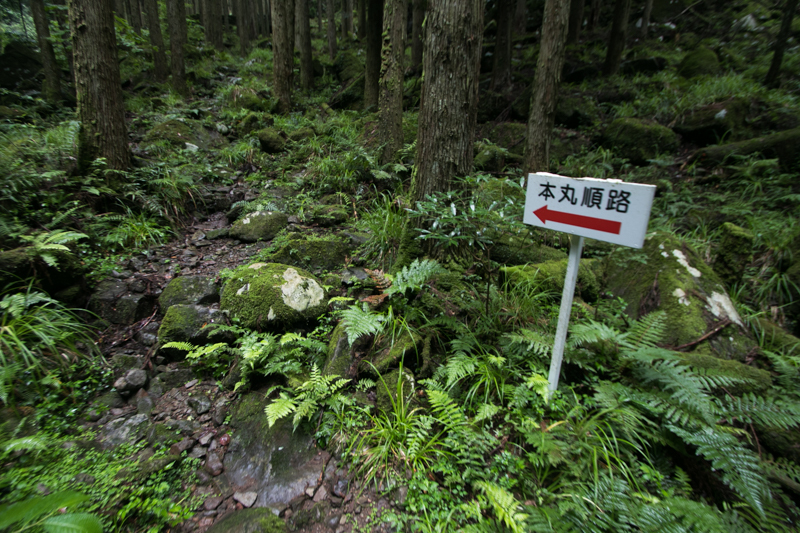 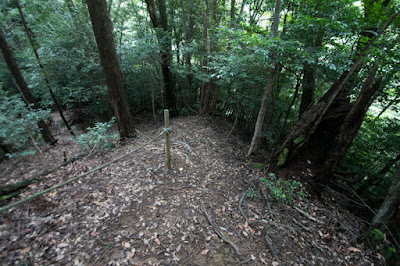 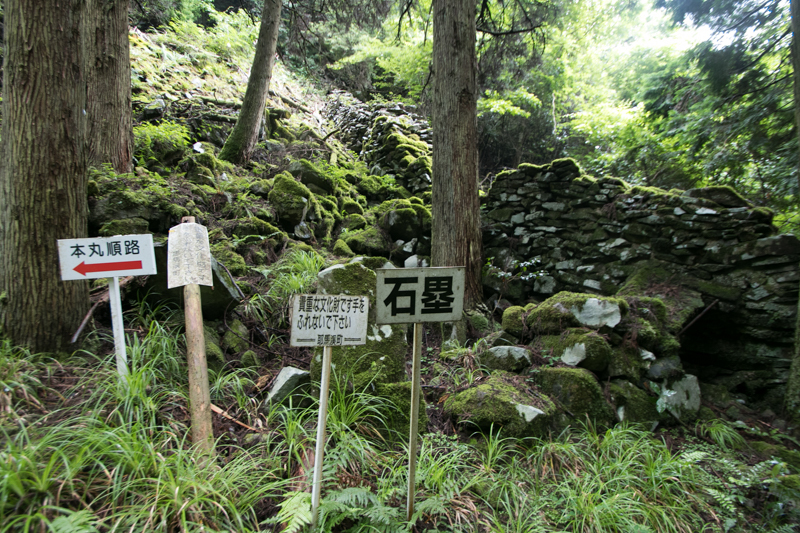 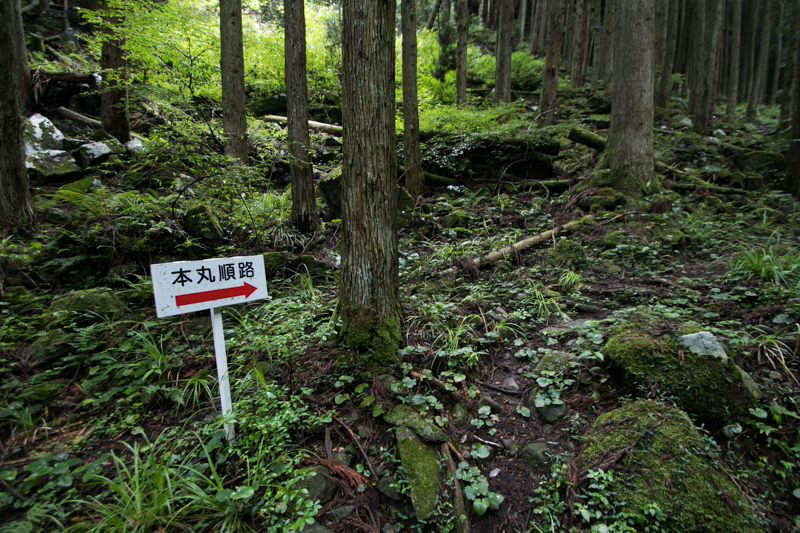 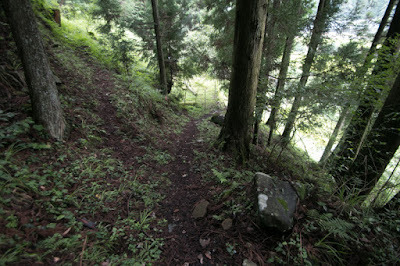 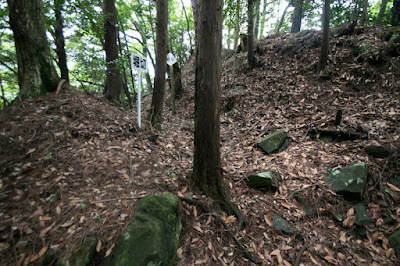 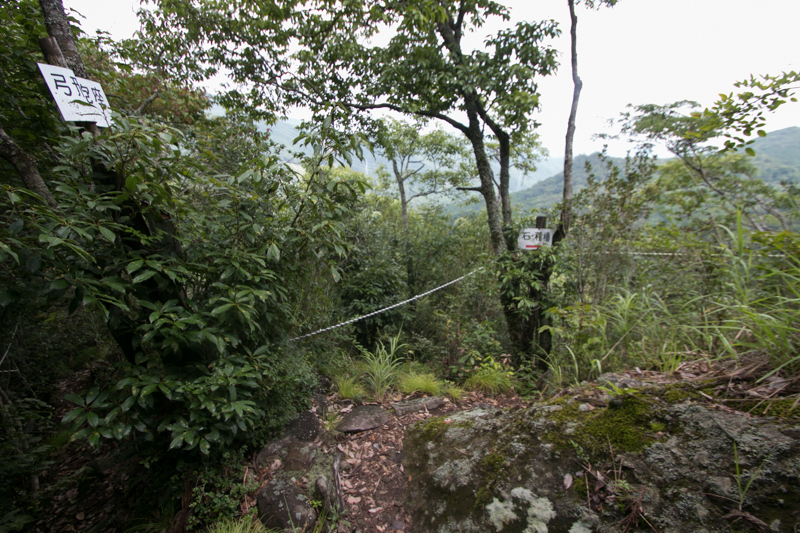 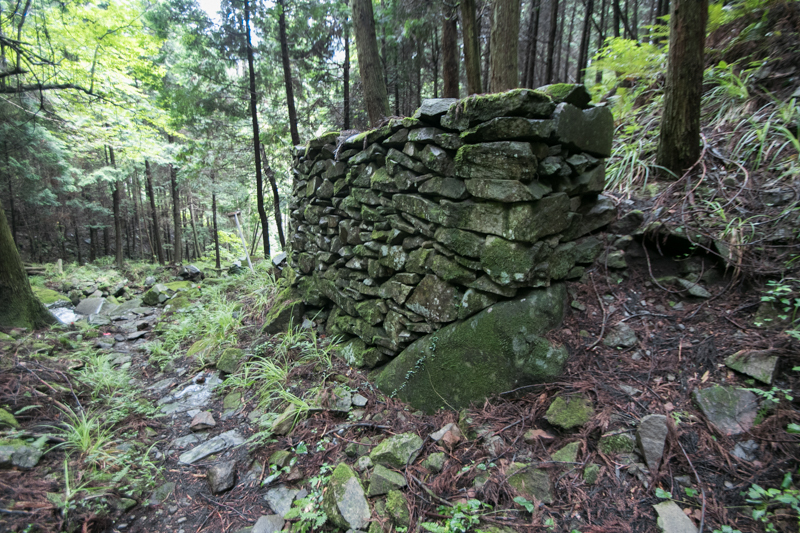 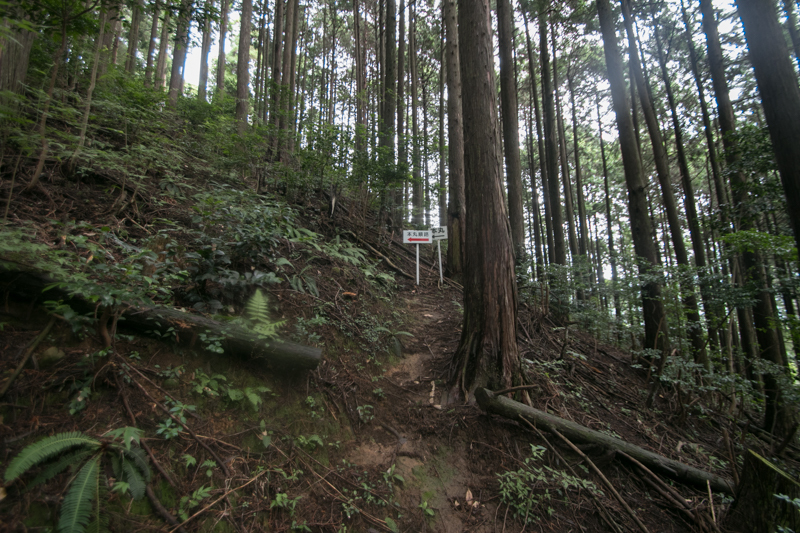 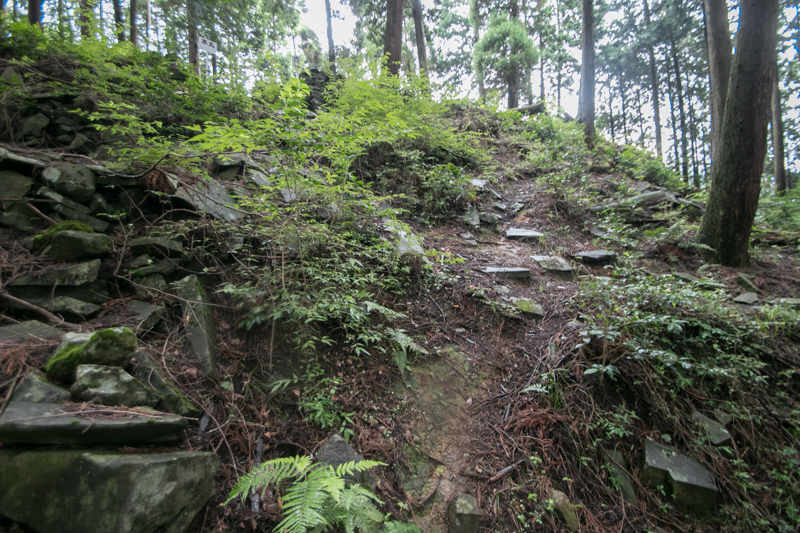 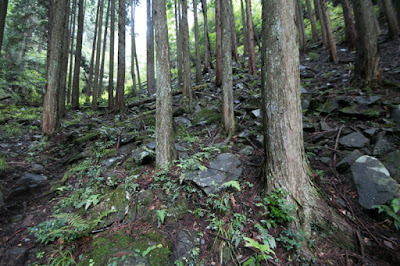 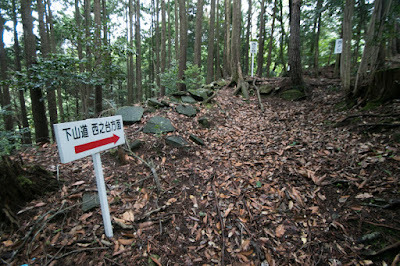 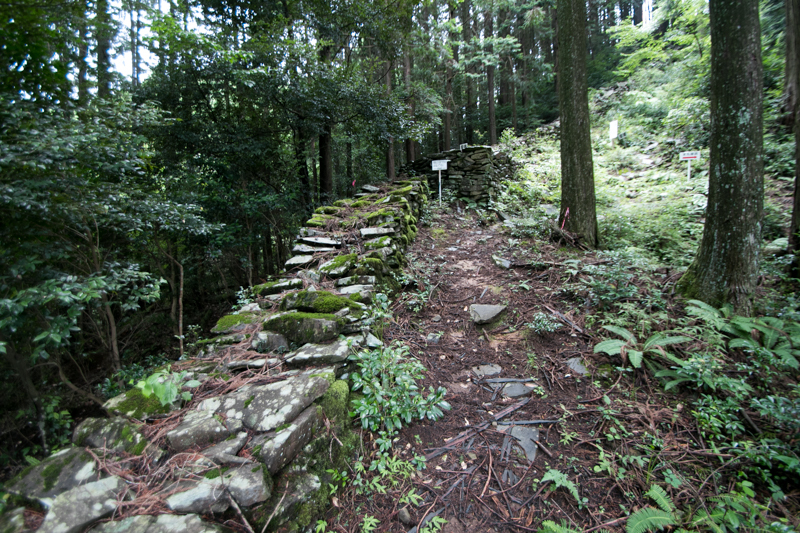 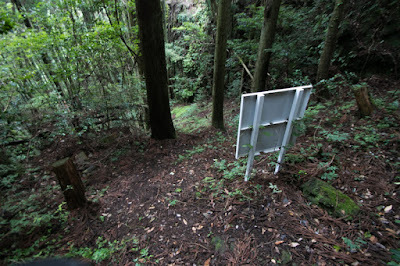 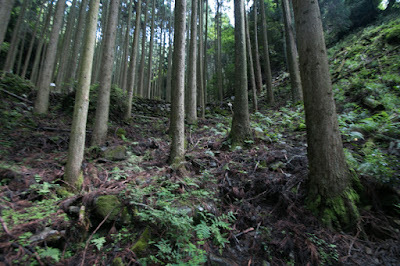 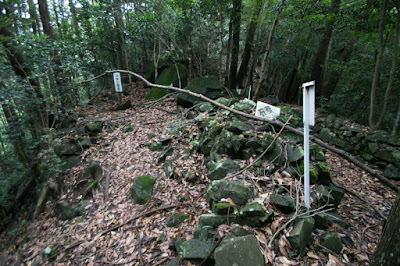 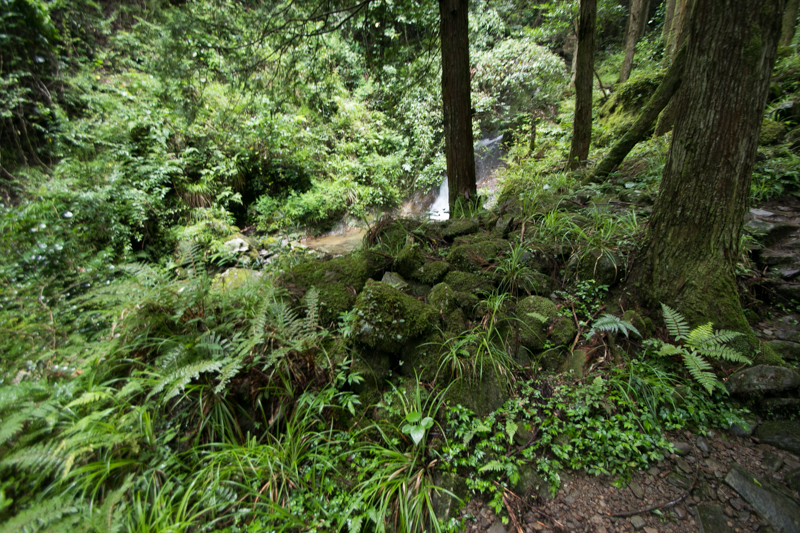 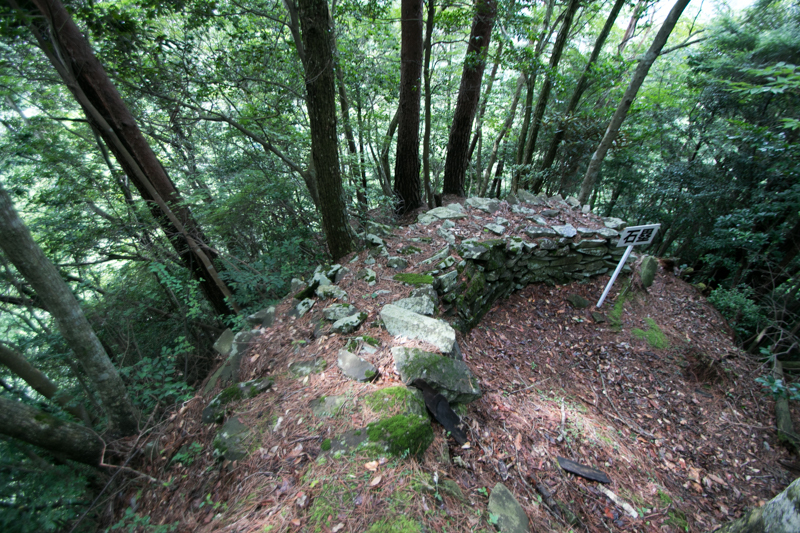 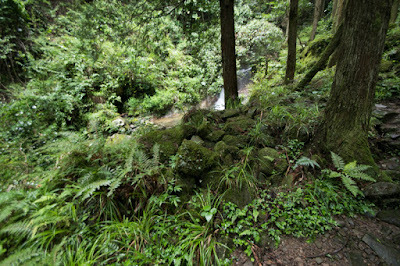 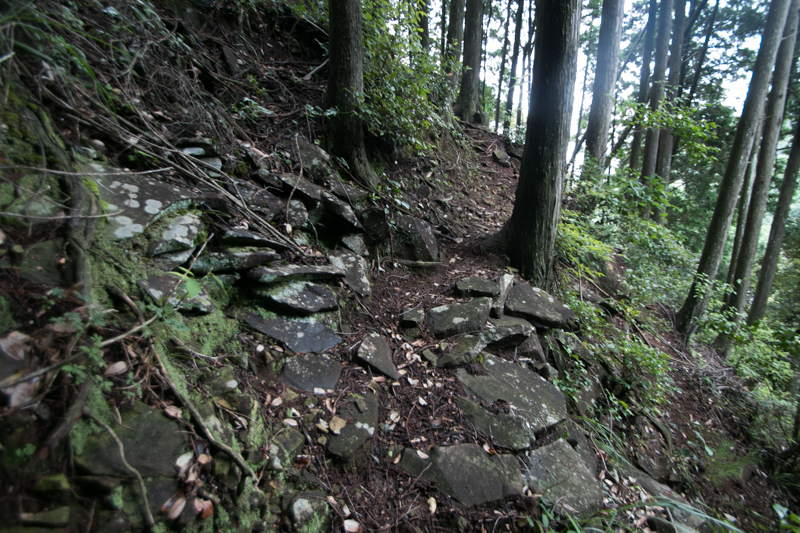 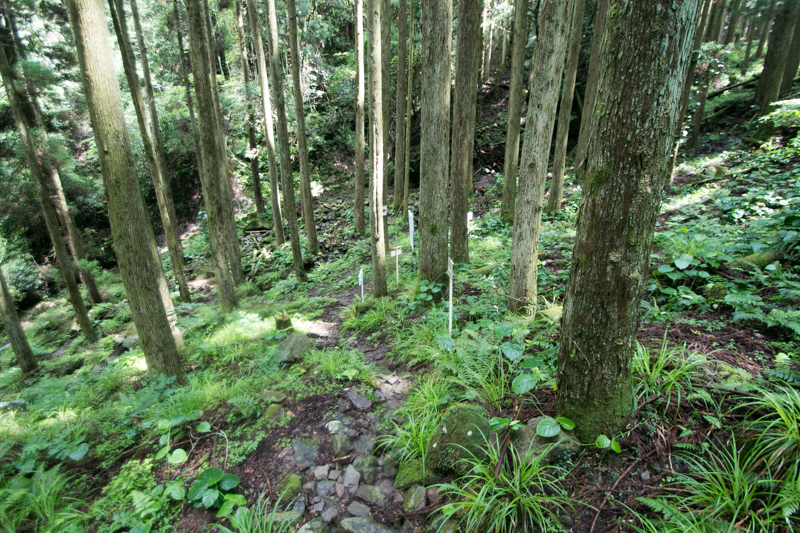 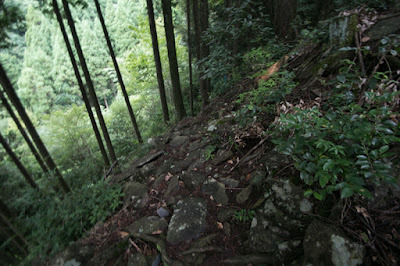 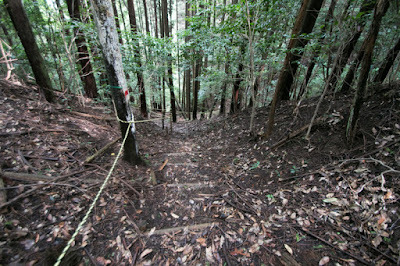 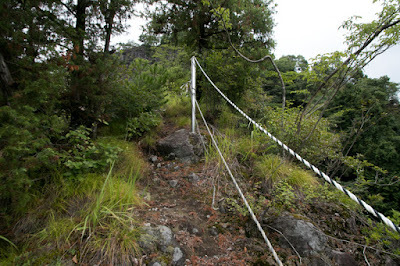 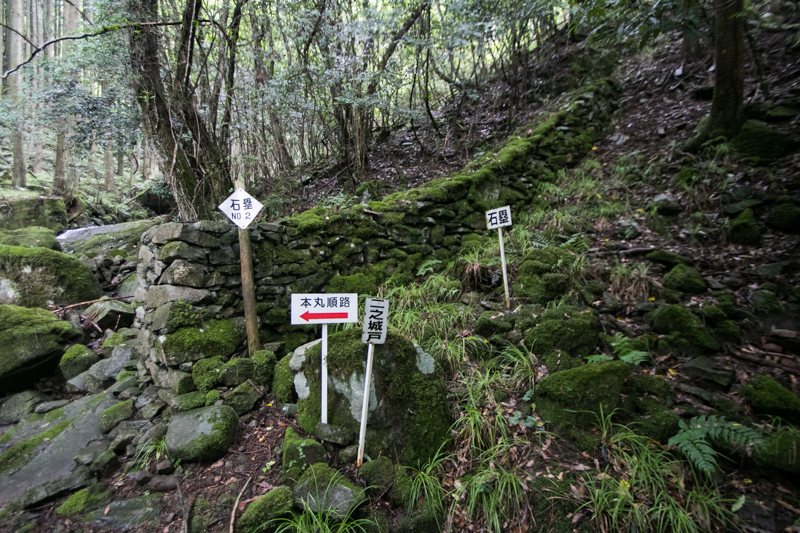 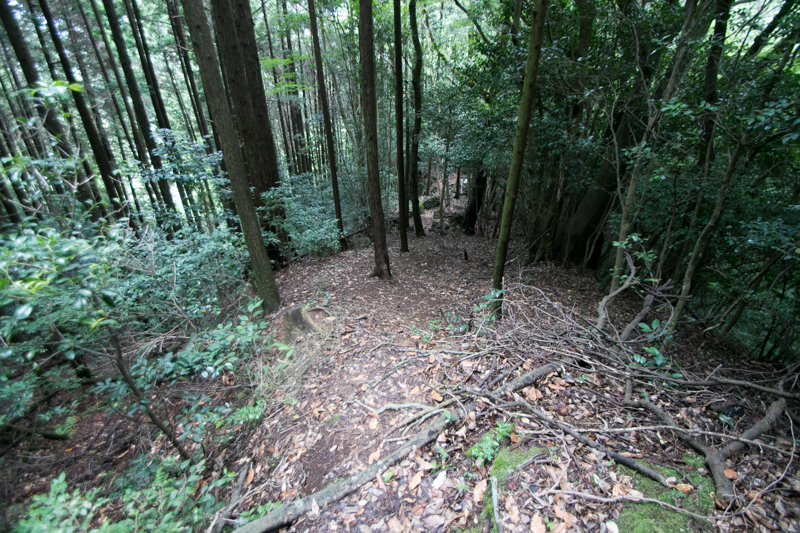 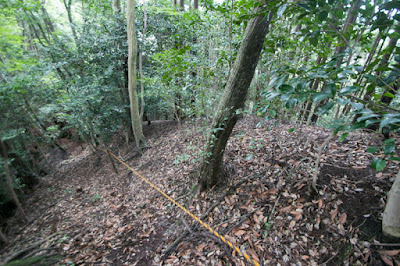 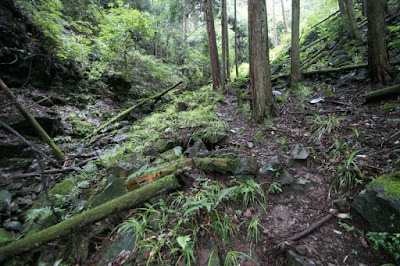 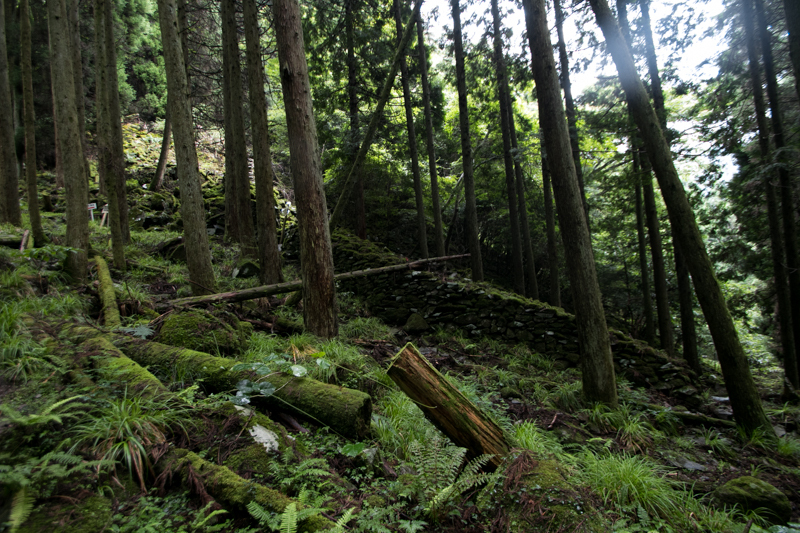 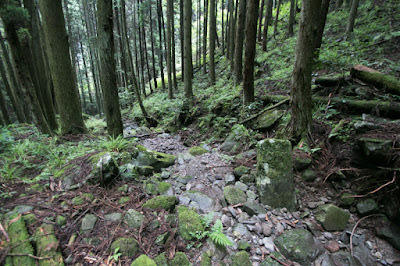 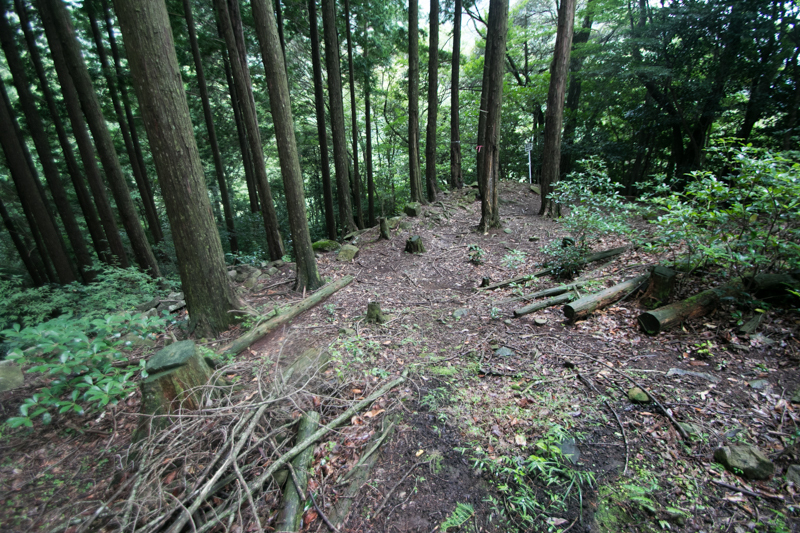 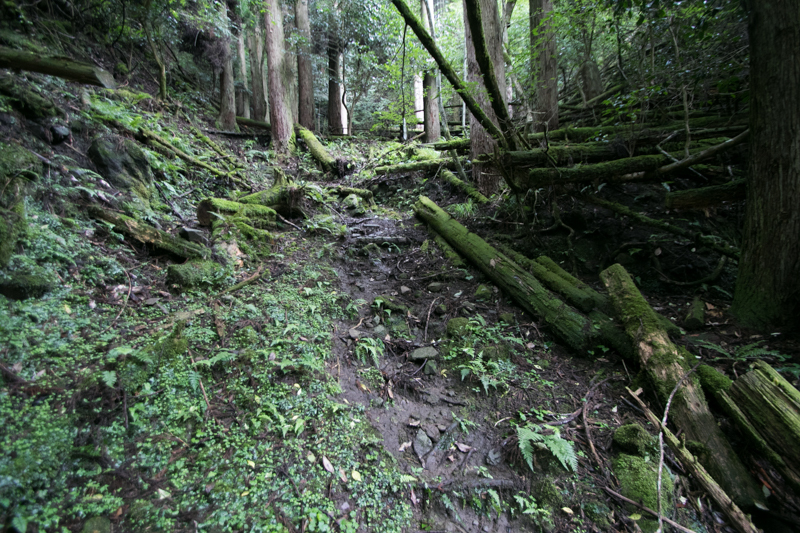 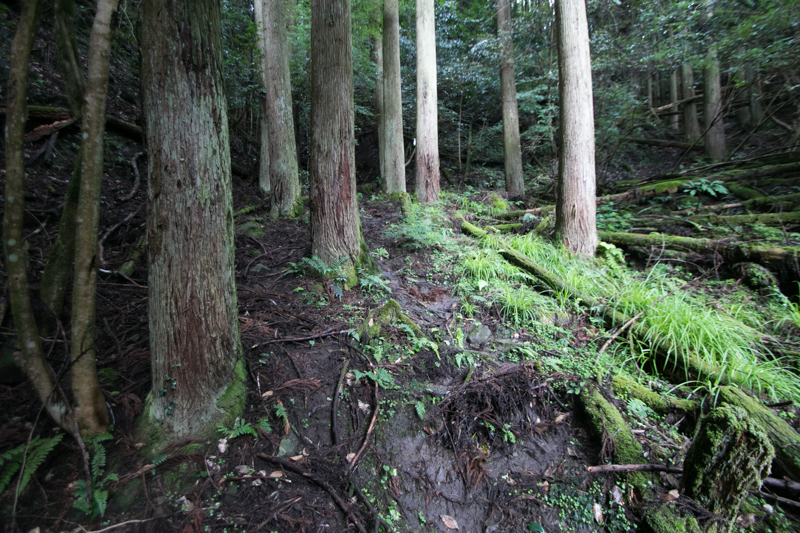 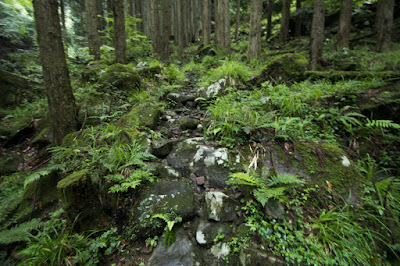 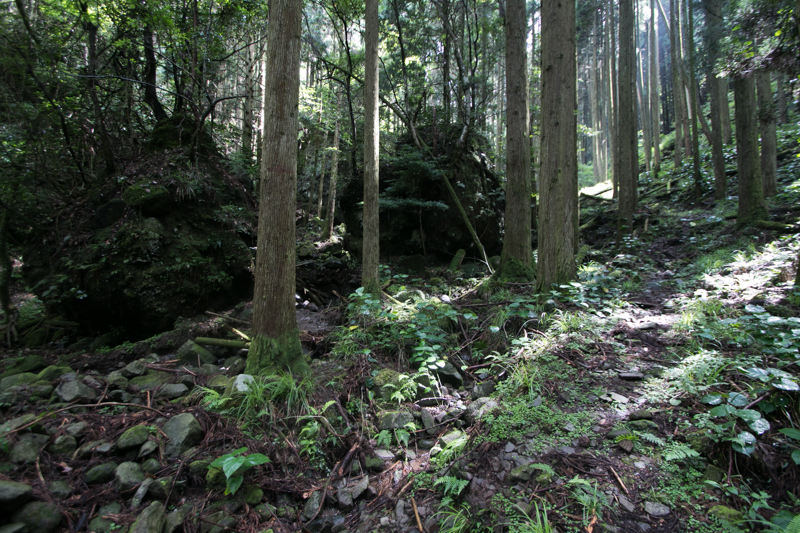 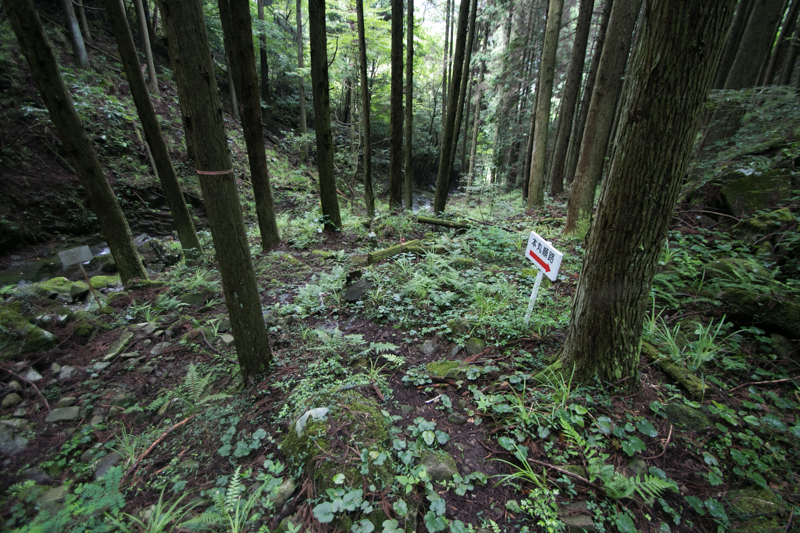 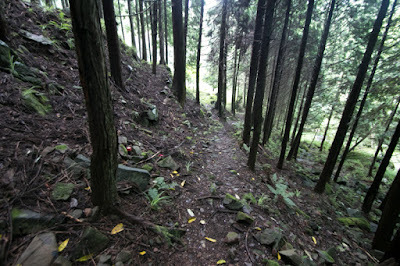 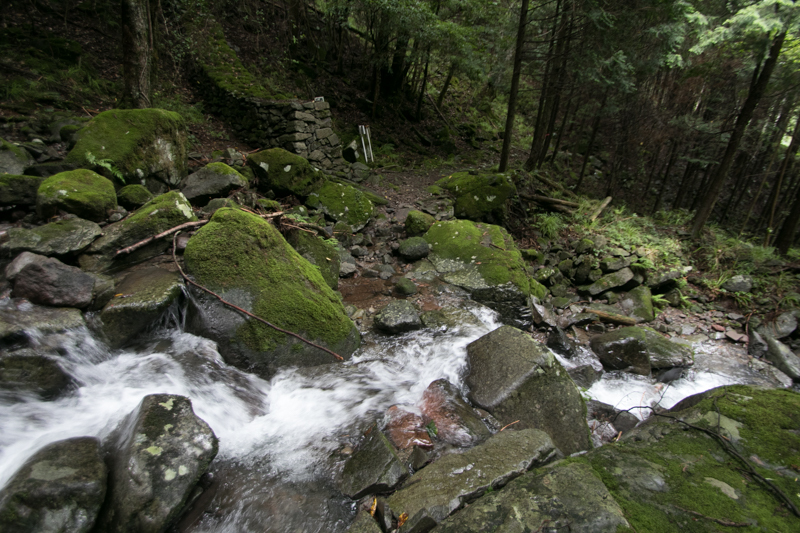 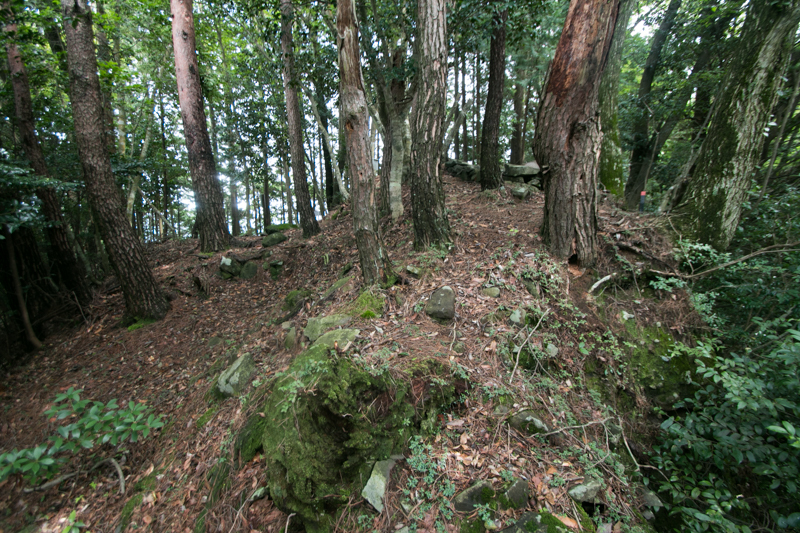 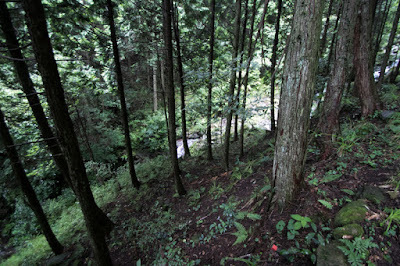 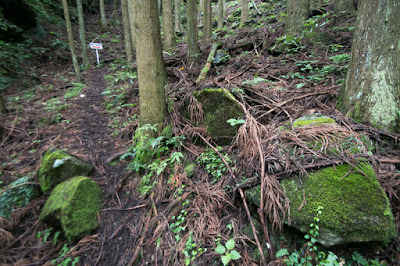 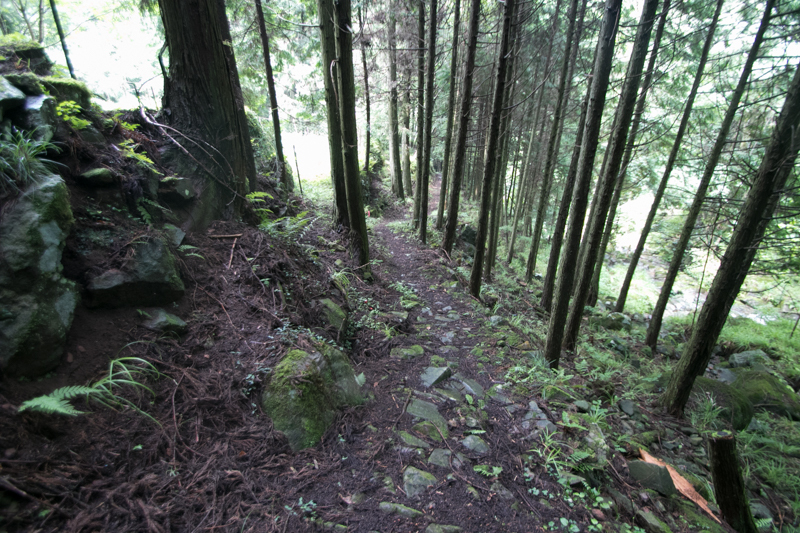 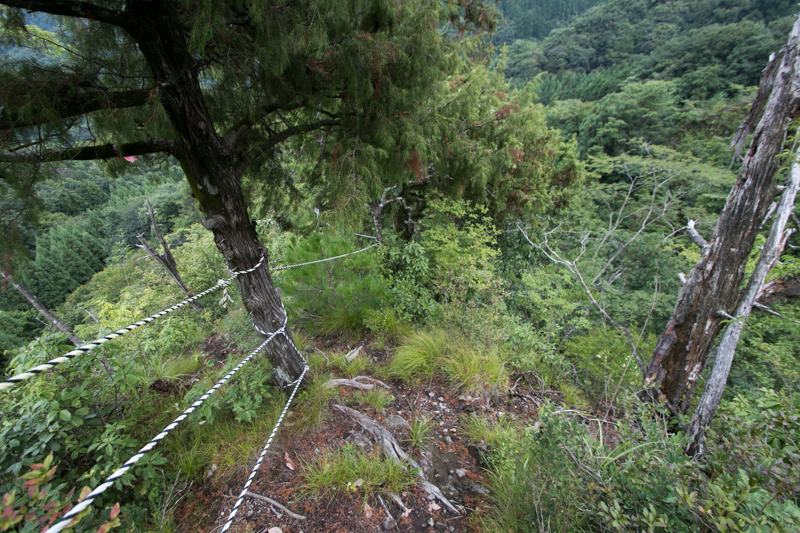 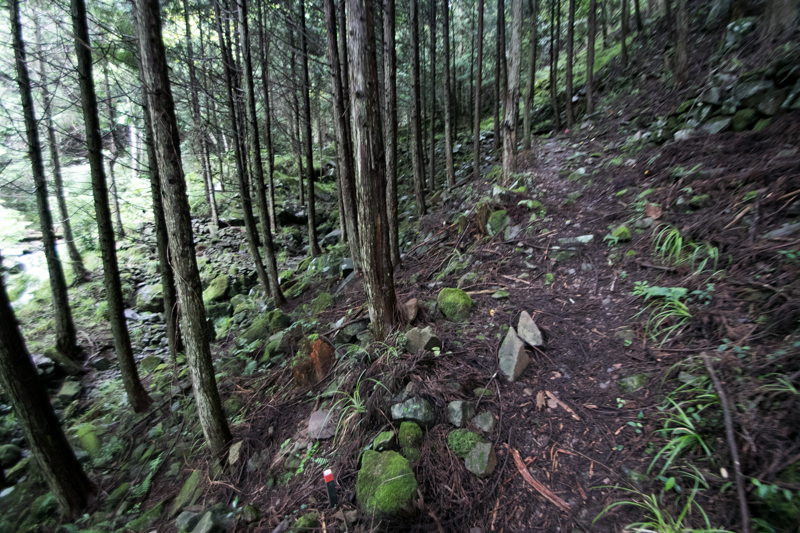 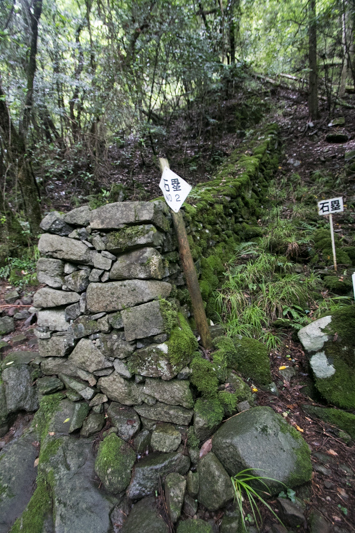 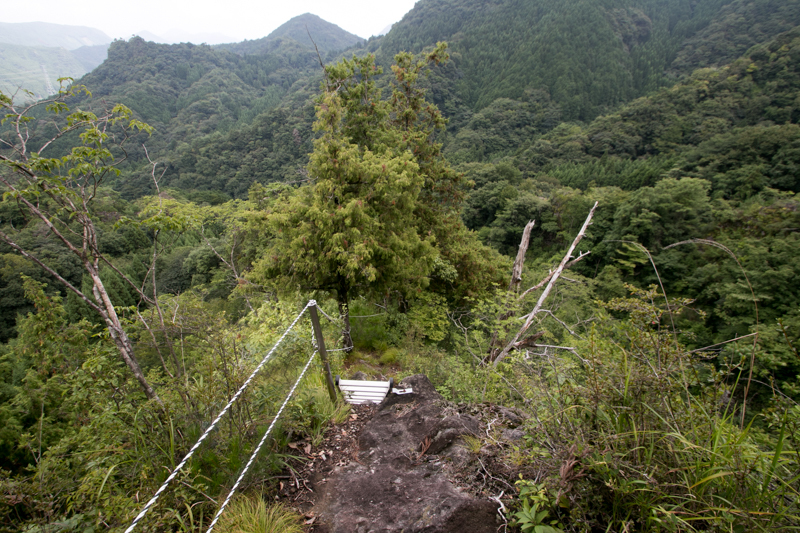 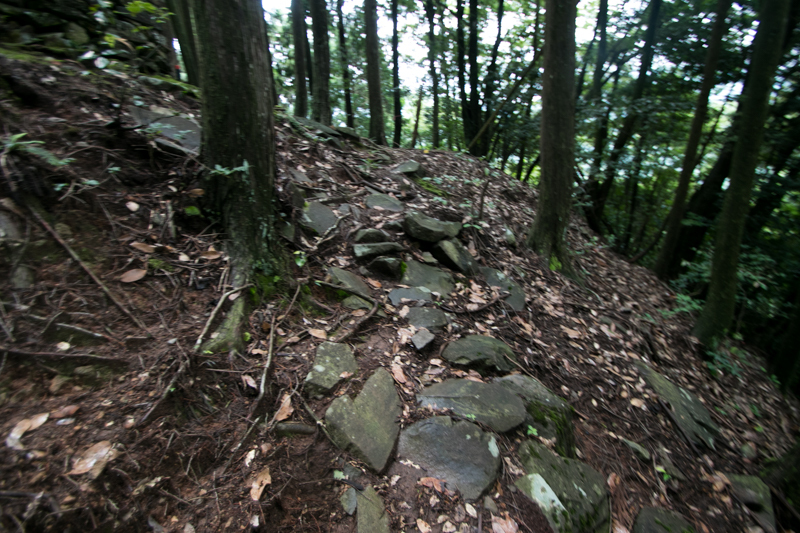 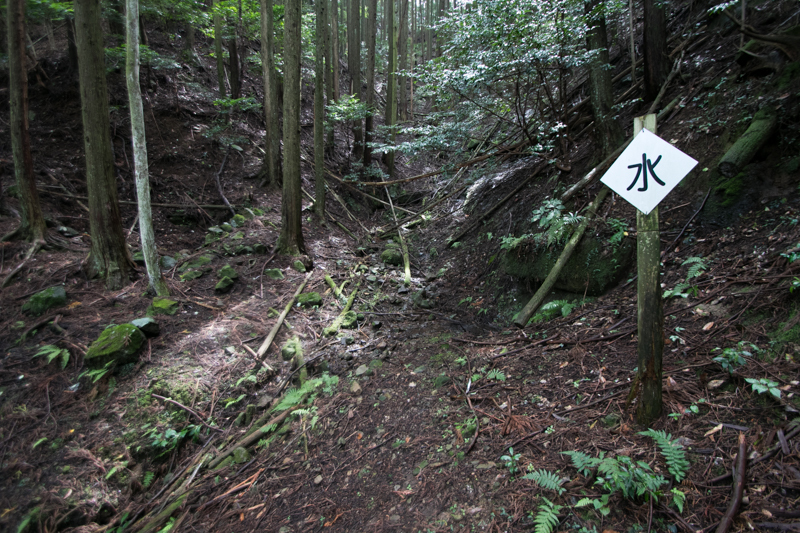 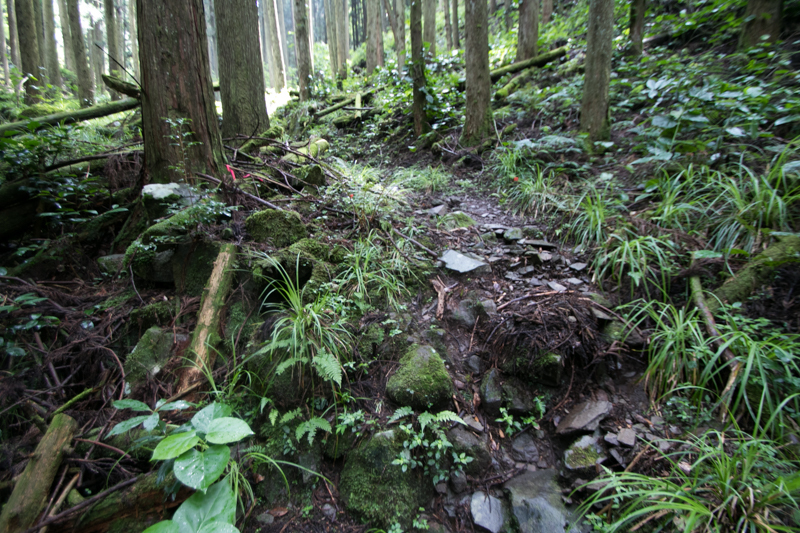 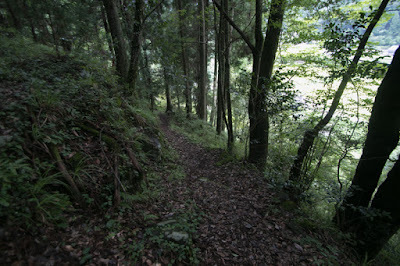 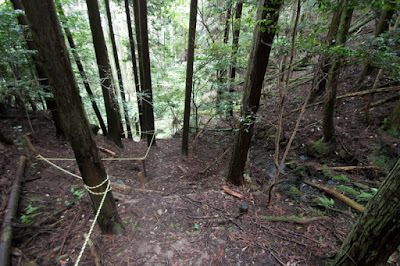 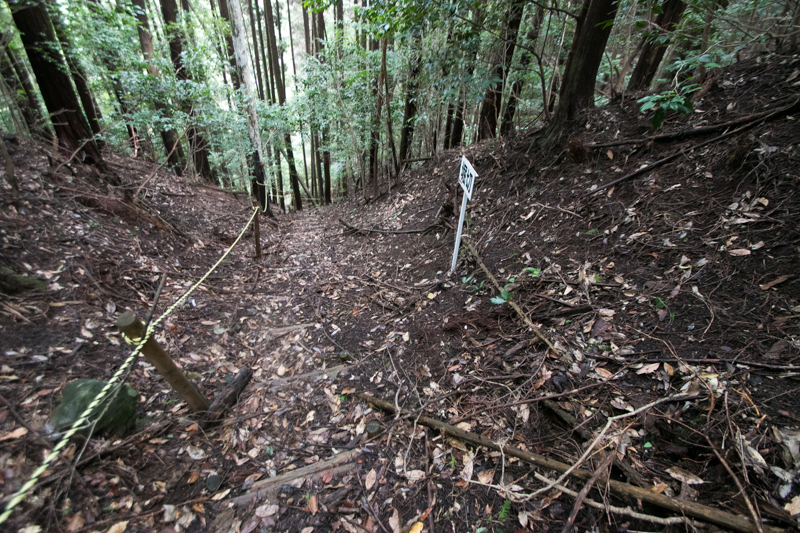 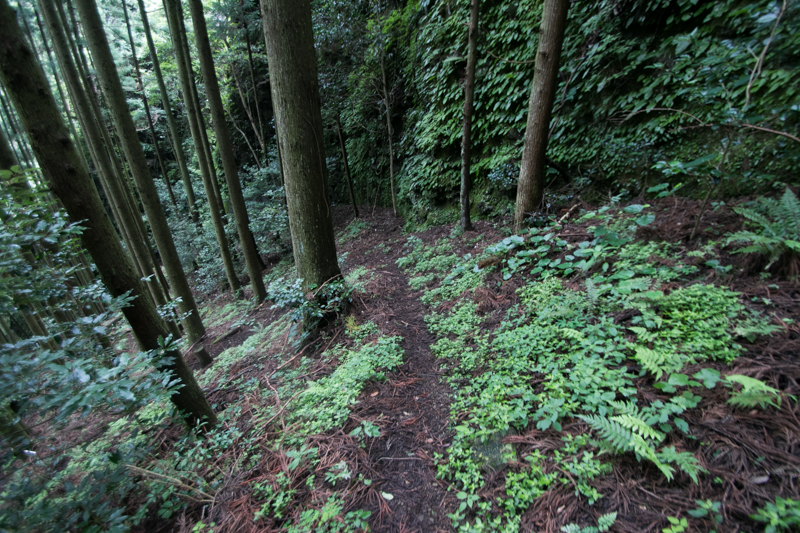 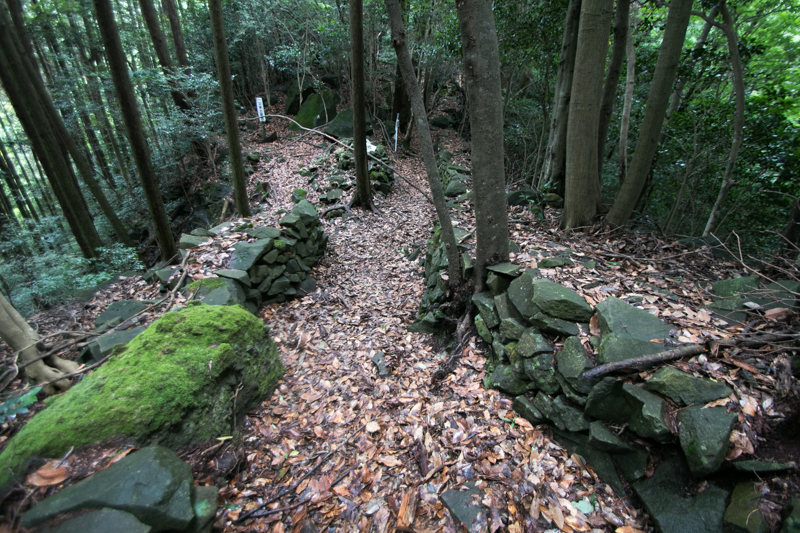 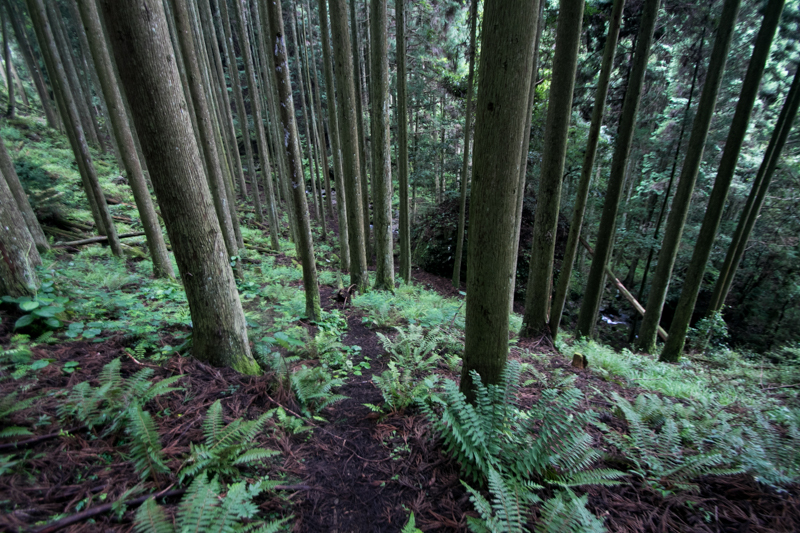 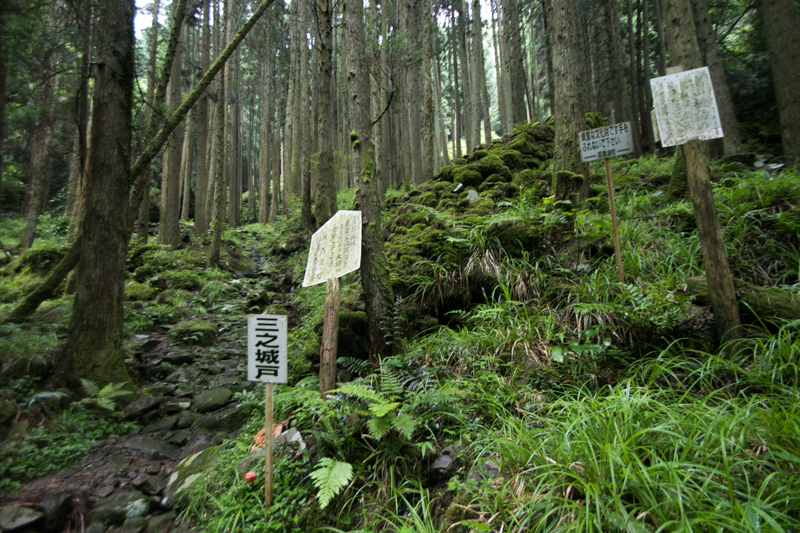 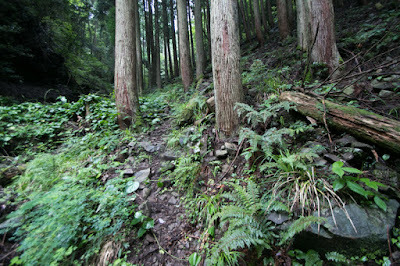 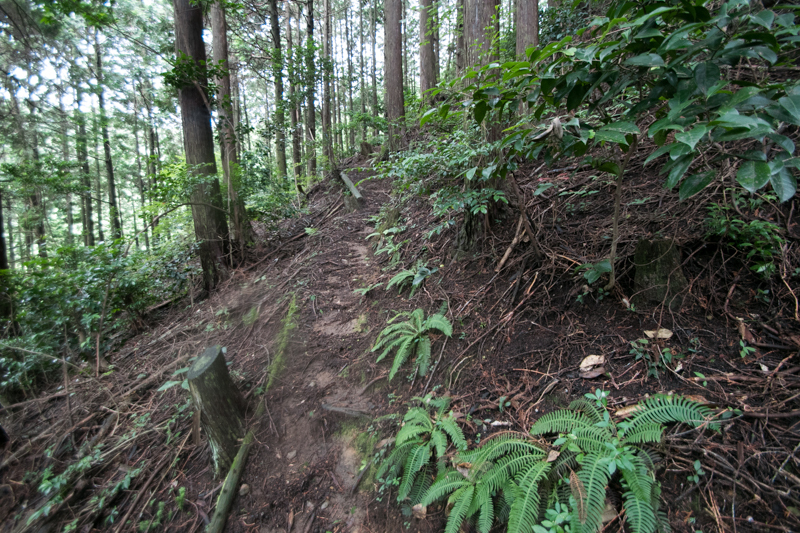 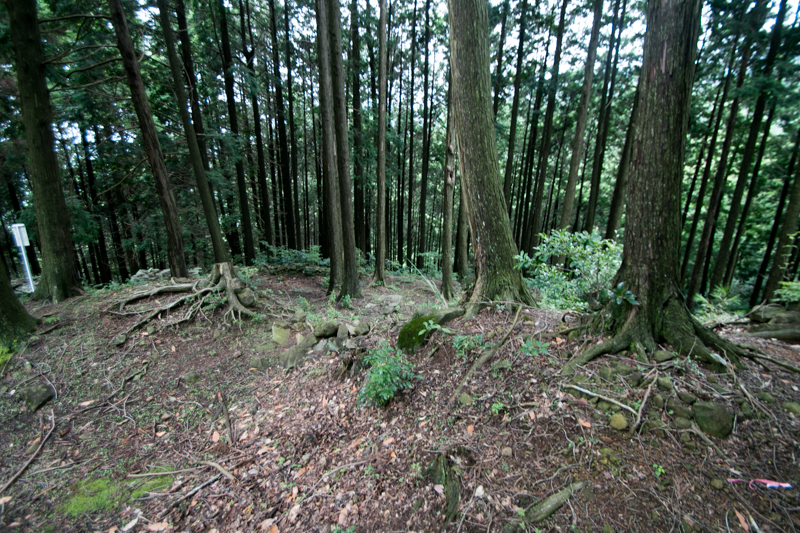 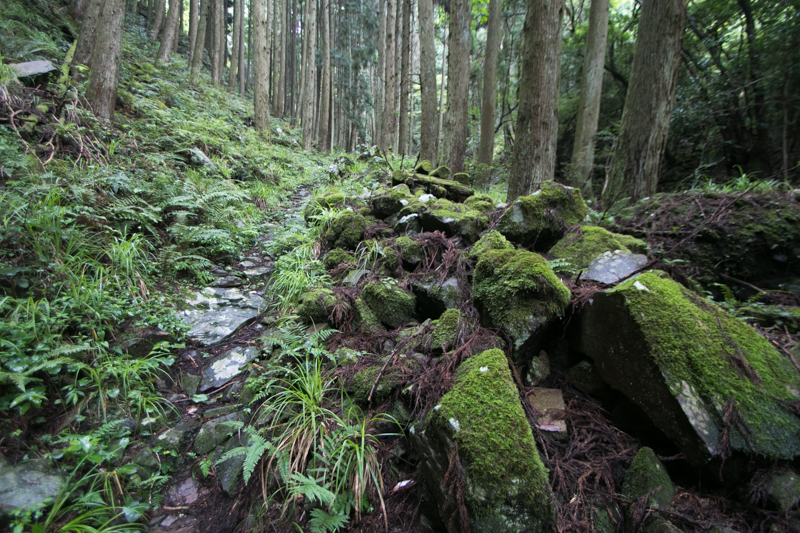 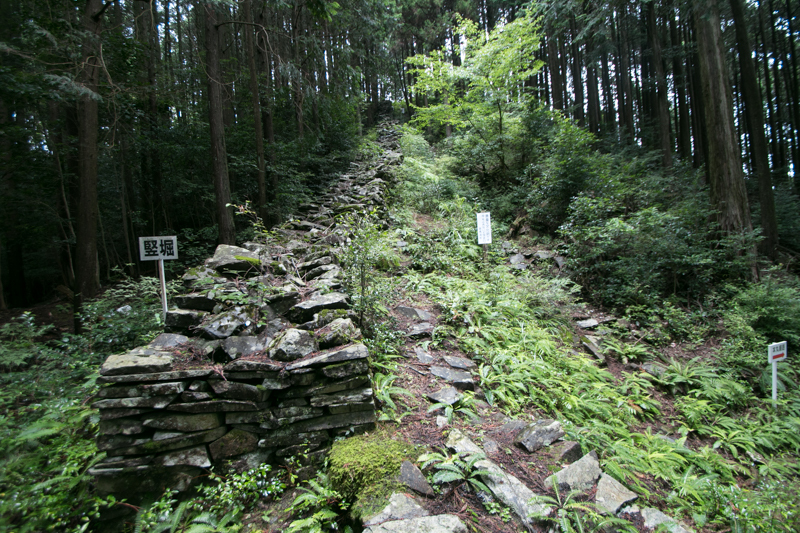 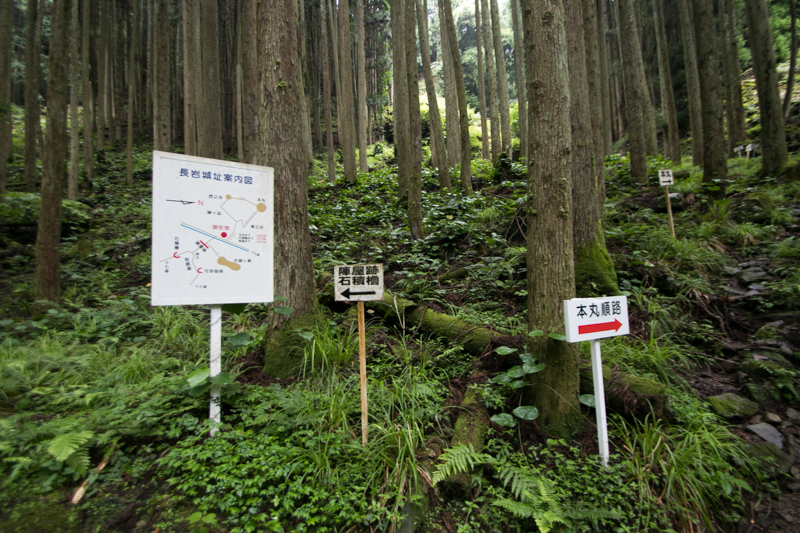 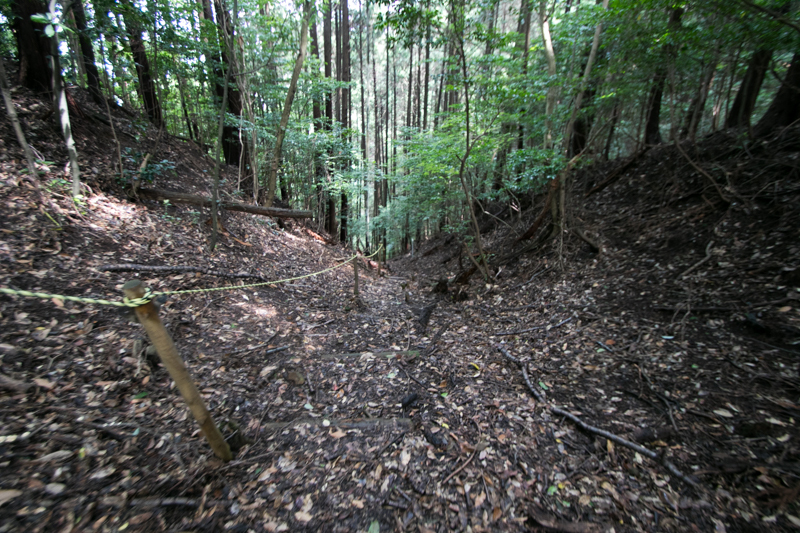 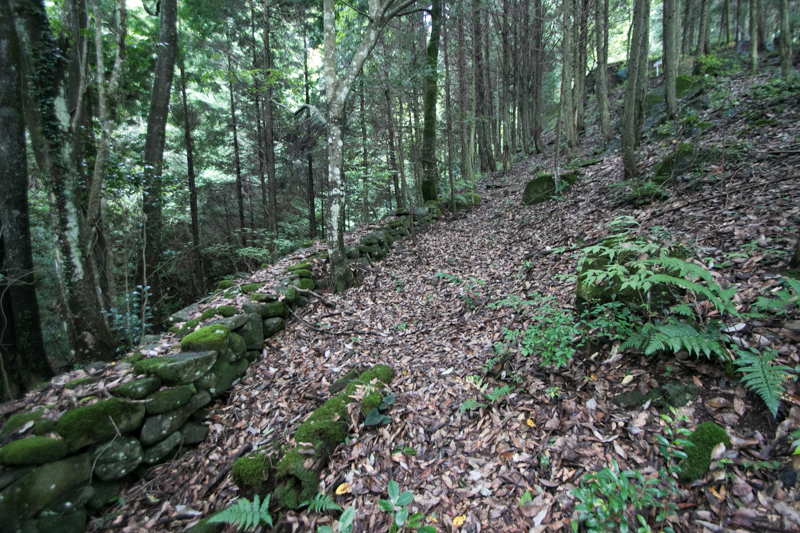 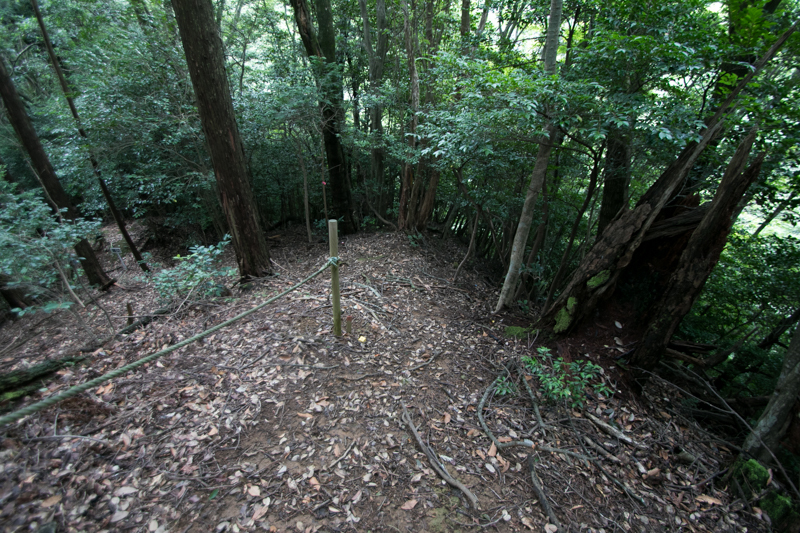 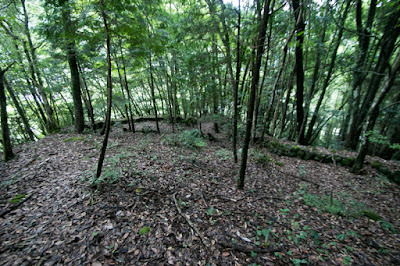 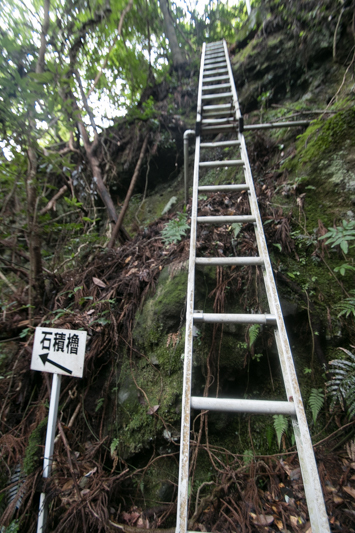 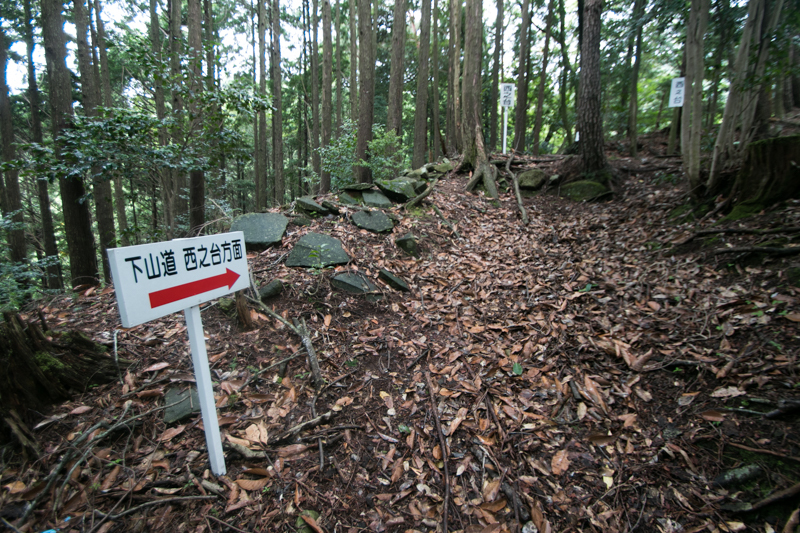 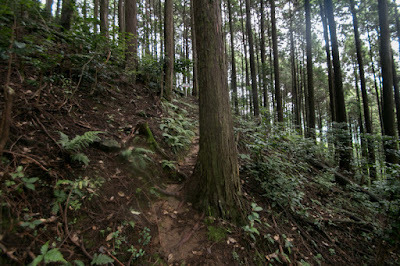 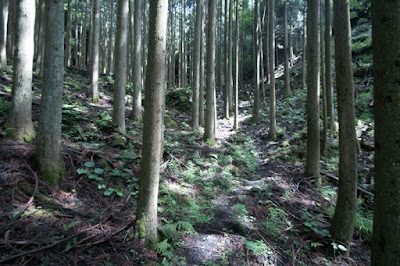 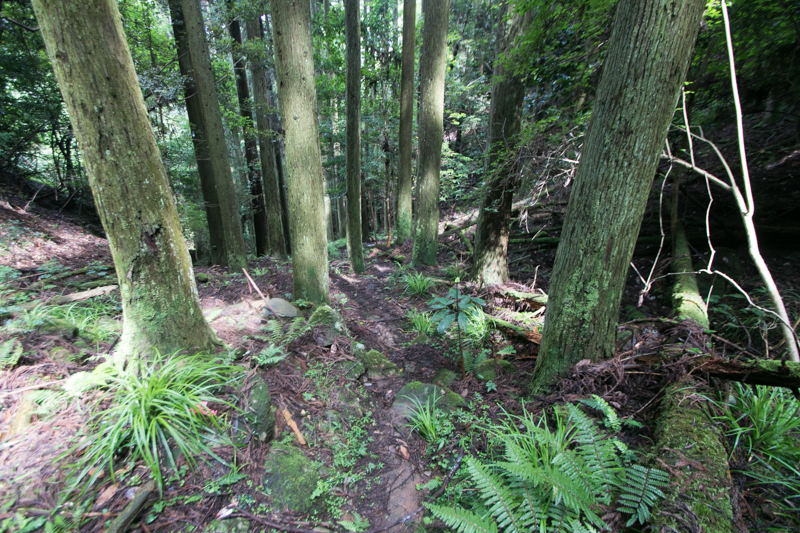 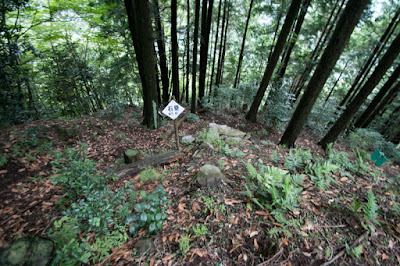 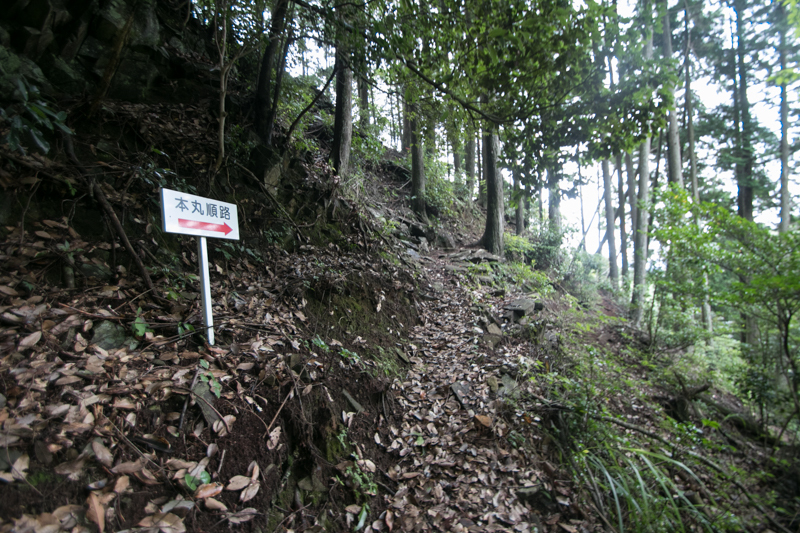 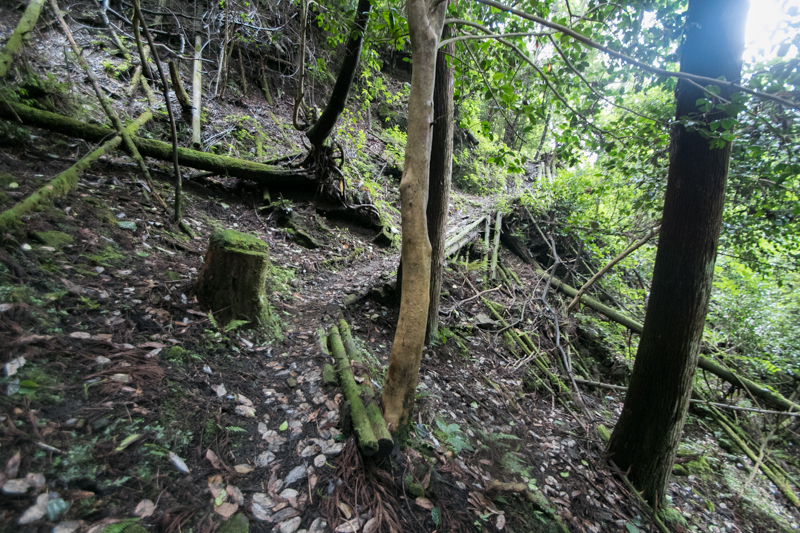 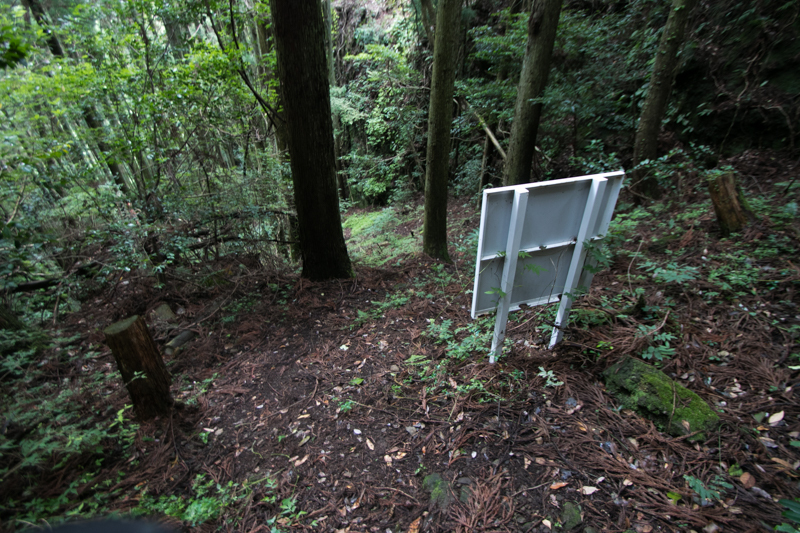 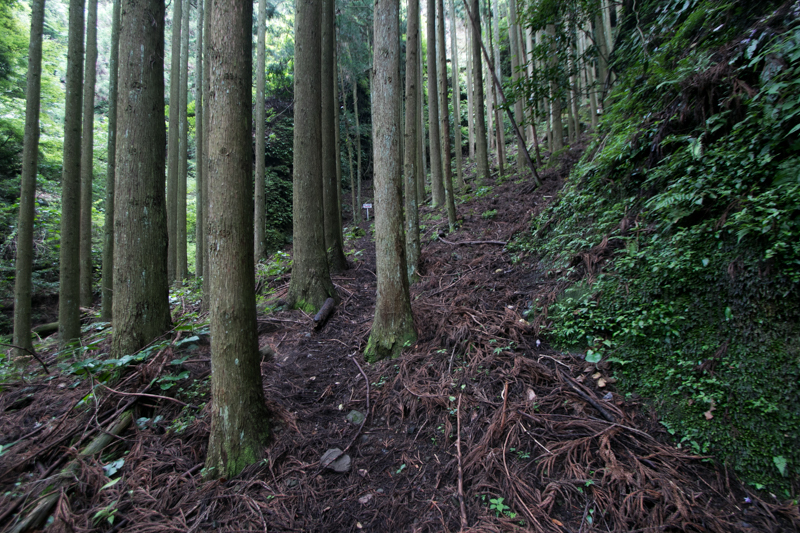 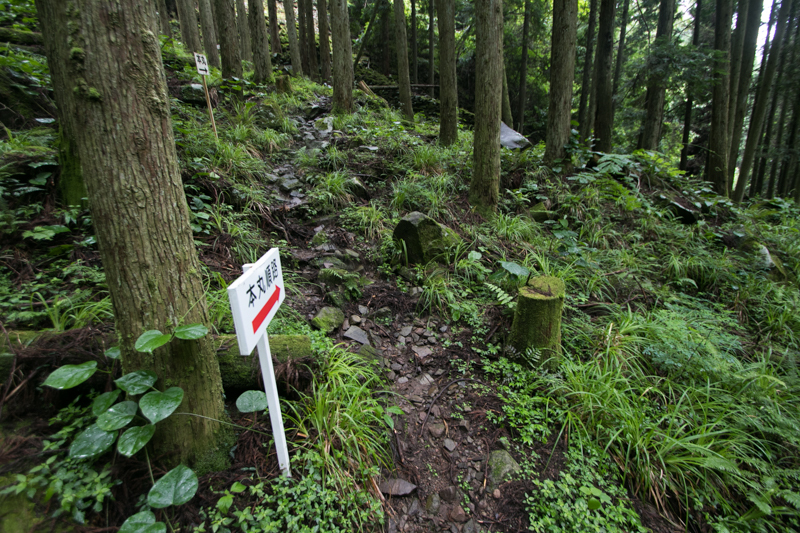 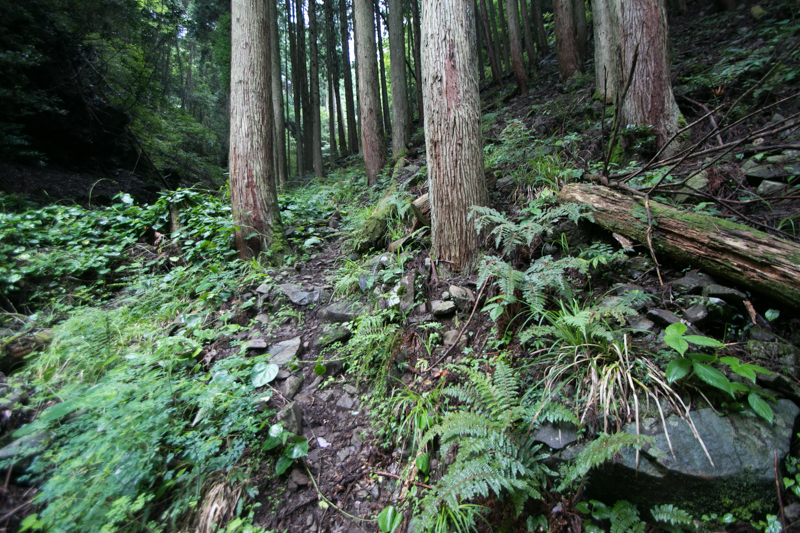 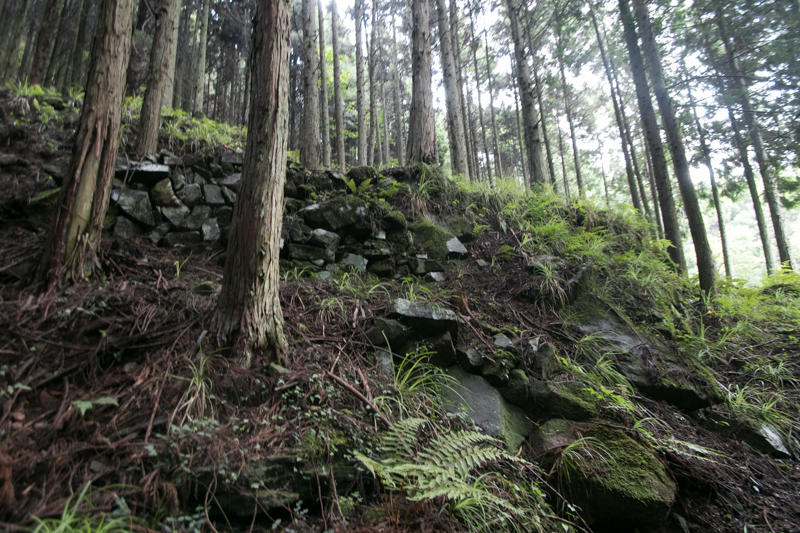 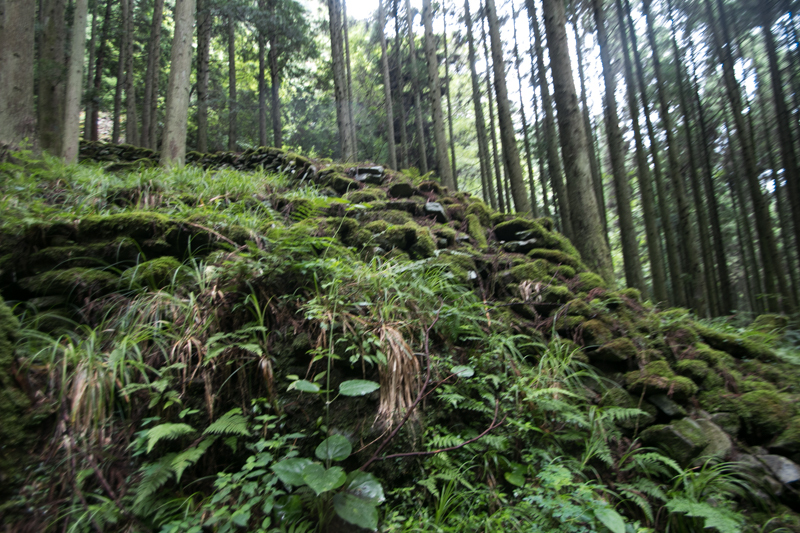 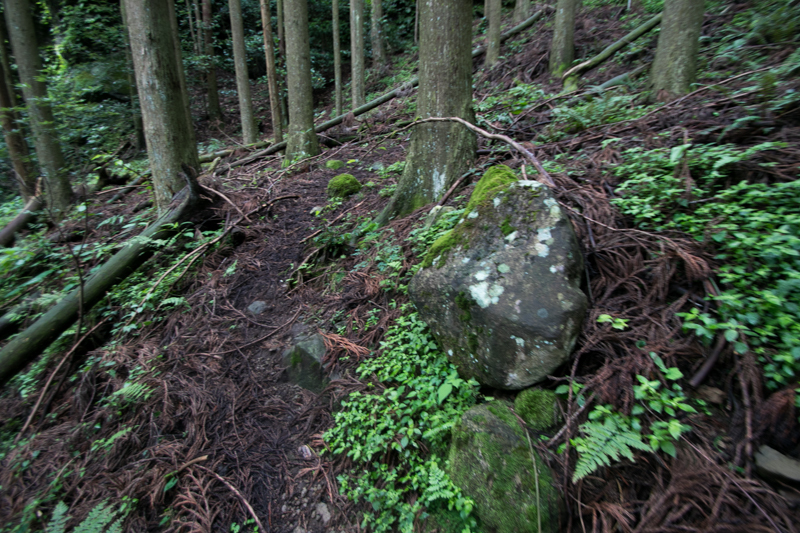 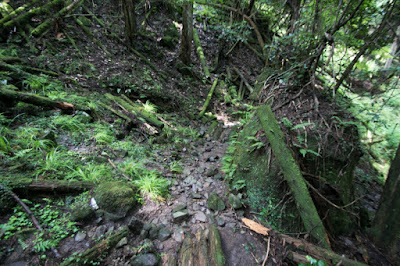 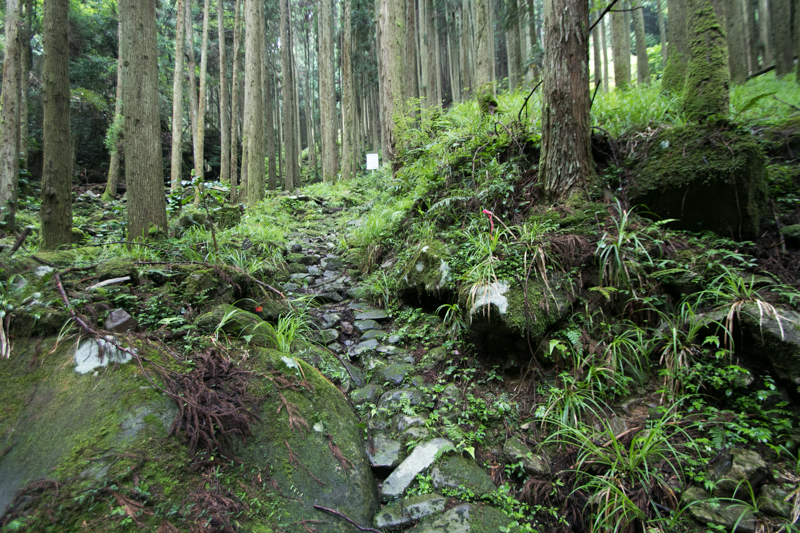 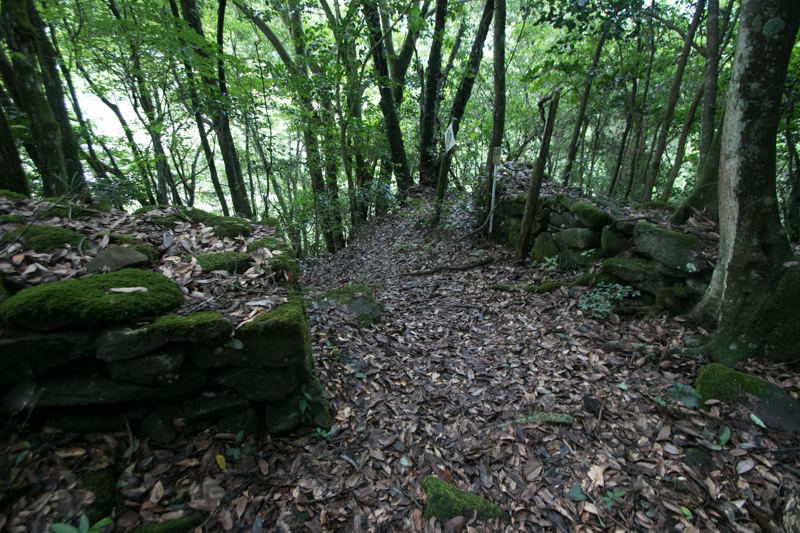 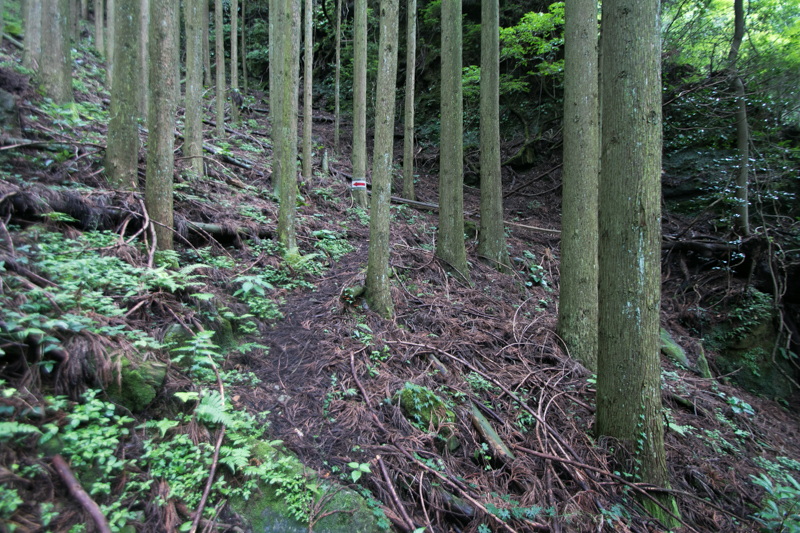 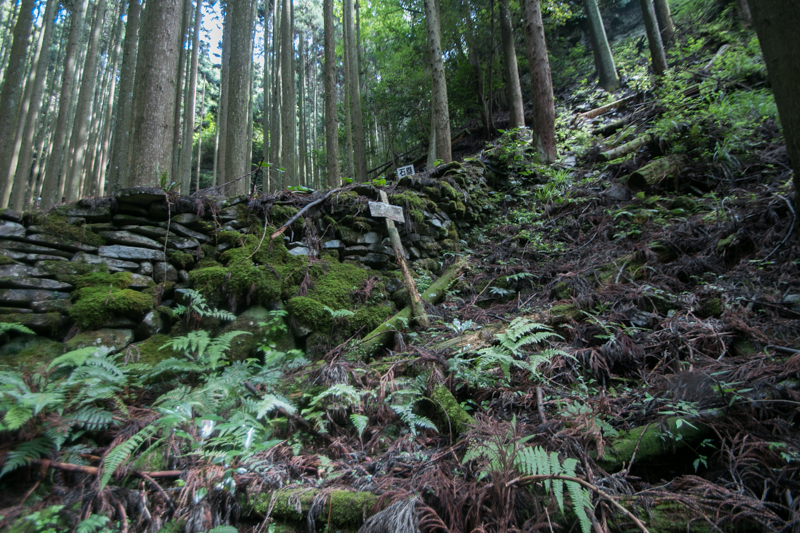 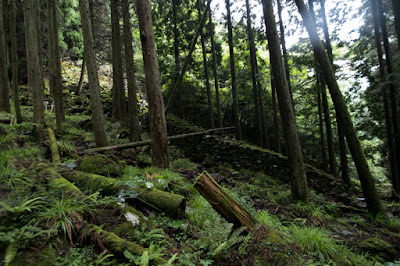 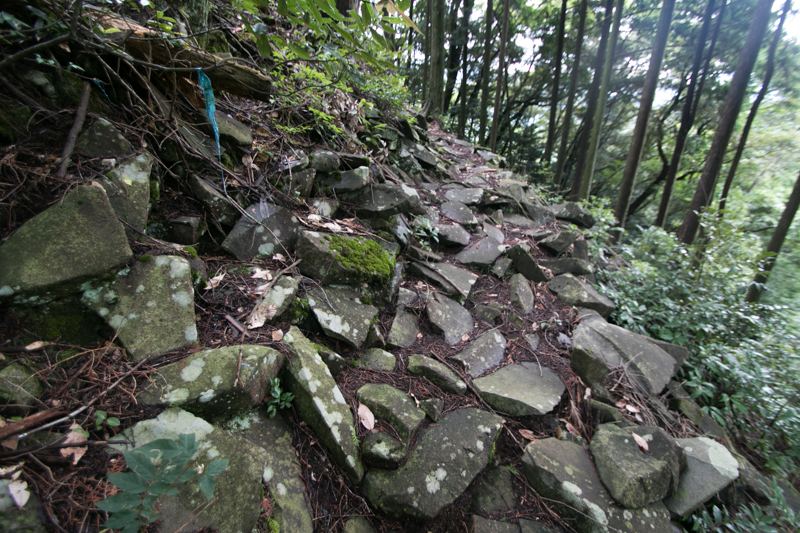 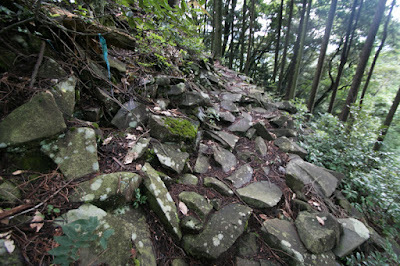 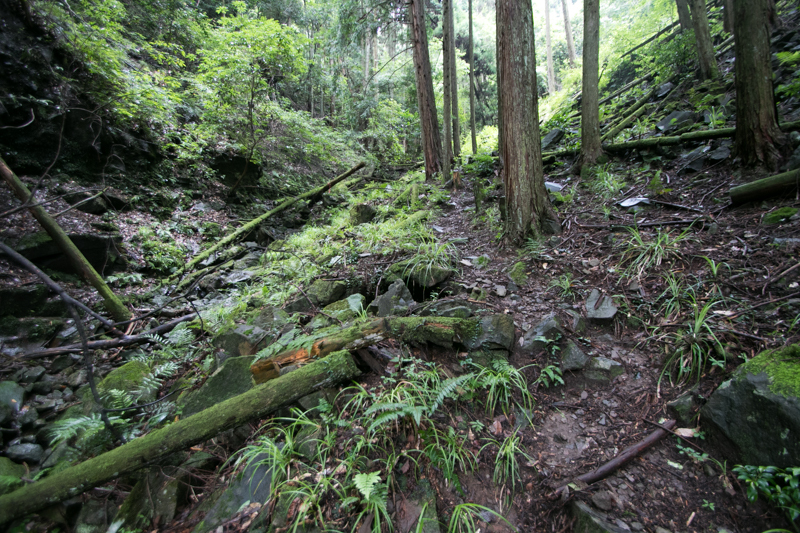 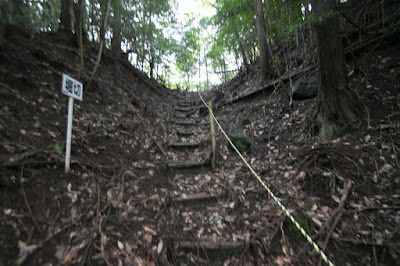 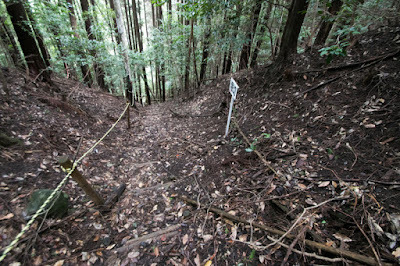 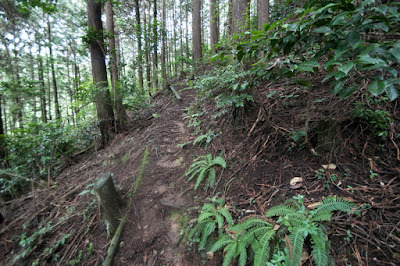 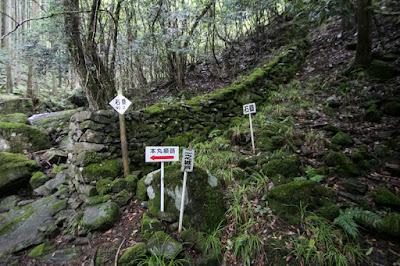 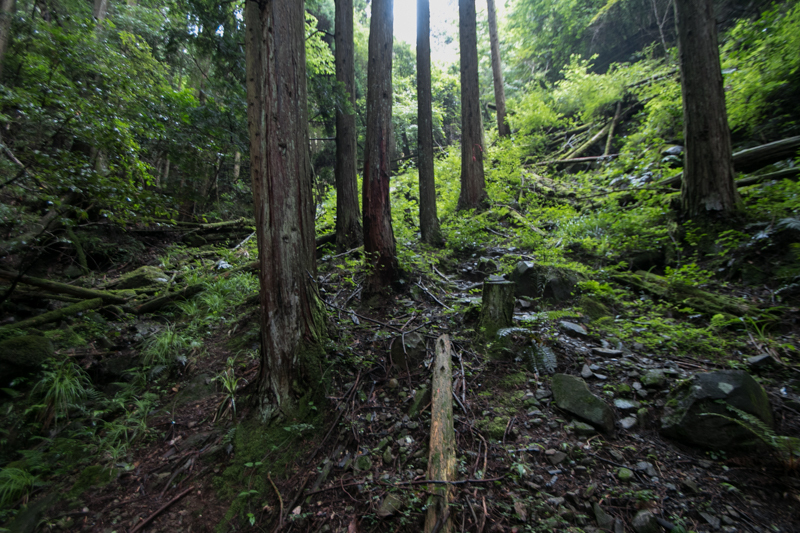 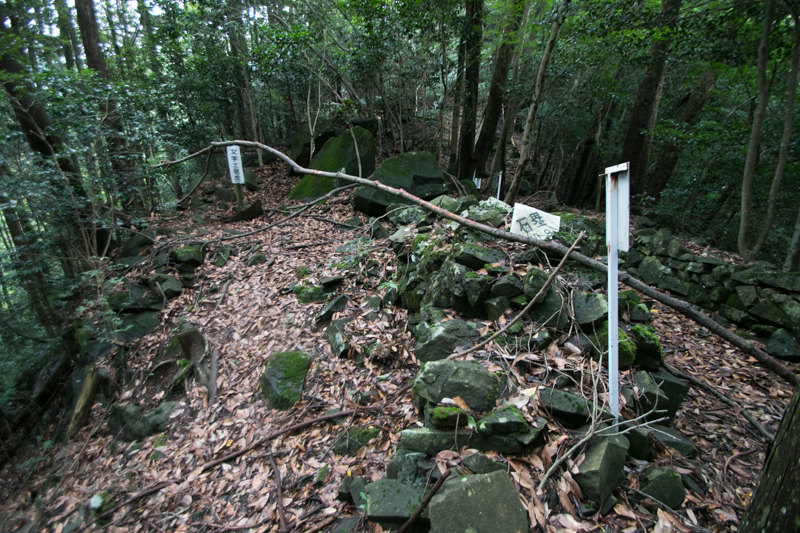 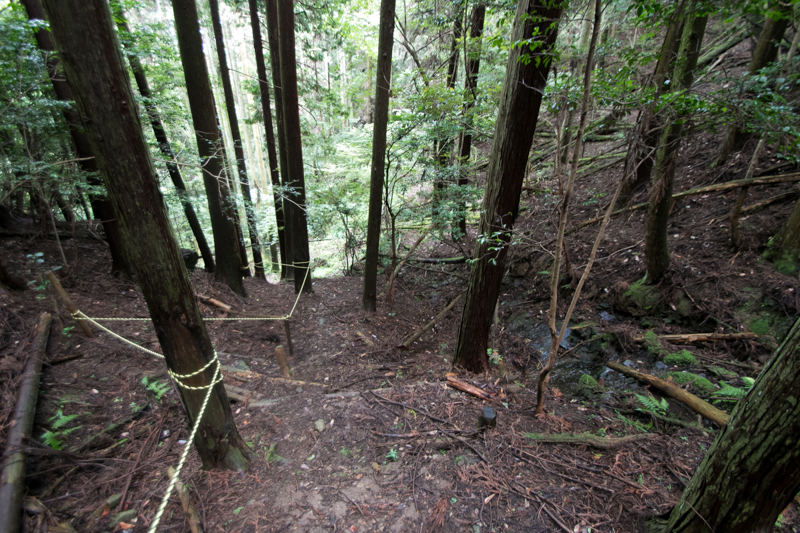 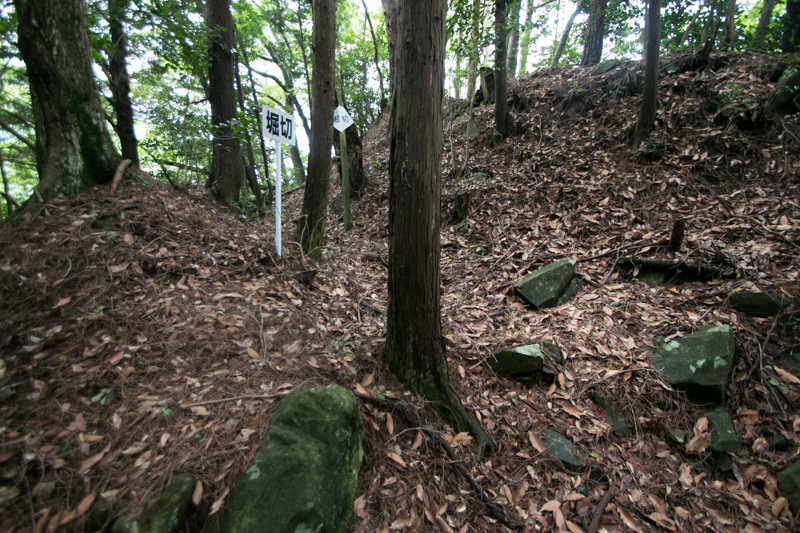 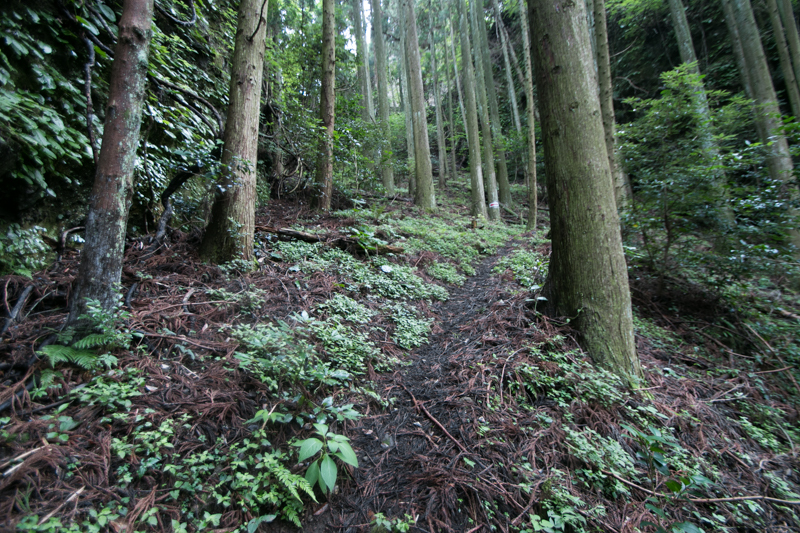 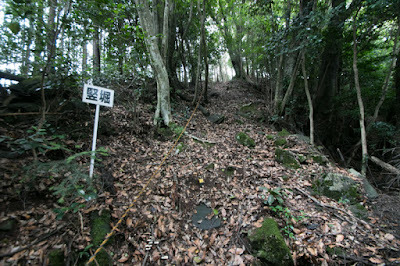 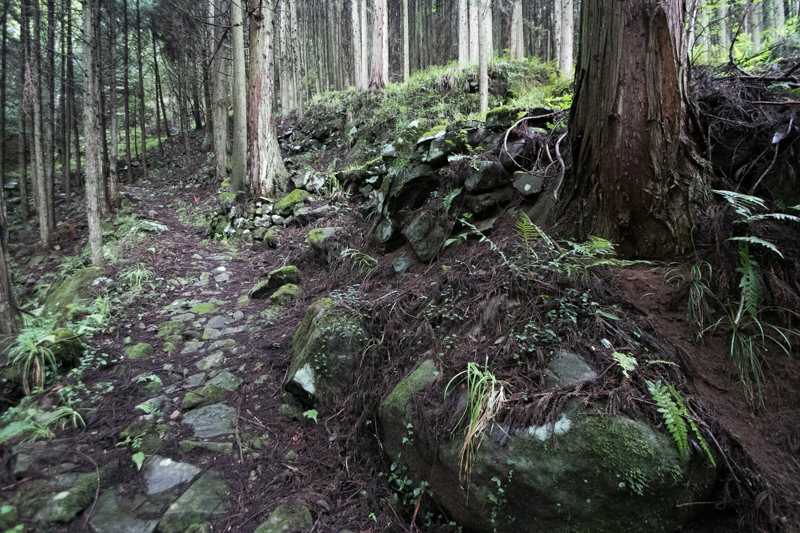 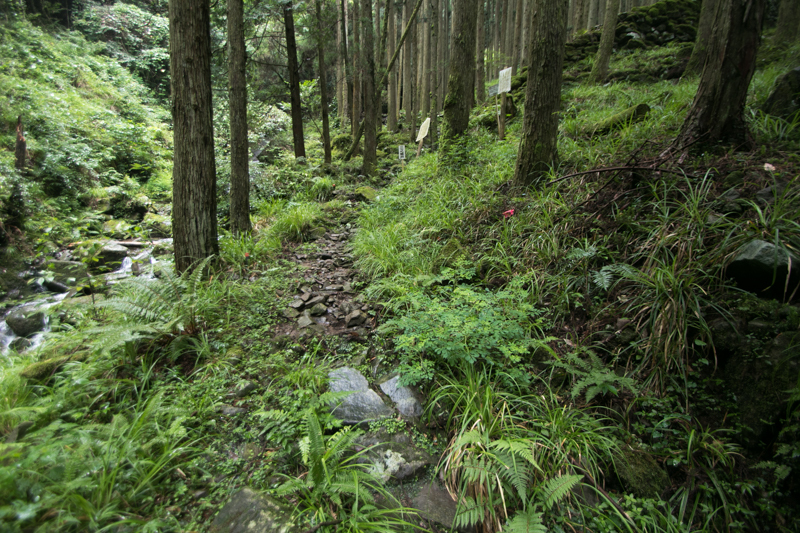 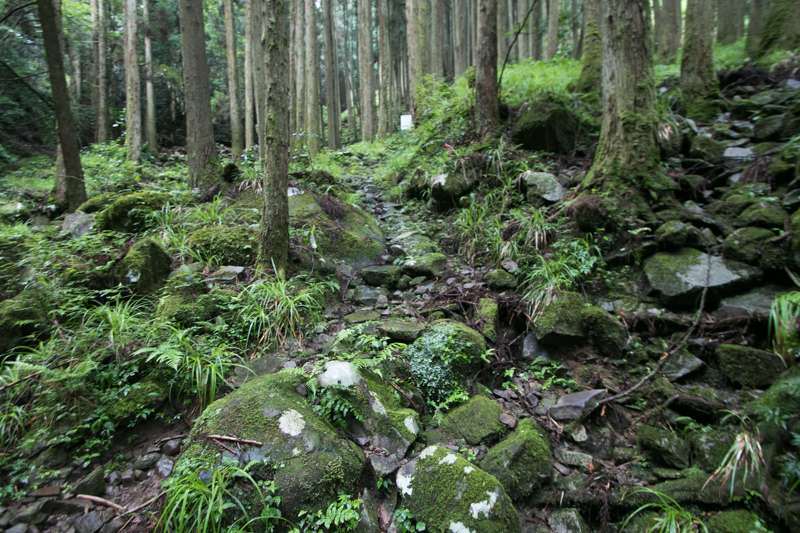 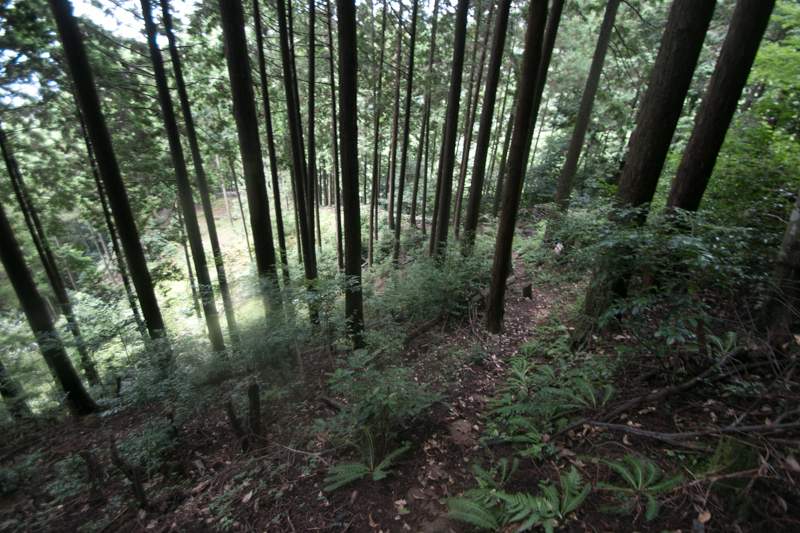 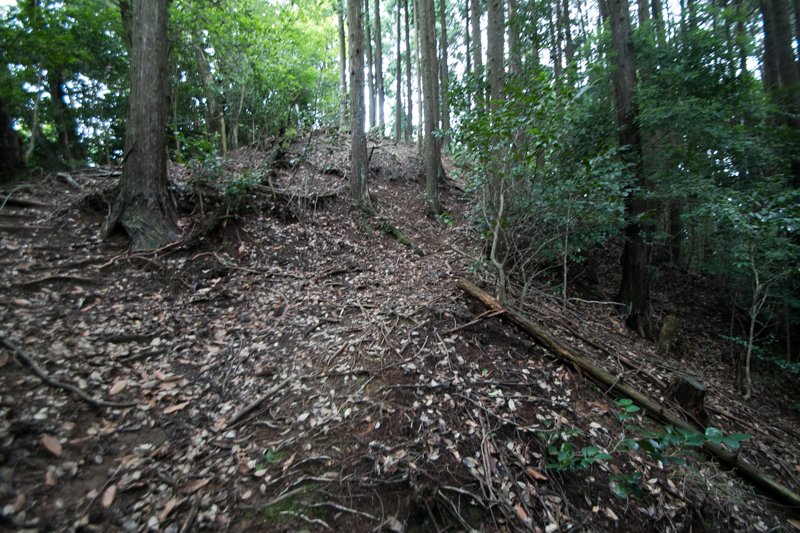 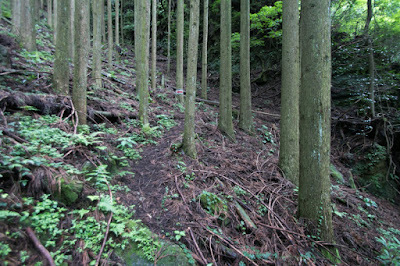 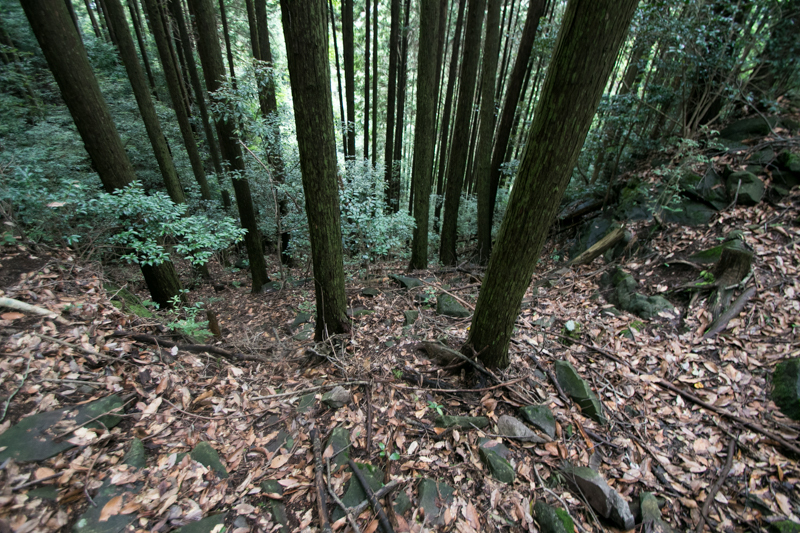 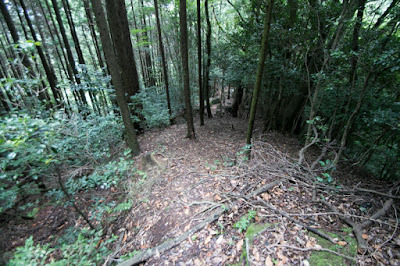 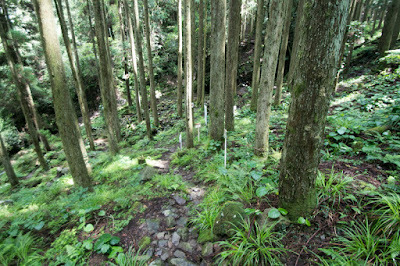 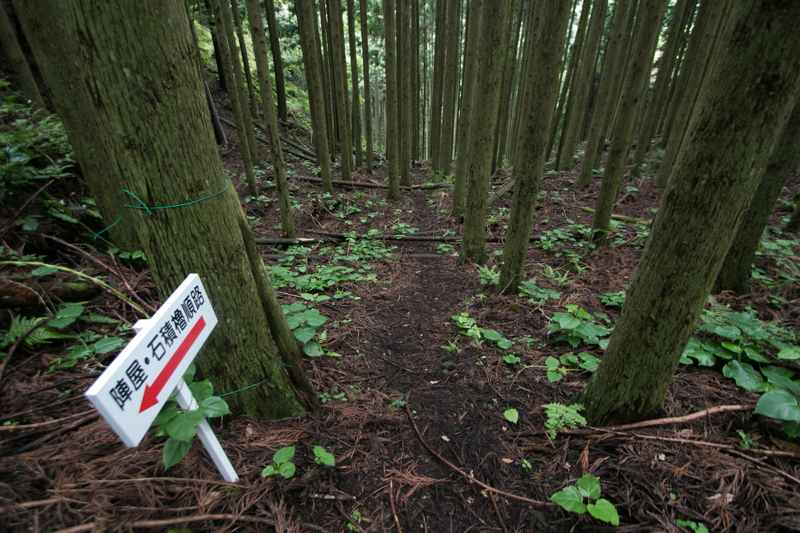 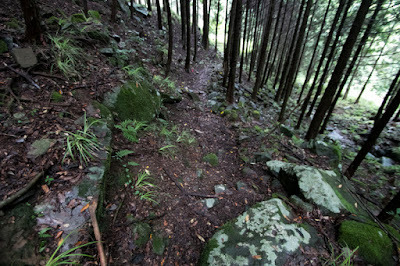 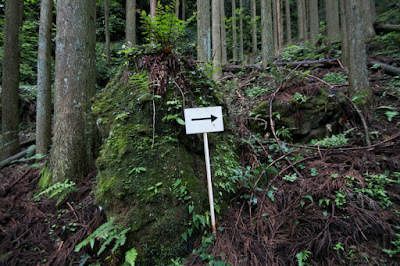 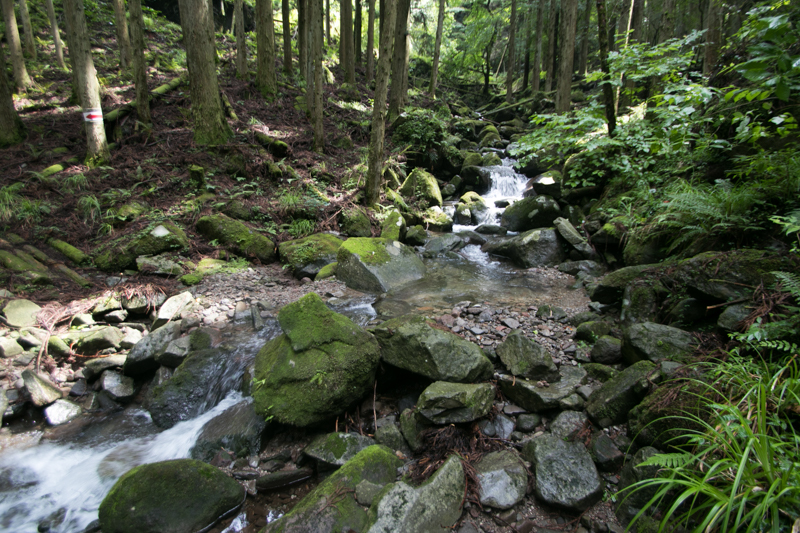 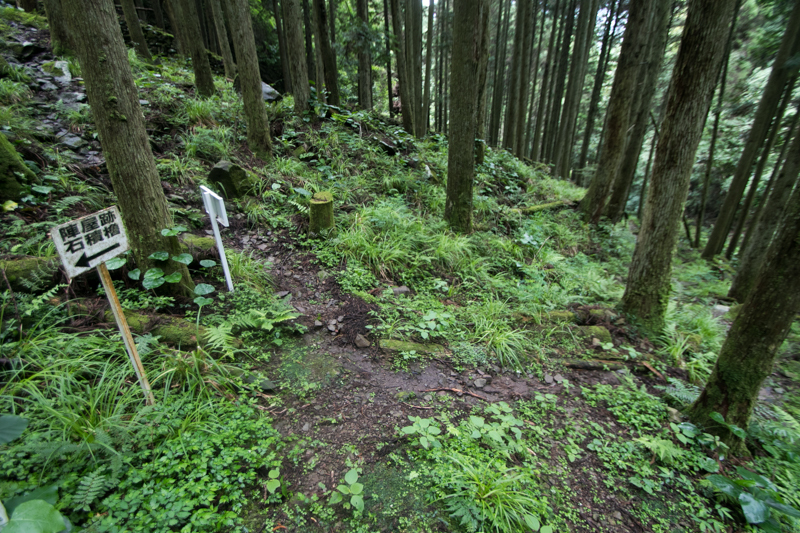 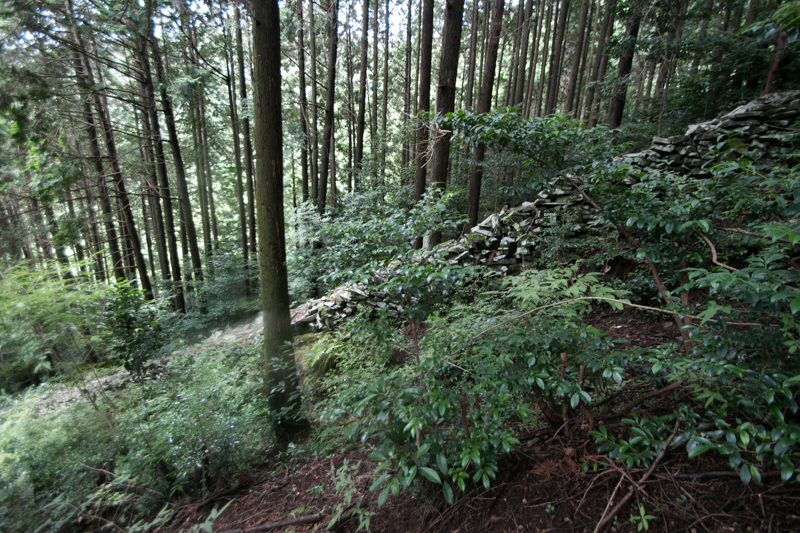 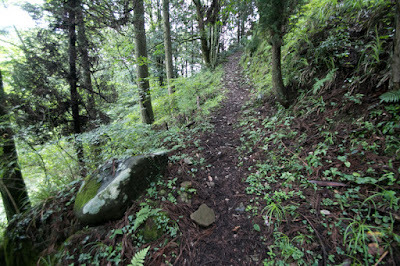 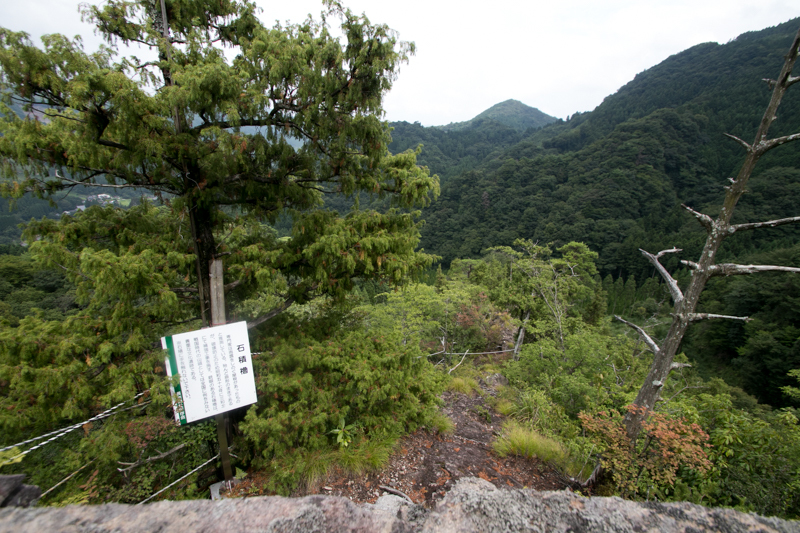 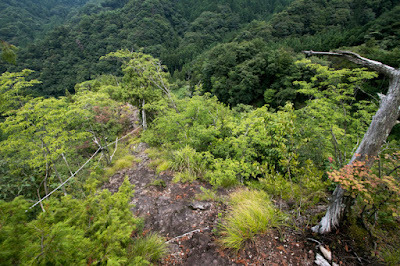 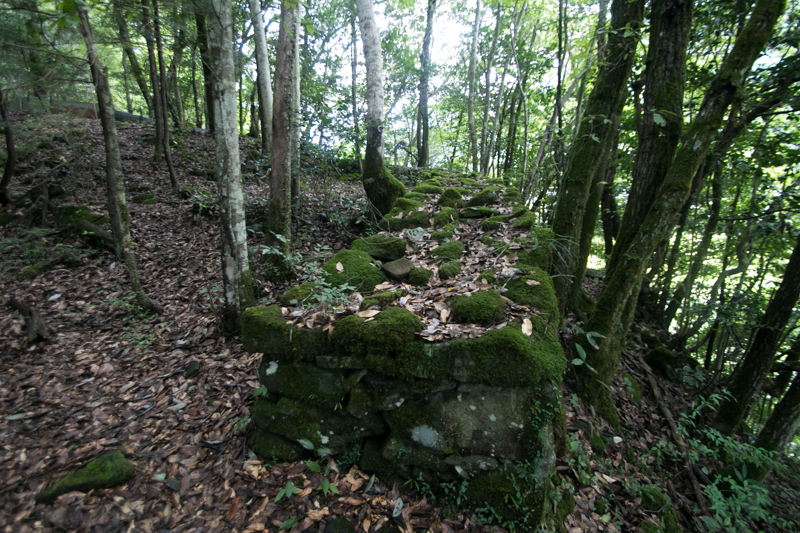 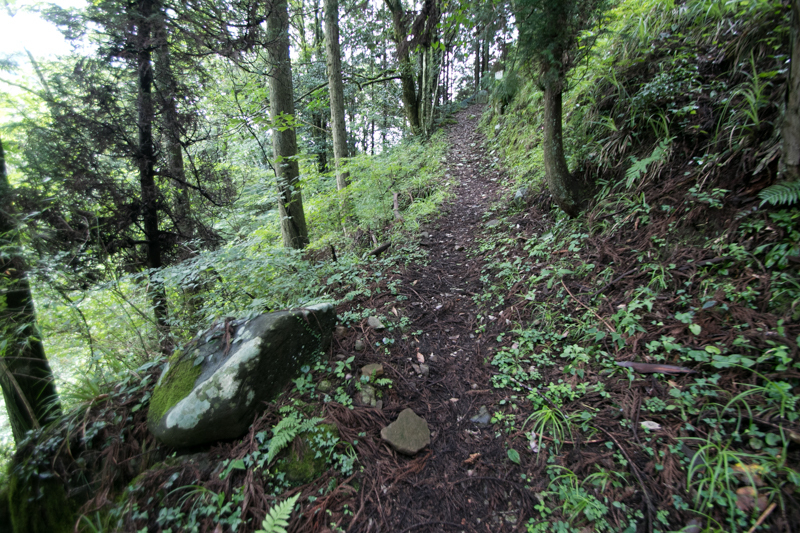 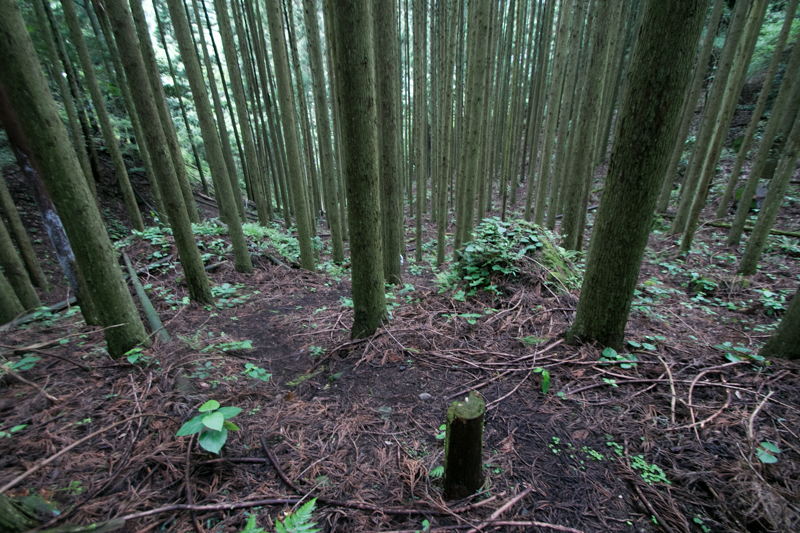 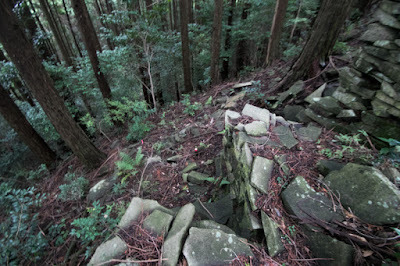 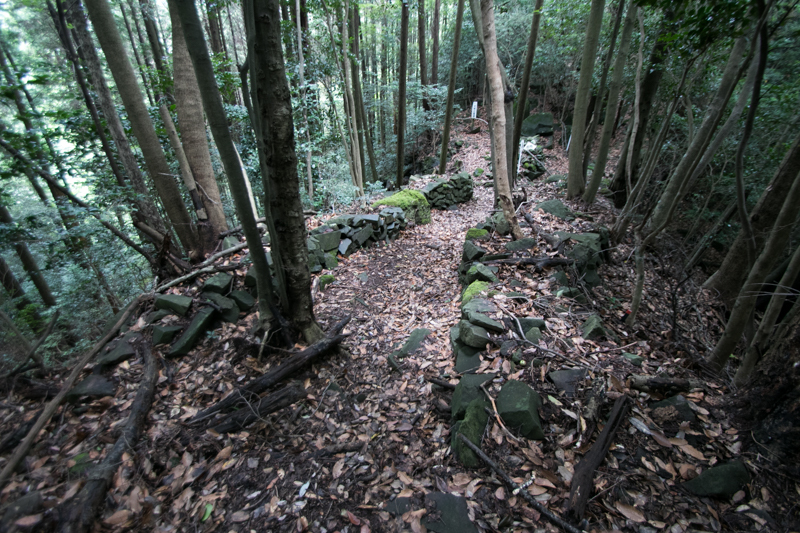 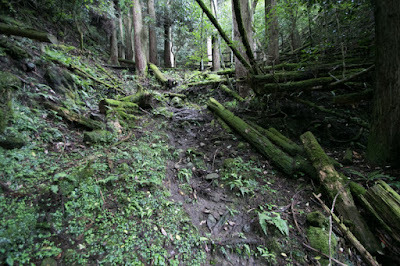 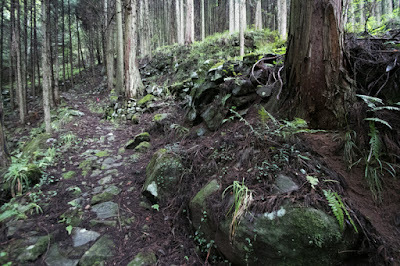 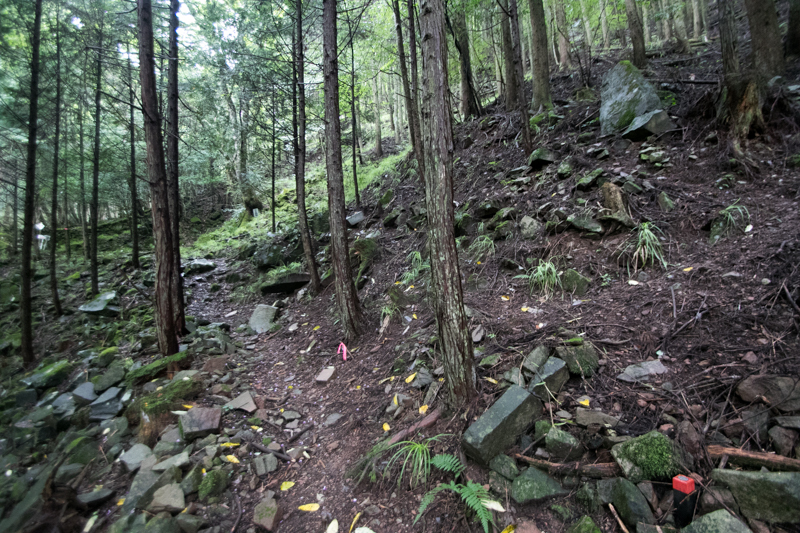 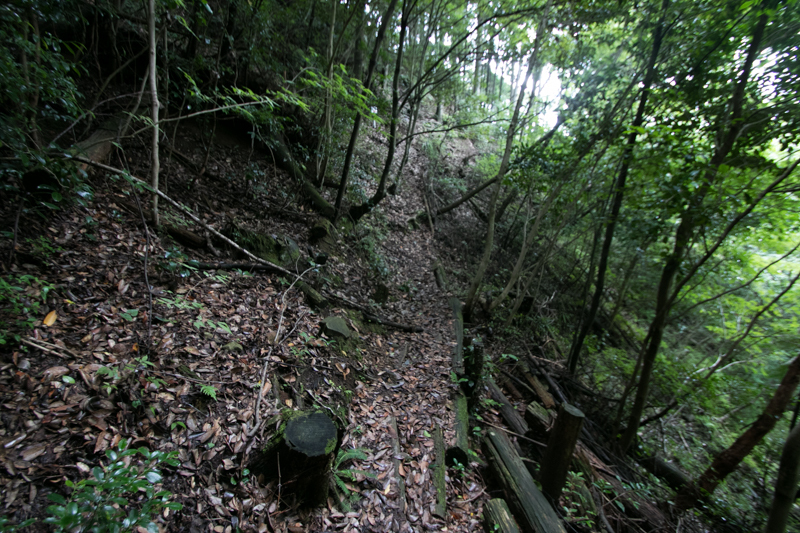 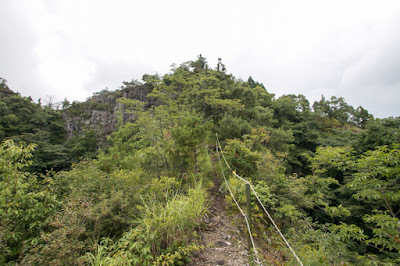 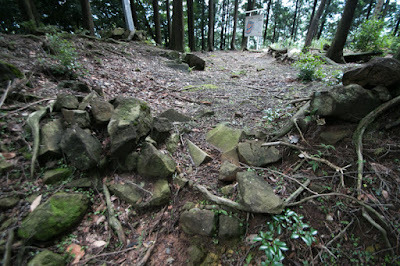 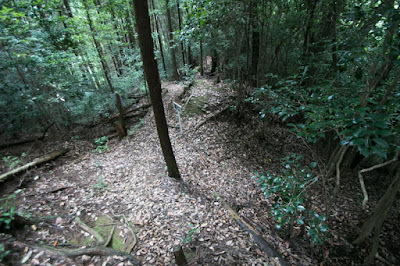 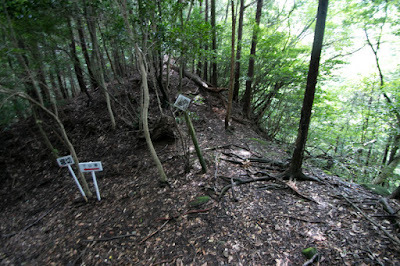 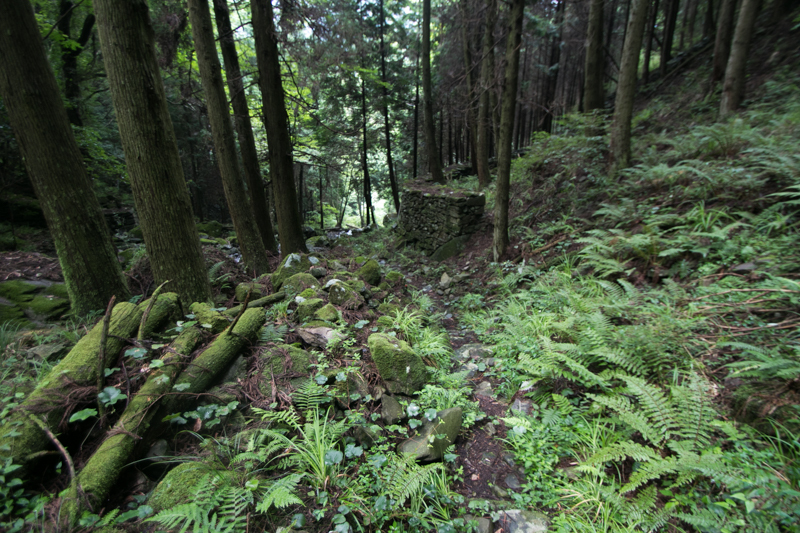 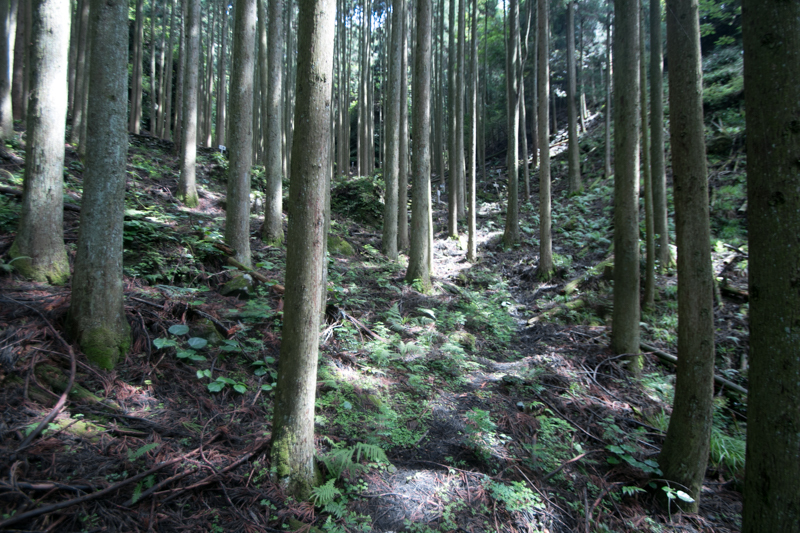 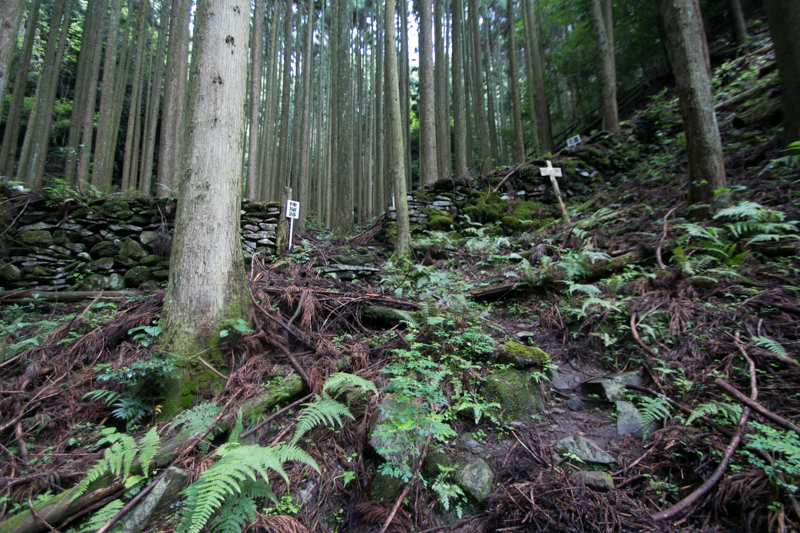 Yabakei valley is a steep one at deep mountain, but also was an important communication route from Nakatsu plain to south part of Chikuho area or Hita area. 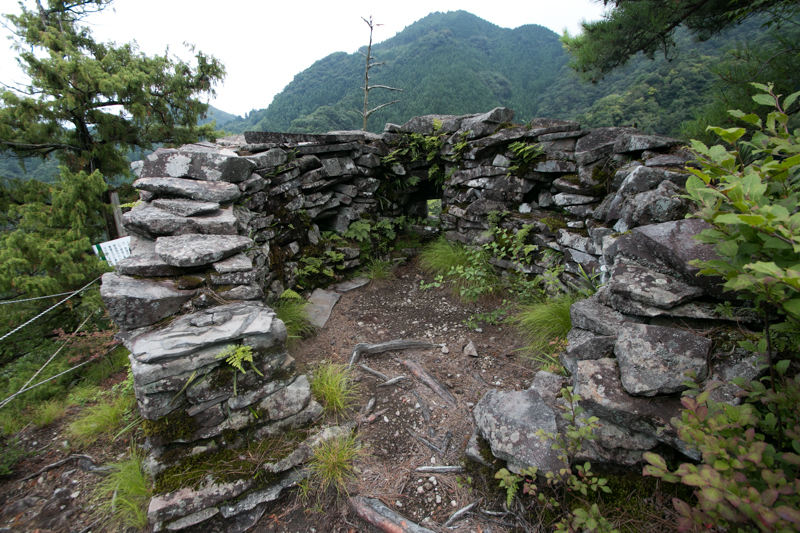 Combination of mountainous terrain and human activity produced famous sightseeing spots such as "Ao no Domon" which was a hand-build tunnel of 17th century, or traditional beautiful stone bridges at the area. The origin of Nagaiwa castle is unclear but it might be built by local lord Nonaka clan at the end of 12th century. 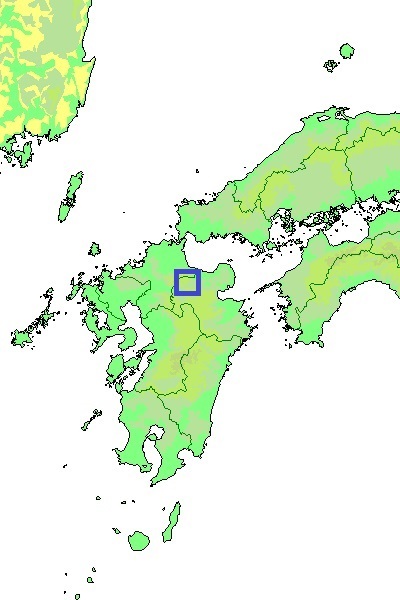 Nonaka clan was a tributary of Buzen Utsunomiya clan, which was a branch family of Utsunomiya clan resided which was a traditional family at Shimotsuke province (Tochigi prefecture). 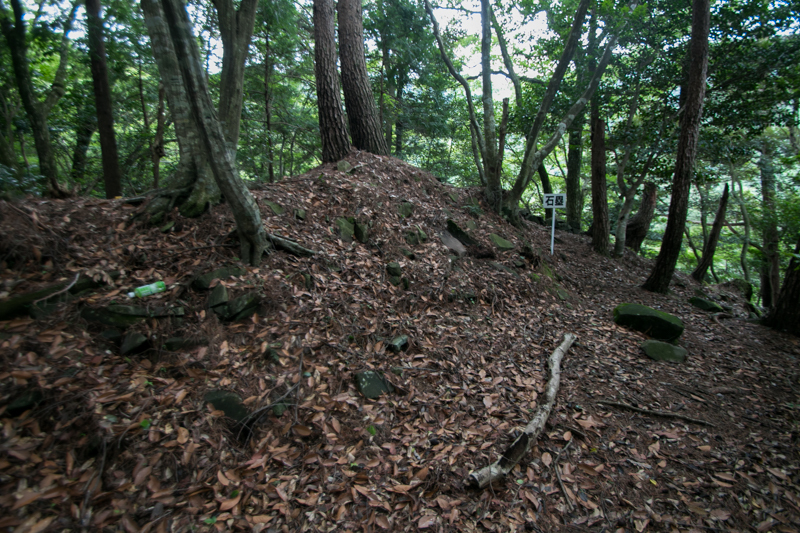 At the end of 12th century, Nobufusa Utsunomiya (1156-1234) who activated at the establishment of Kamakura Shogunate achieved his territory at the mountainous area of Buzen province which spreads at current Fukuoka prefecture and Oita prefecture. Other than Buzen province, Utsunomiya clan also held their territory at Chikugo province (south part of Fukuoka prefecture) and Iyo province (Ehime prefecture) then became the local lords of these areas. 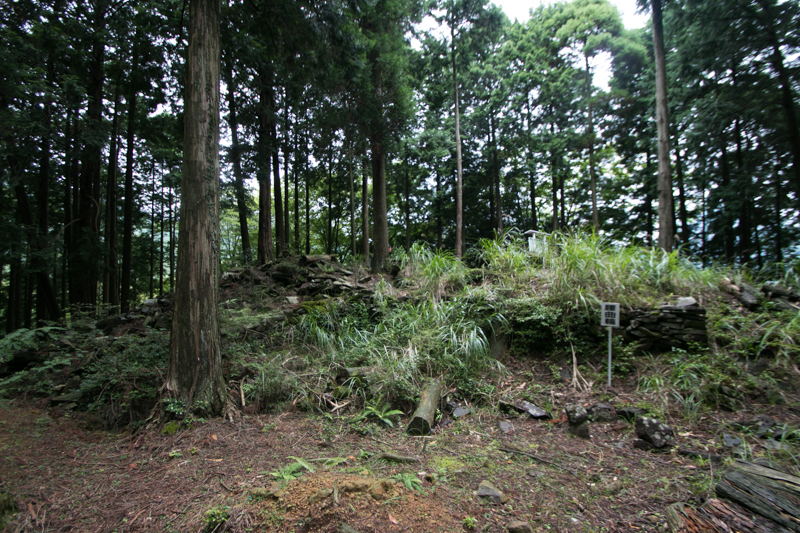 Utsunomiya clan at Buzen province placed their branch family including Nonaka clan around their territory and once prospered, but lost their power in the conflict of South Court and Muromachi Shogunate and fell into local lord of the area. 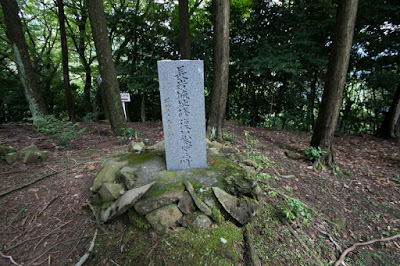 Later Utsunomiya clan changed their name to Kii clan utilizing their territory, but being supported by the fame of their ancestor and secure main base, Utsunomiya clan kept as the leader position of local lords of Buzen province. 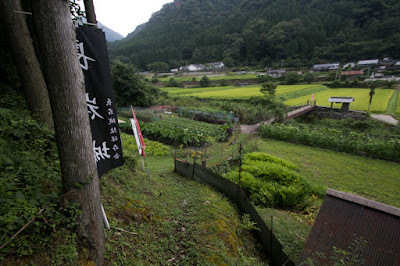 Nonaka clan started from Shigefusa Nonaka (?-? 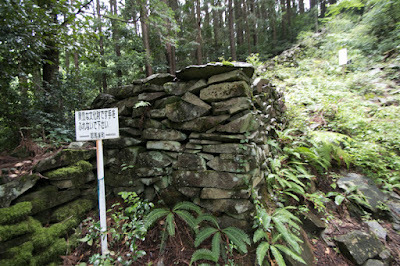 ), the brother of Nobufusa Utsunomiya. 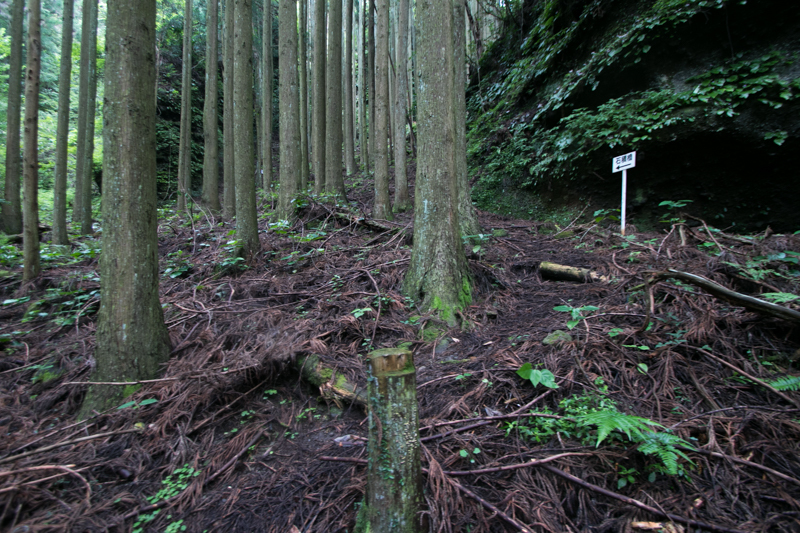 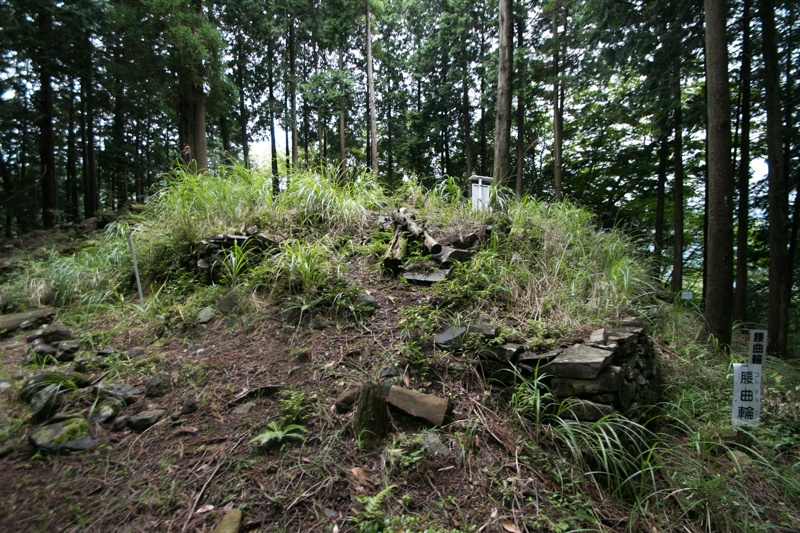 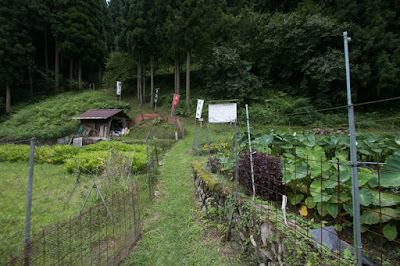 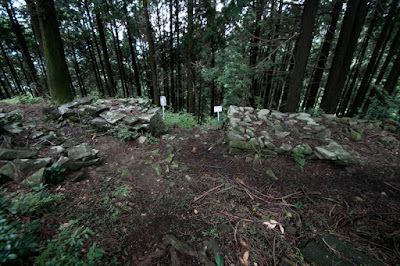 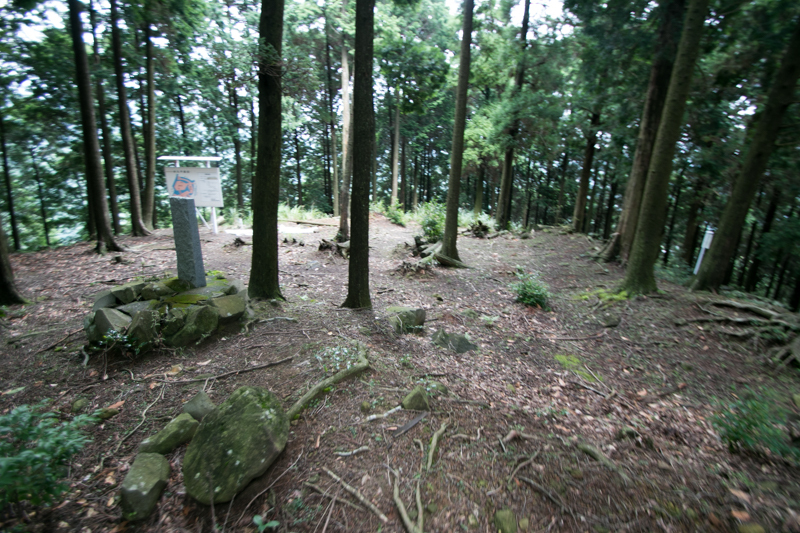 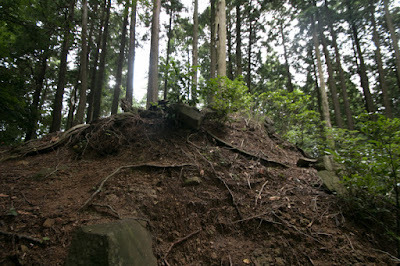 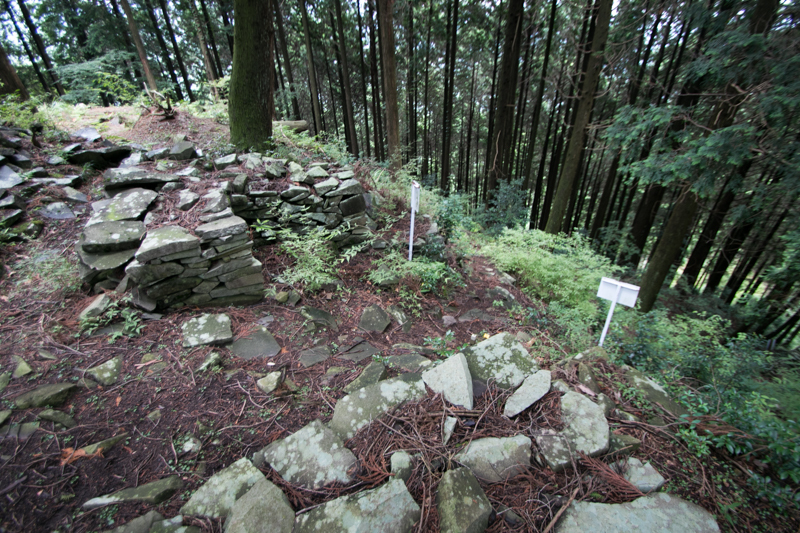 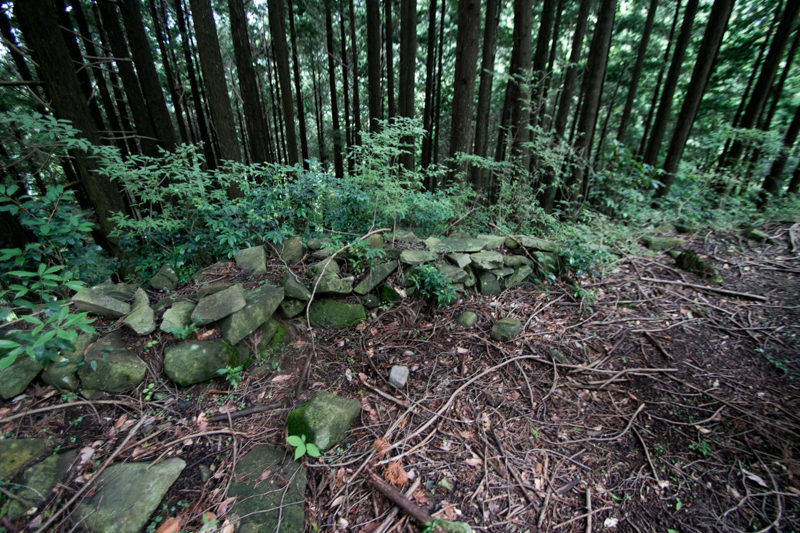 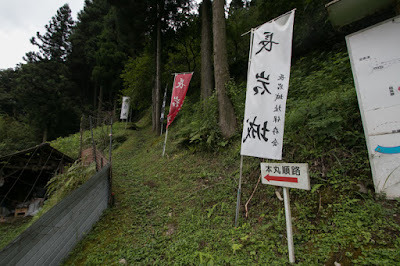 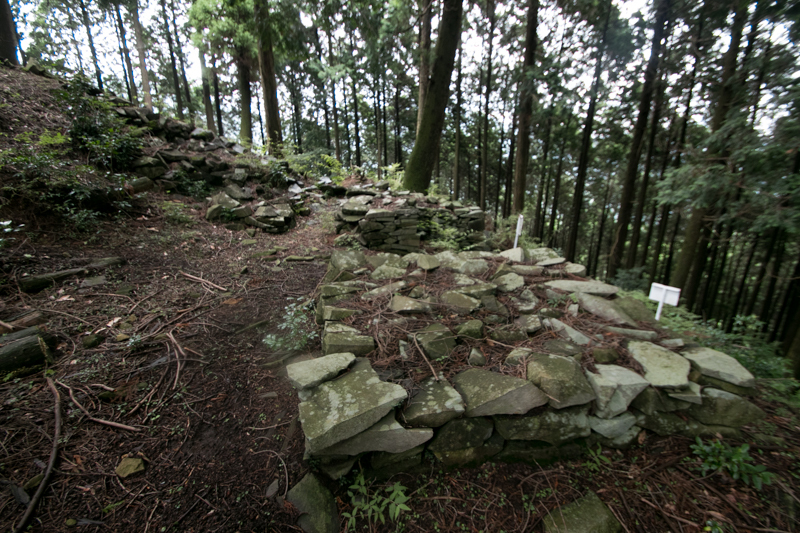 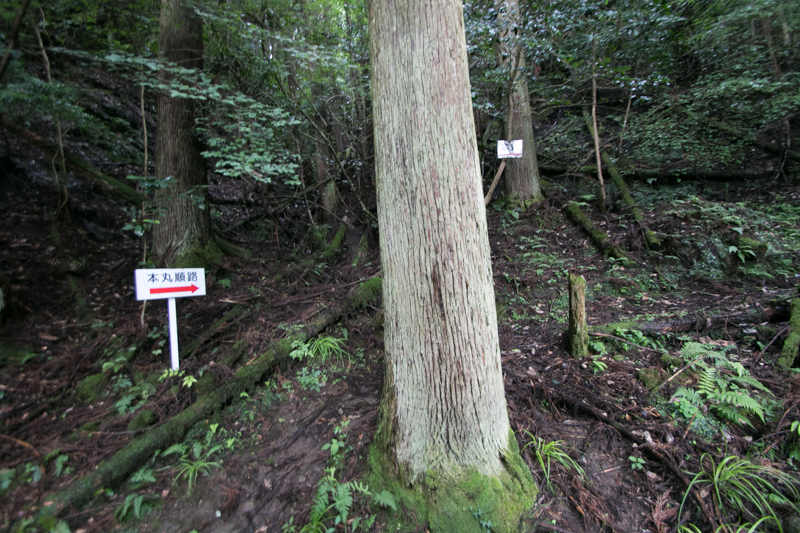 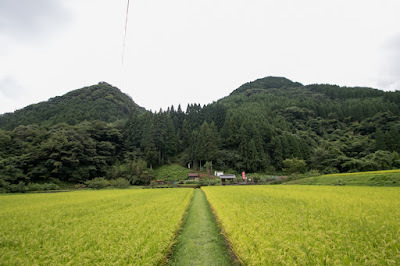 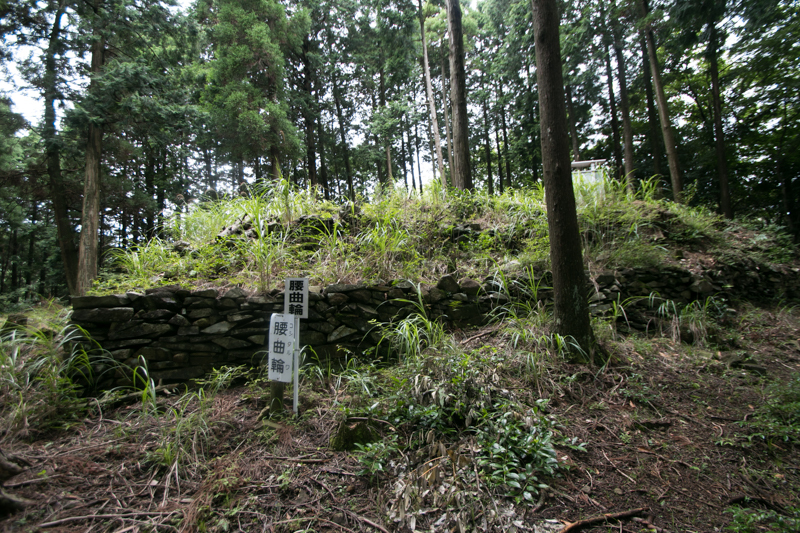 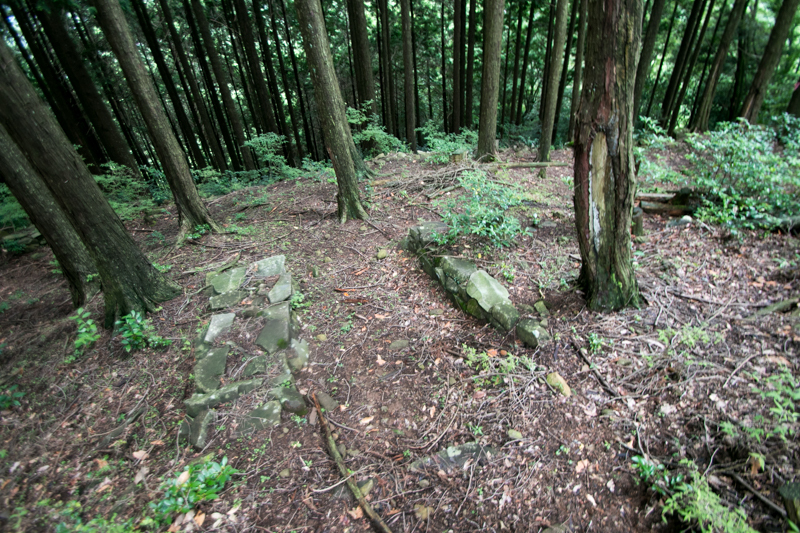 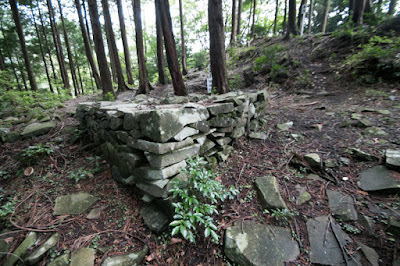 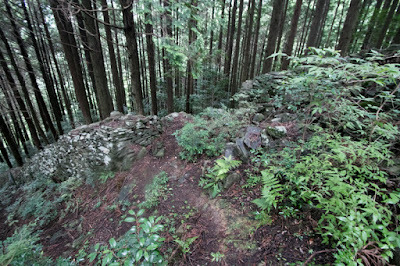 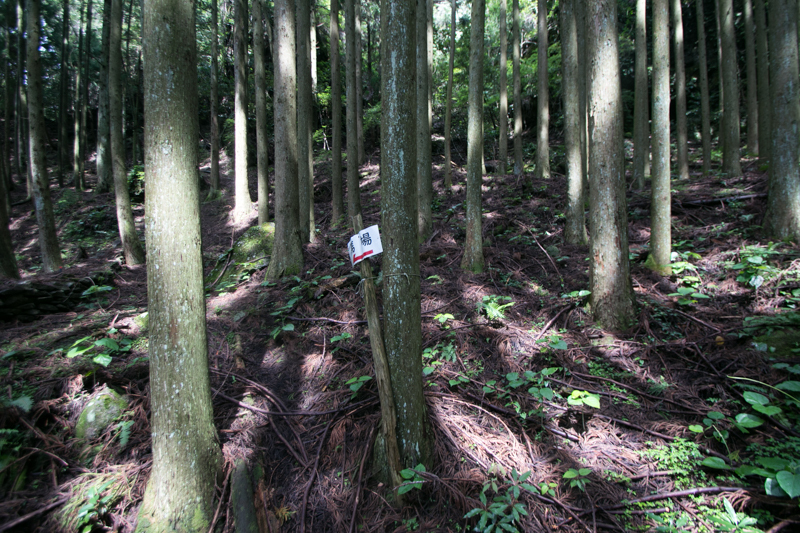 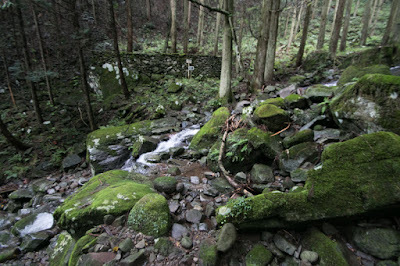 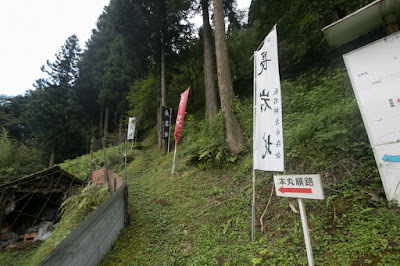 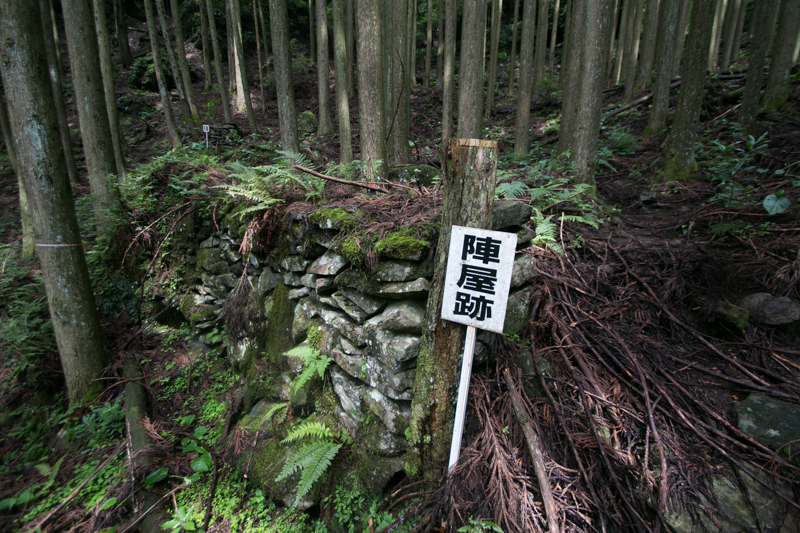 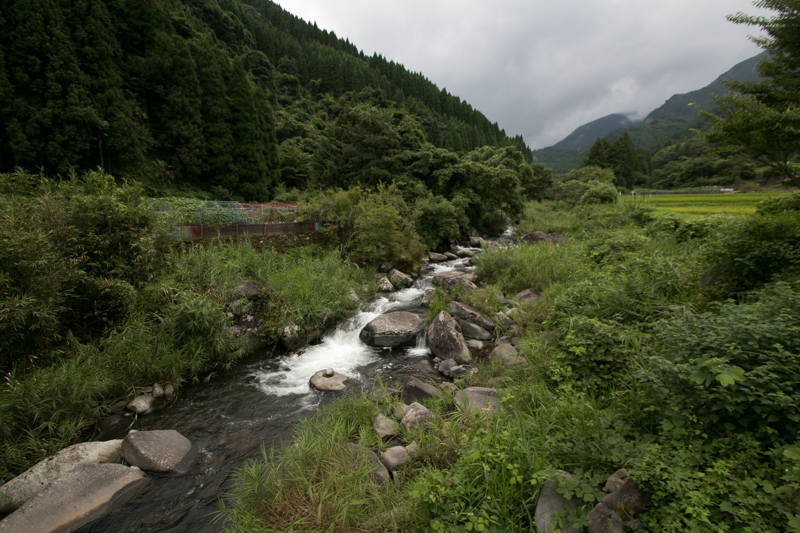 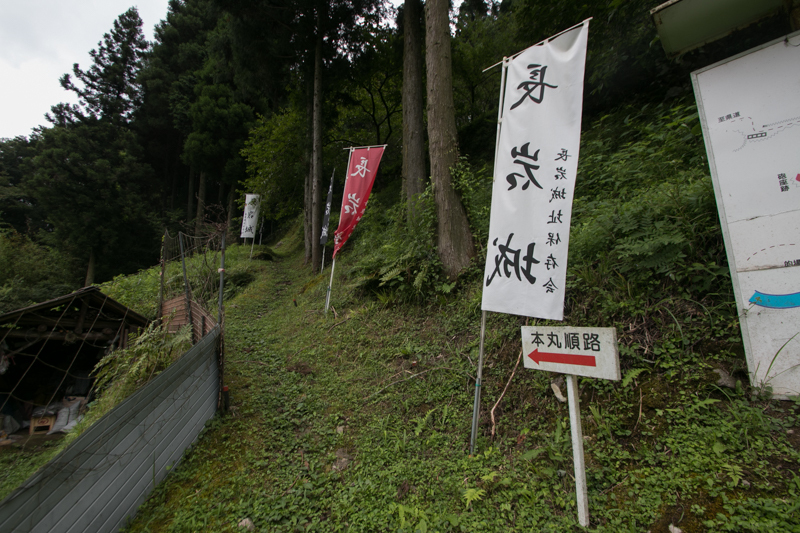 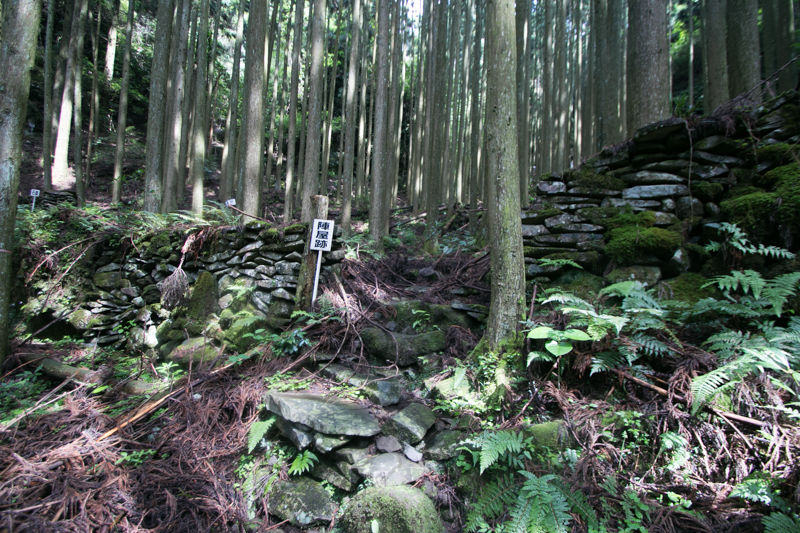 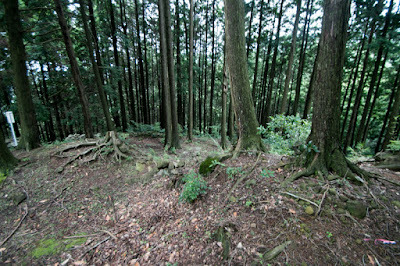 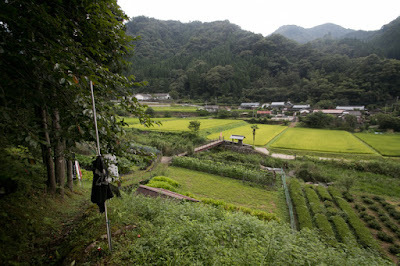 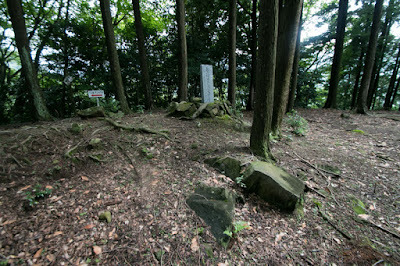 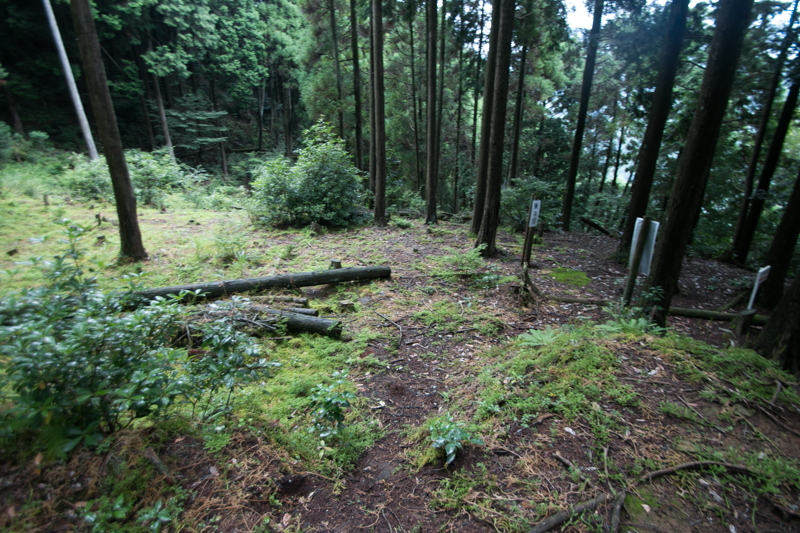 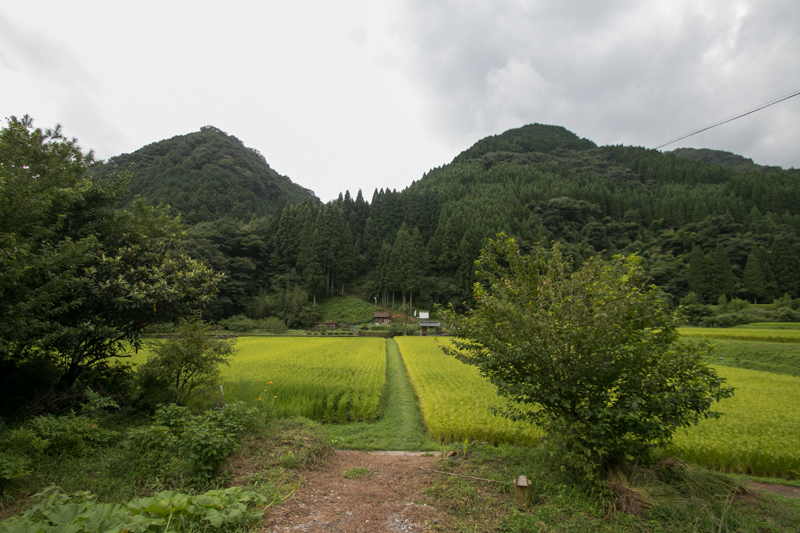 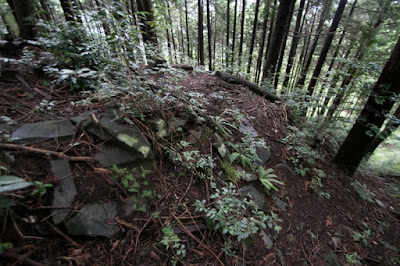 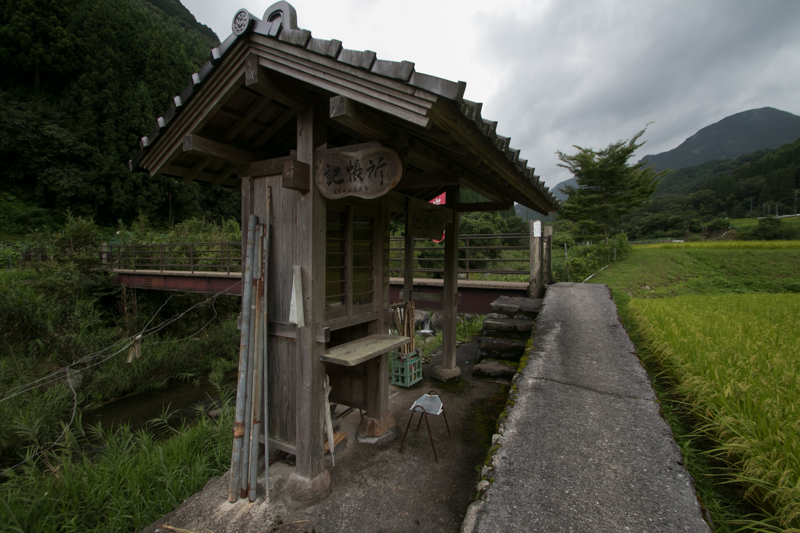 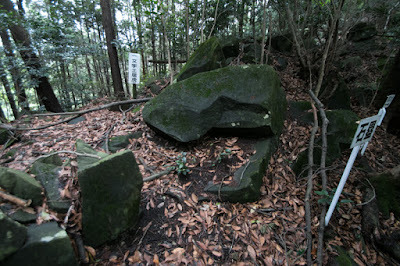 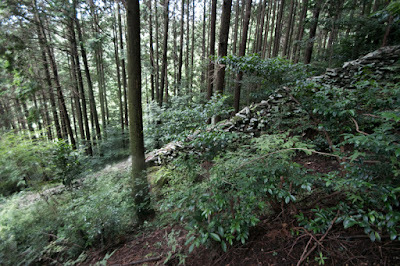 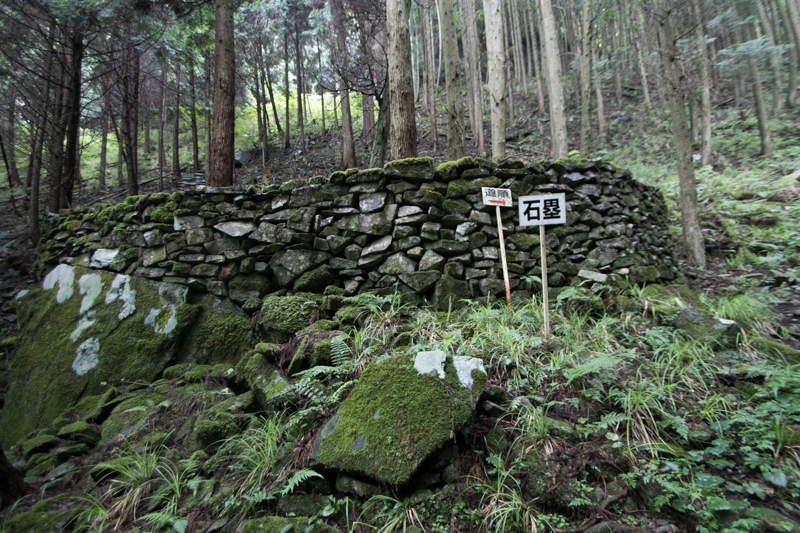 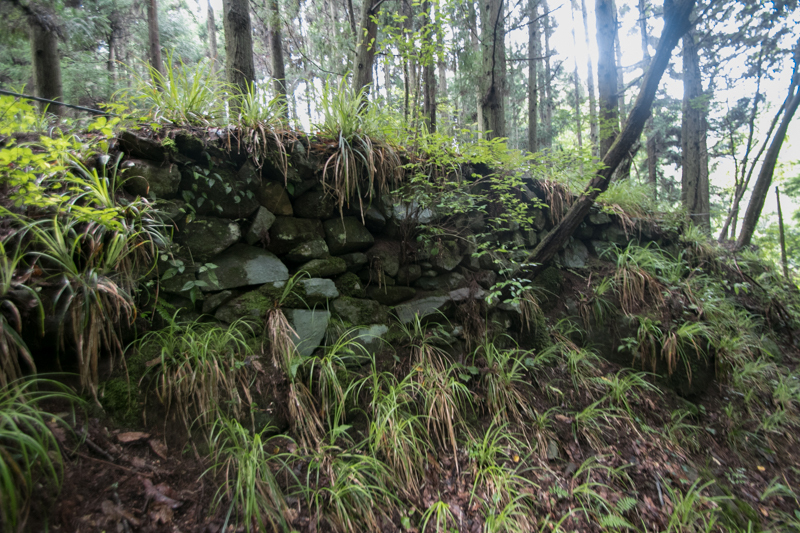 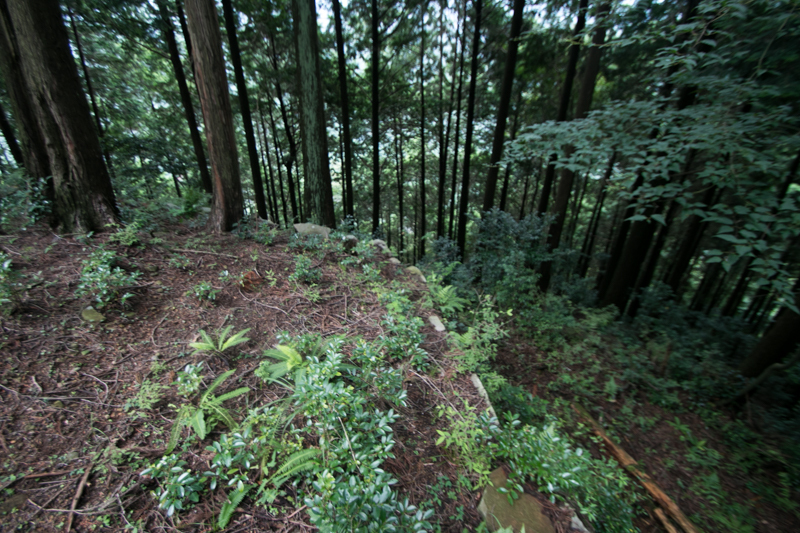 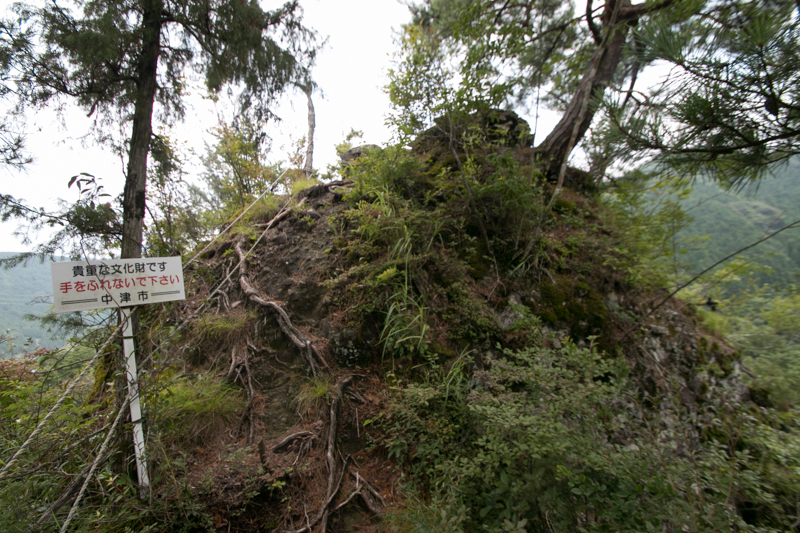 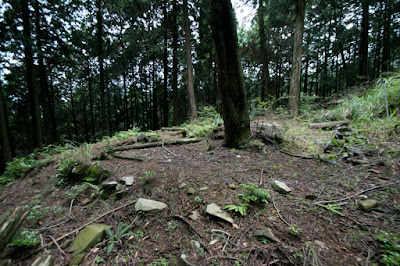 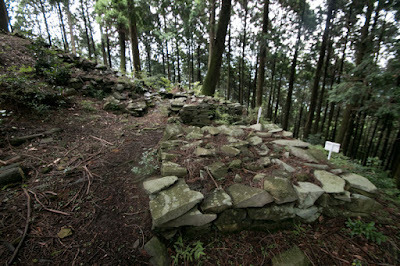 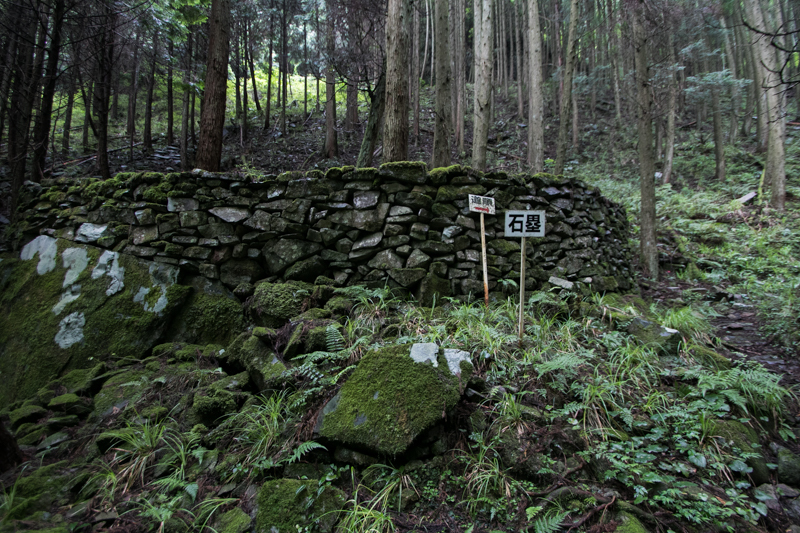 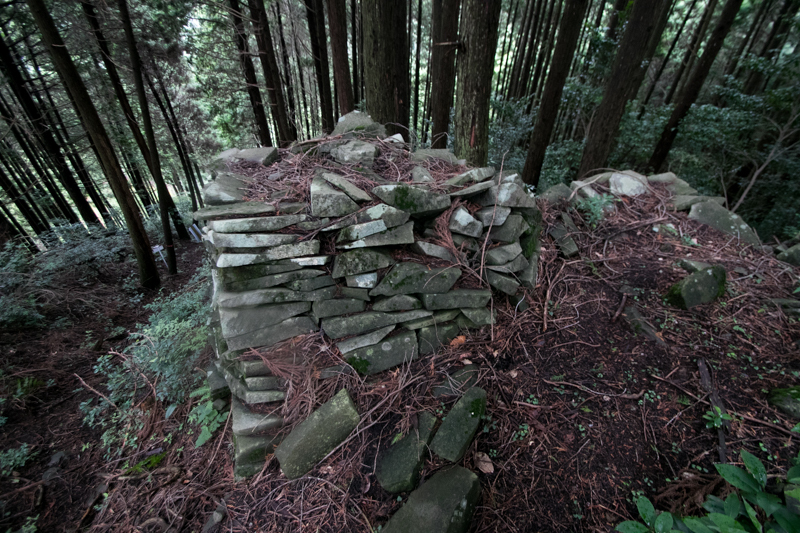 Currently Tsutami valley and Kinoi valley, which was the main base of Buzen Utsunomiya clan was distant, but it was only five kilometer apart at the both side of steep mountain. 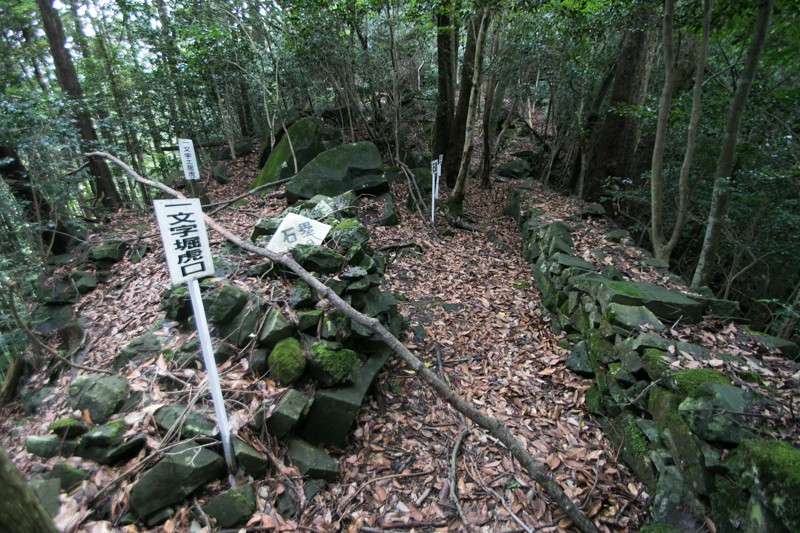 Because of this geographical condition, Nonaka clan followed the main family of Buzen Utsunomiya clan, along with Nakama clan of Hitotsudo castle (Oita prefecture) at 4 kilometer southeast. 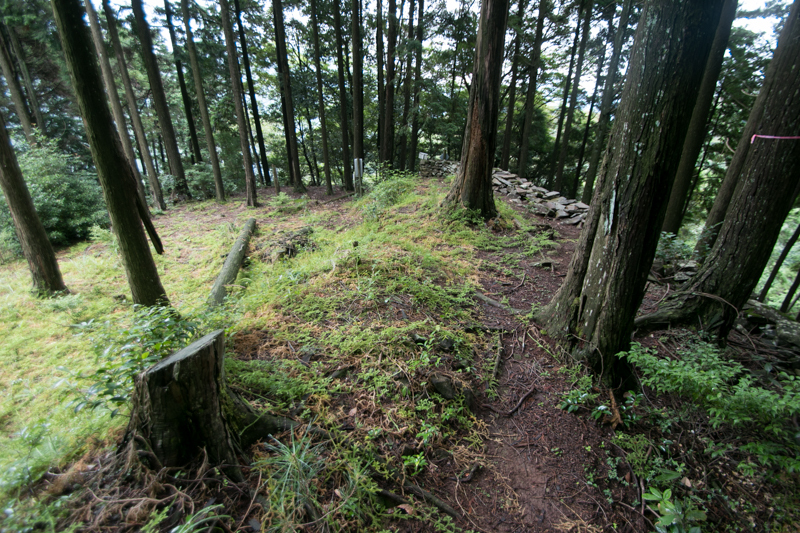 In the former half of 15th century, Buzen Utsunomiya clan and Nonaka clan followed to Ouchi clan, which was a strong warlord of Nagato province (Yamaguchi prefecture) also held Buzen province as their territory. But Ouchi clan was ruined by the revolt of their retainer Harukata Sue (1521-1555), Ouchi clan lost their power and Buzen province was held by Otomo clan, the governor of Bungo province (Oita prefecture). At the fall of Ouchi clan Nonaka clan once tried to be an independent lord. 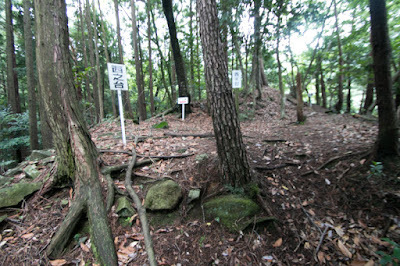 but being attacked by Otomo clan in 1557 Nonaka clan had to subordinate to Otomo clan. Nonaka clan expanded their main base Nagaiwa castle, and waited for the next change of their independence. Nagaiwa castle is built utilizing two peaks and one valley between them spread from southeastward mountain. 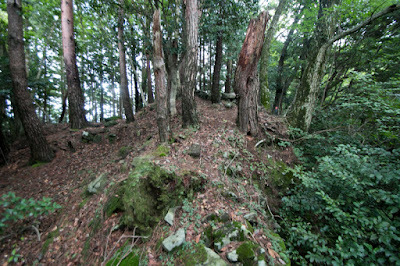 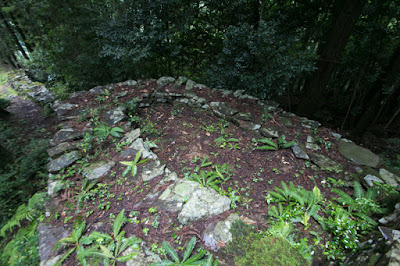 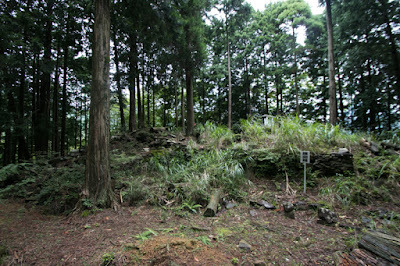 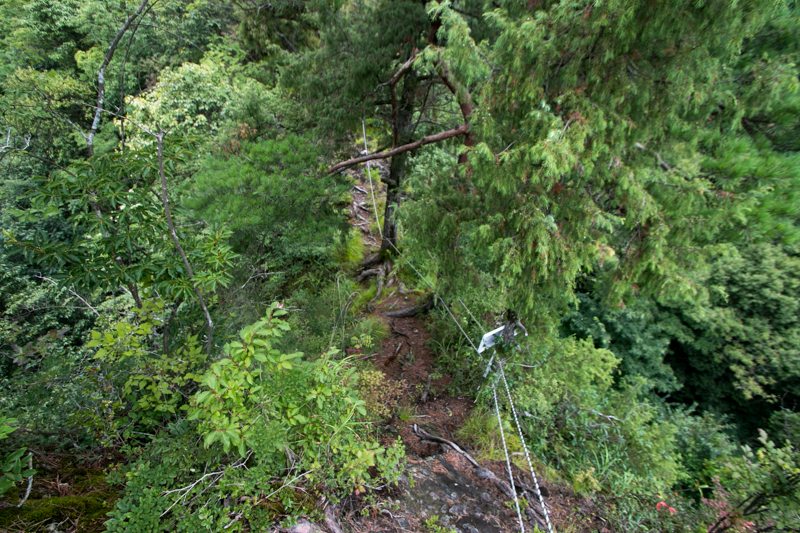 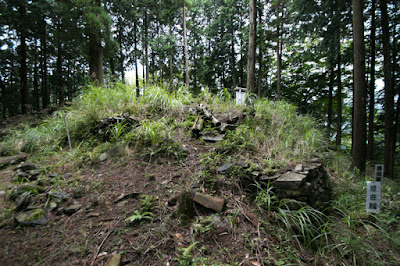 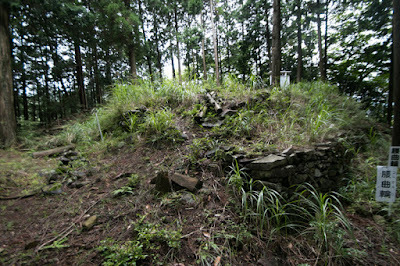 The central area of the castle is a square area of about 30 meter long at the top of western peak. 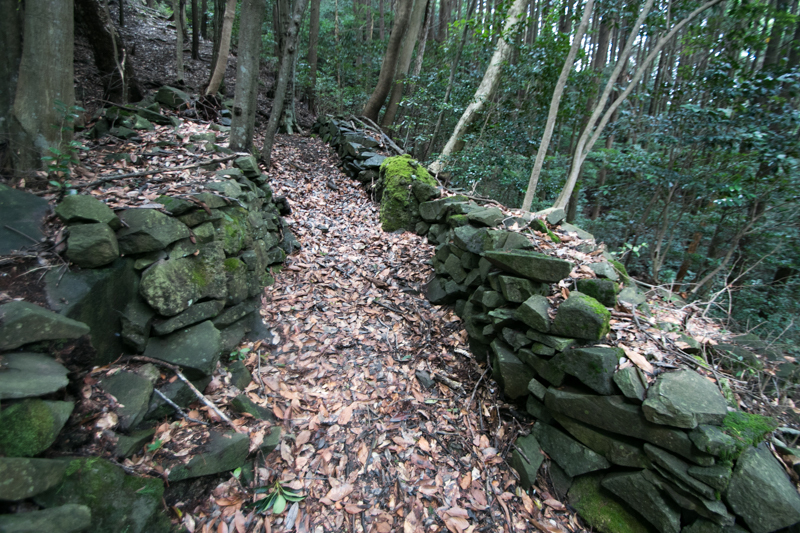 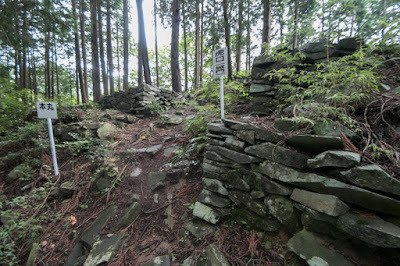 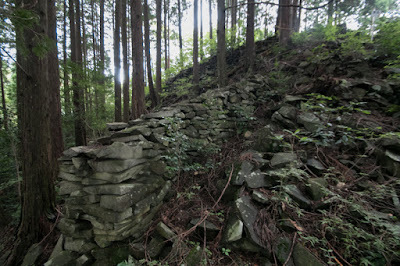 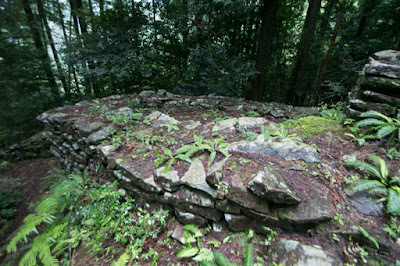 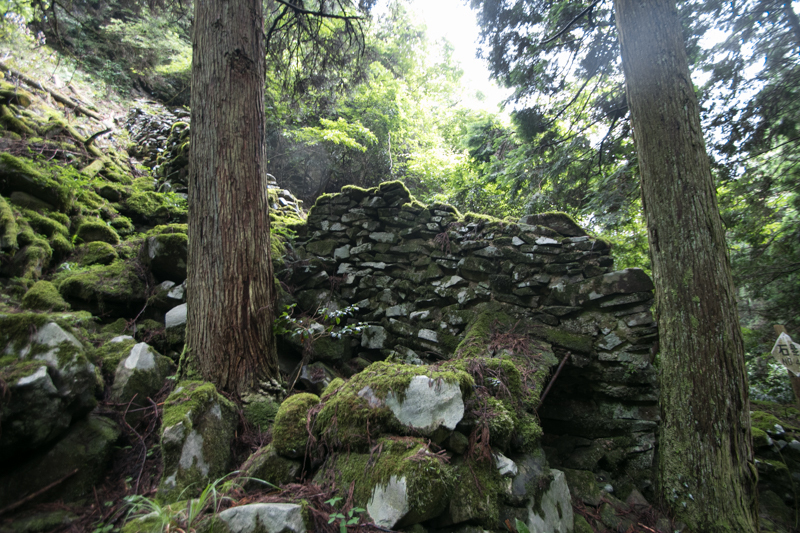 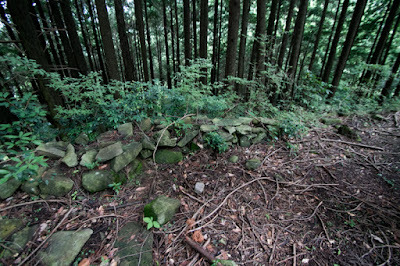 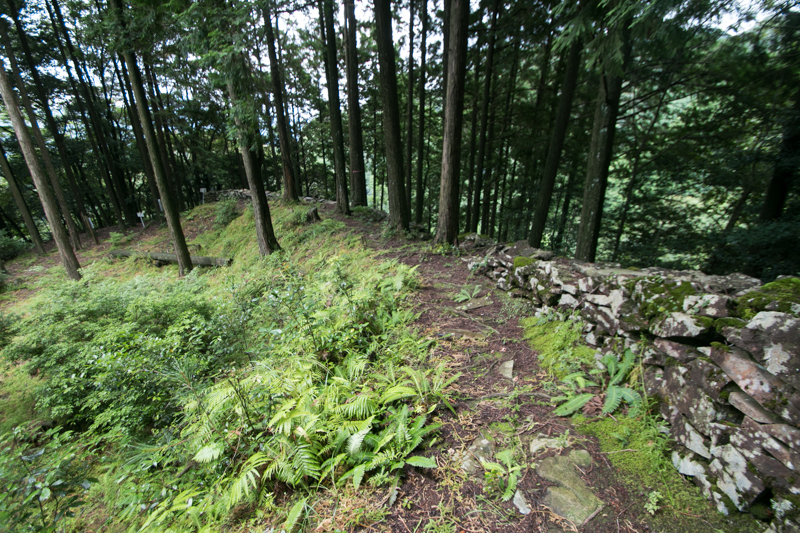 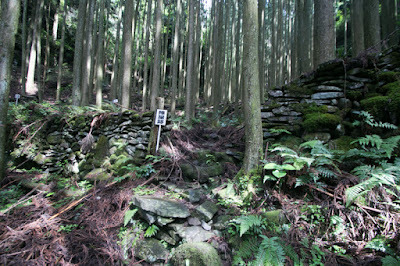 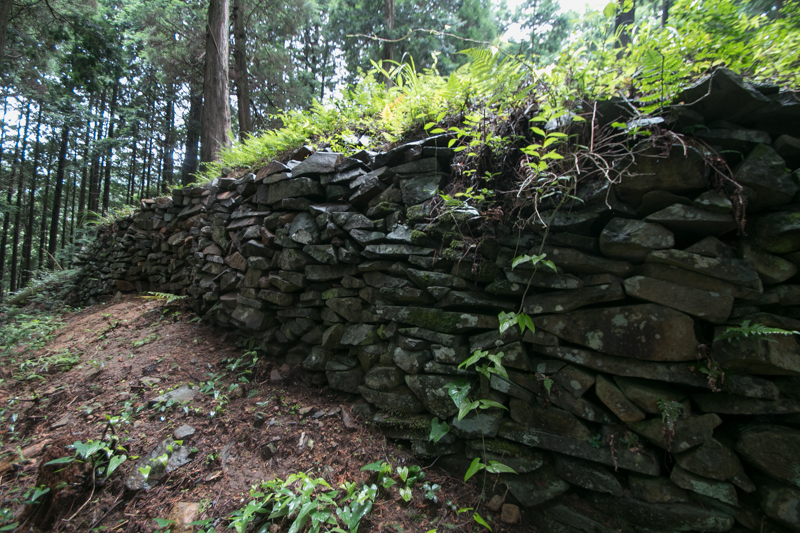 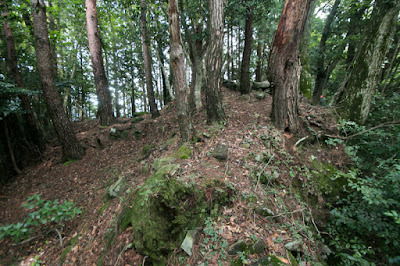 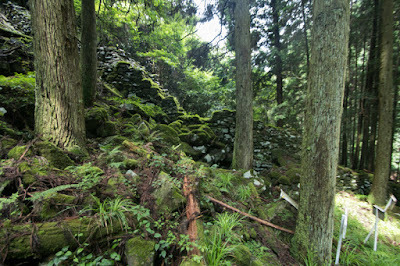 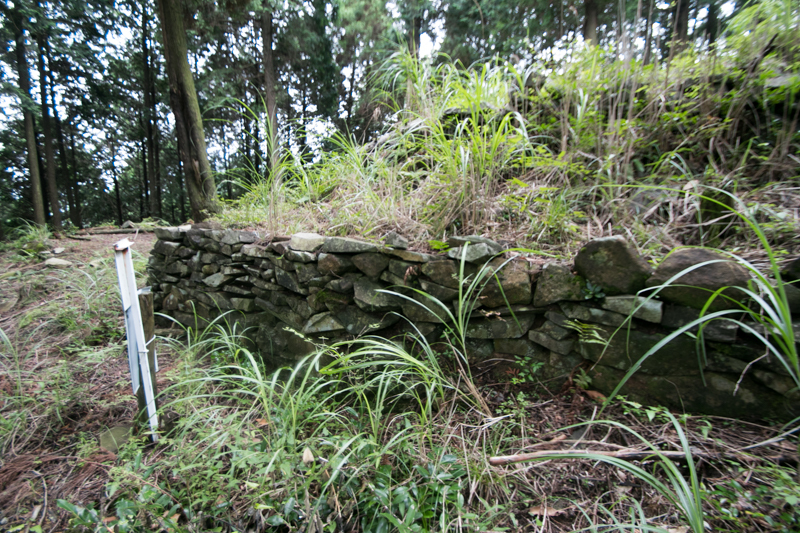 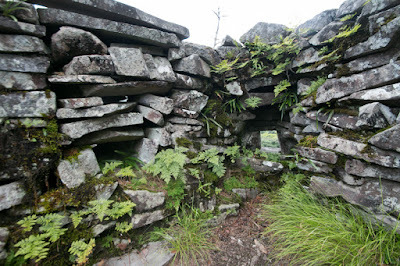 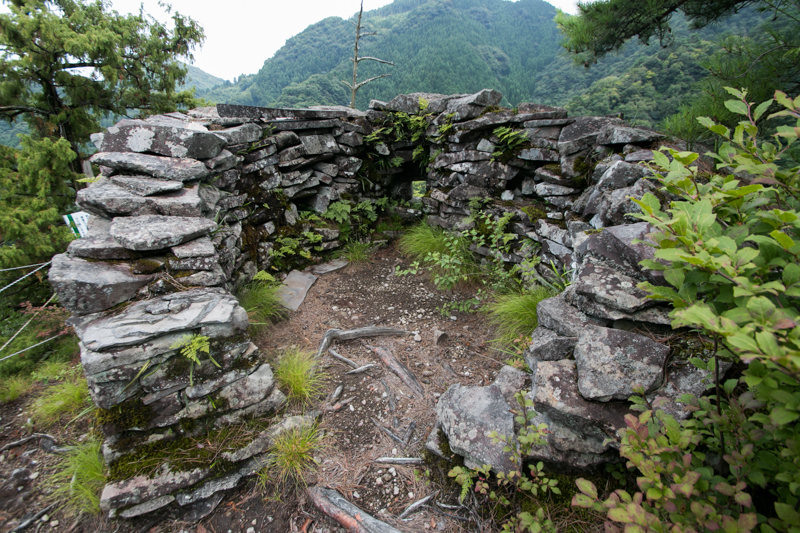 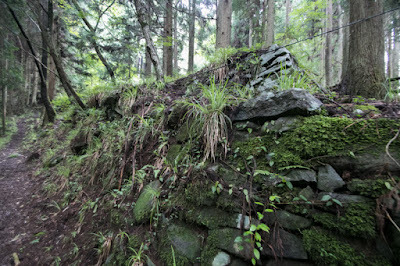 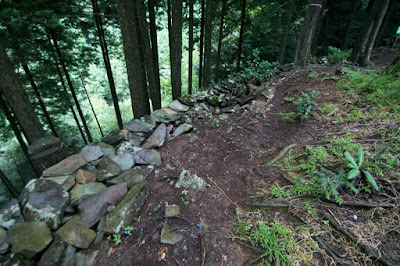 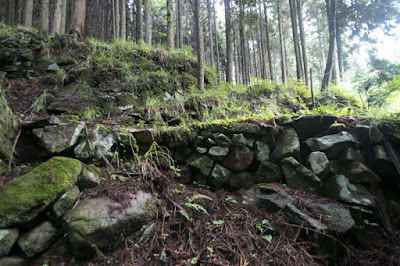 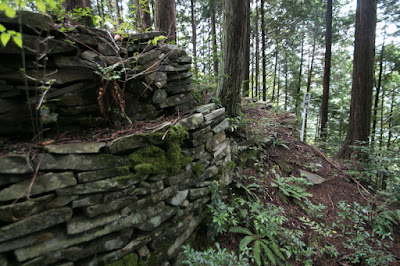 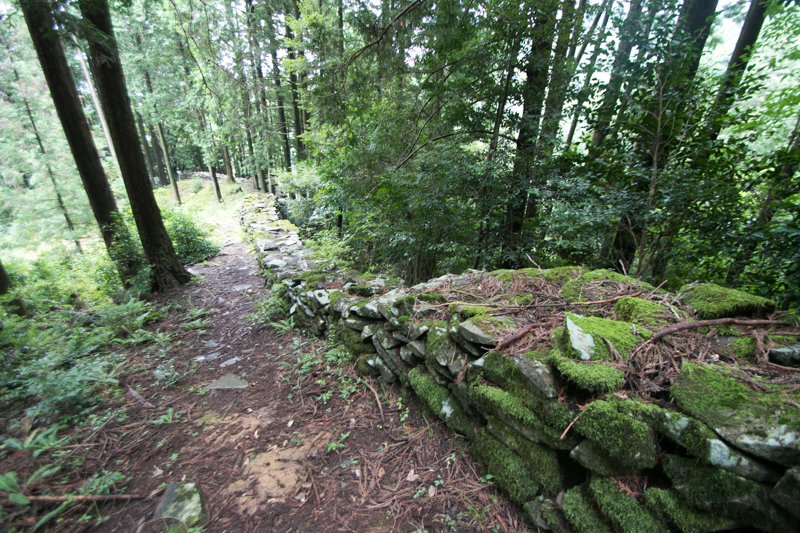 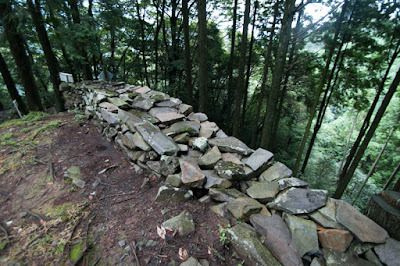 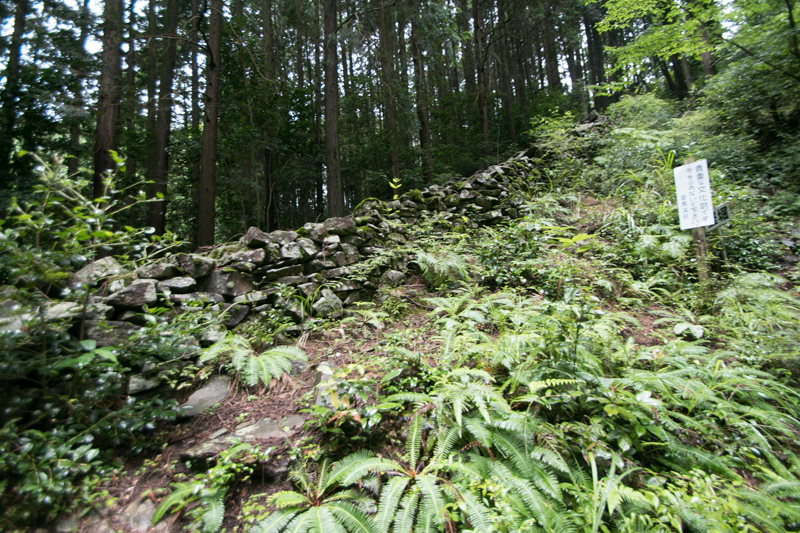 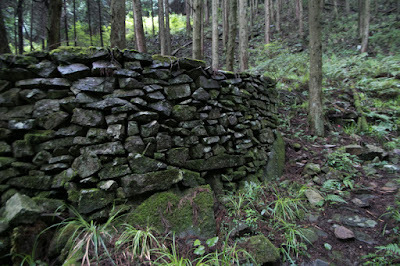 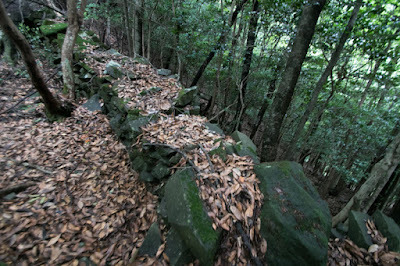 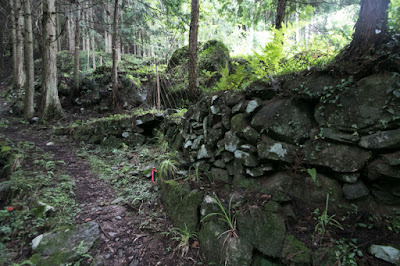 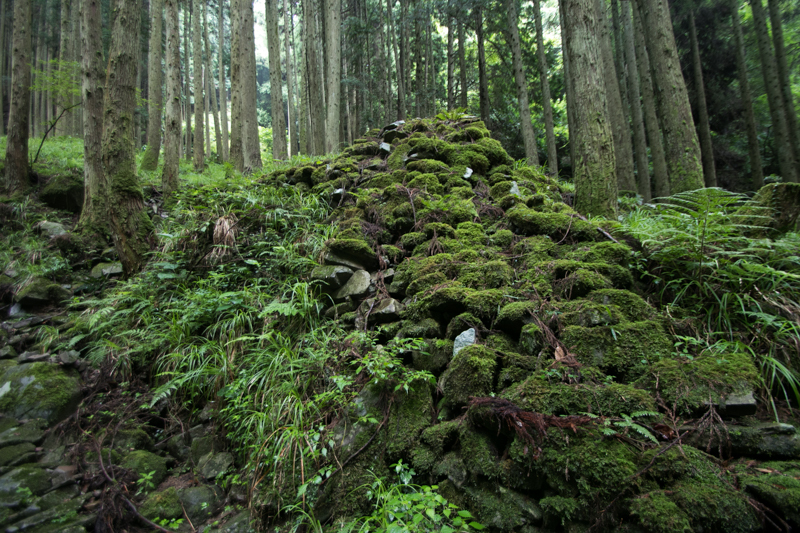 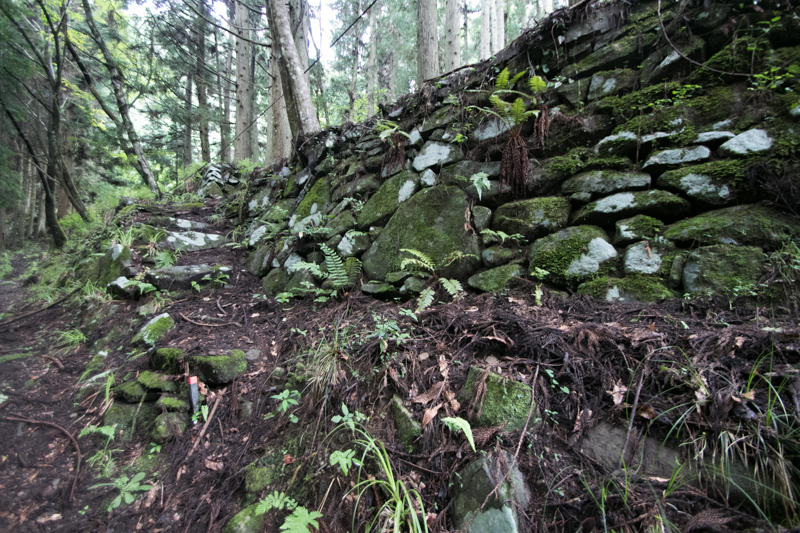 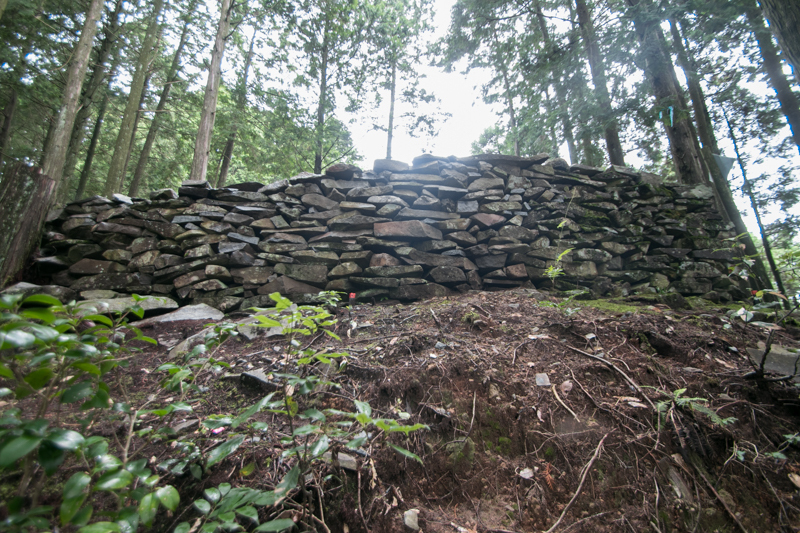 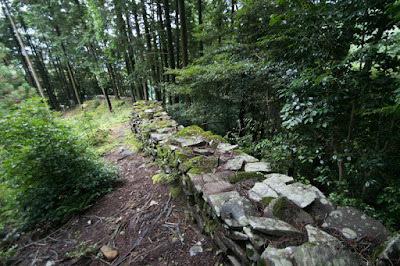 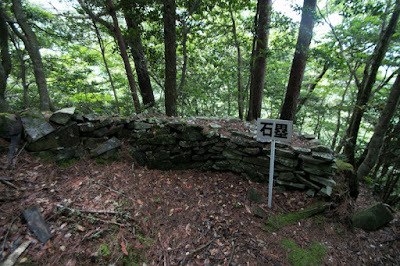 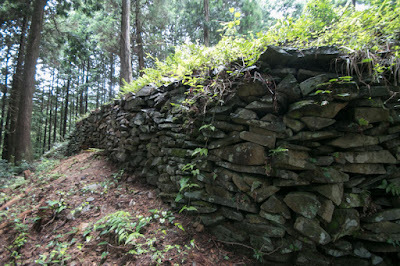 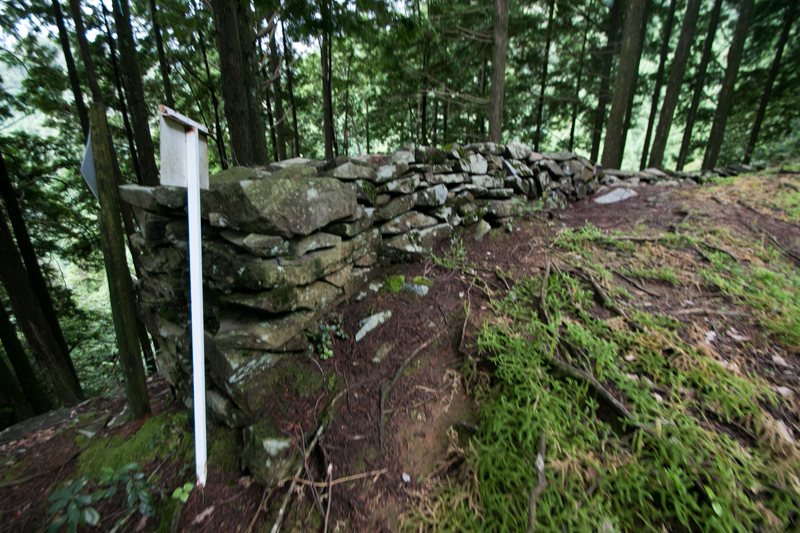 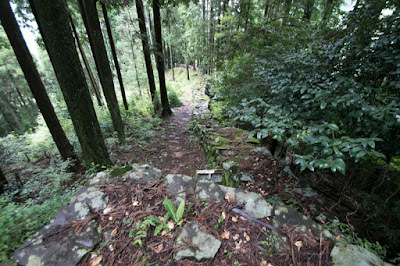 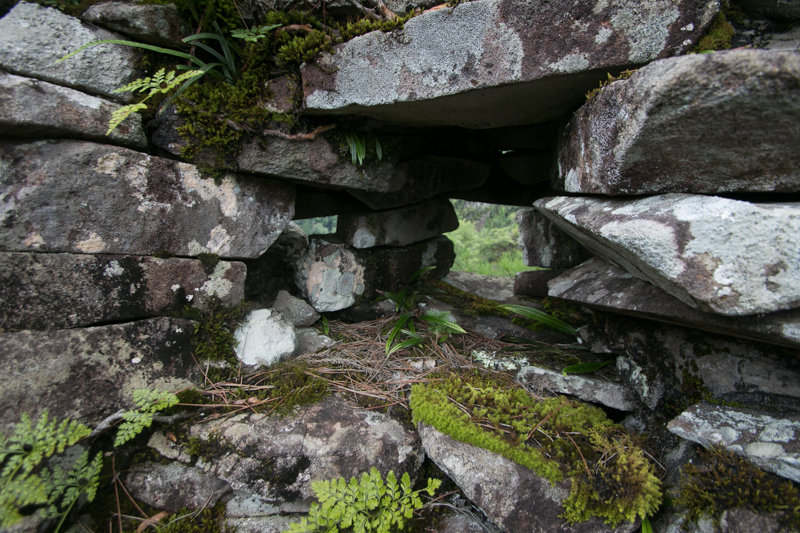 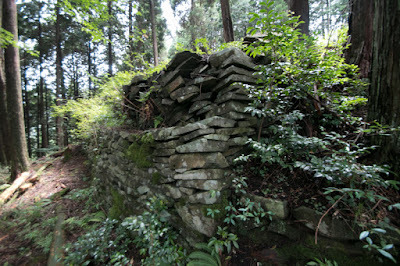 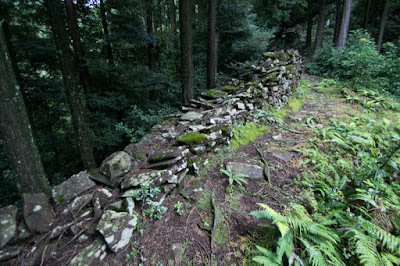 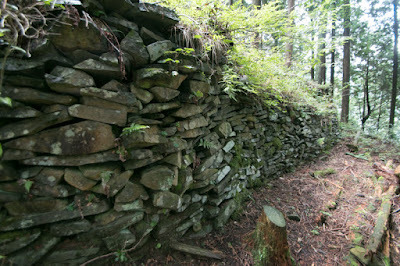 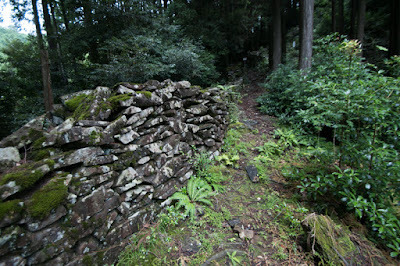 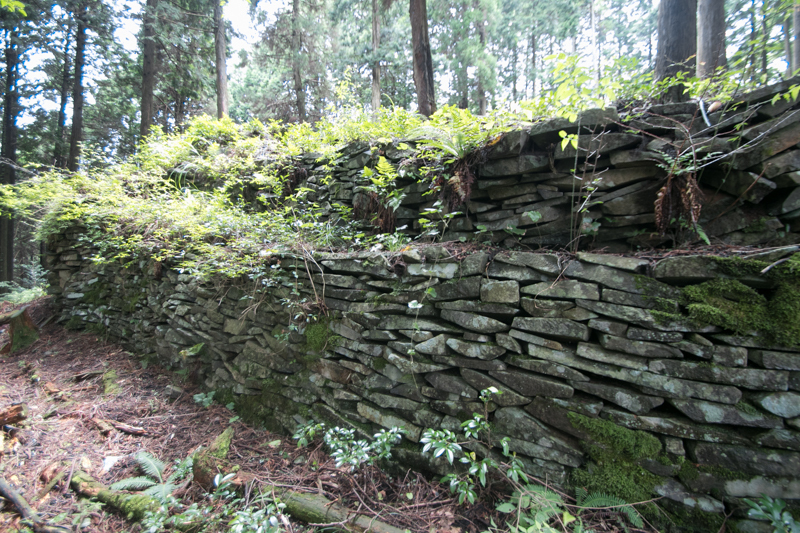 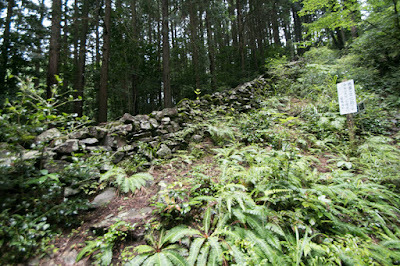 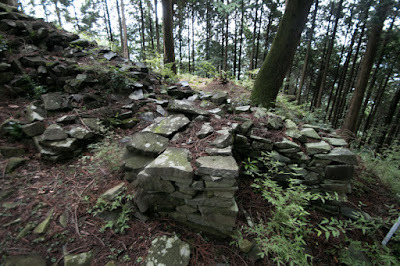 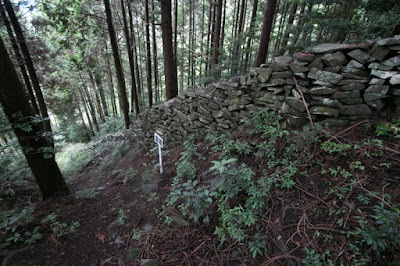 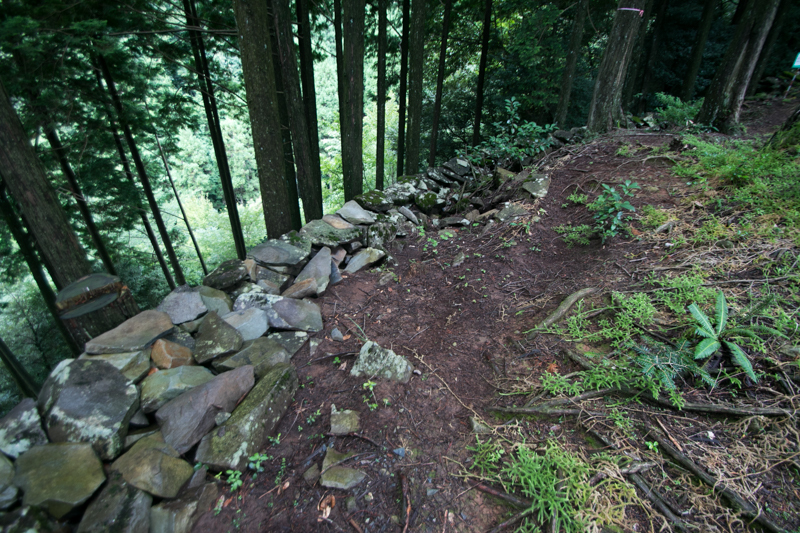 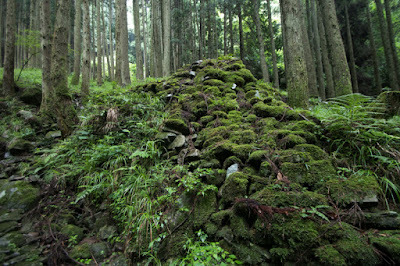 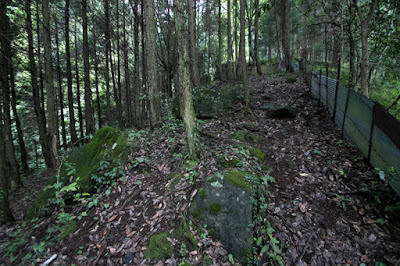 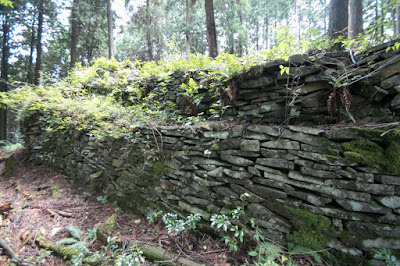 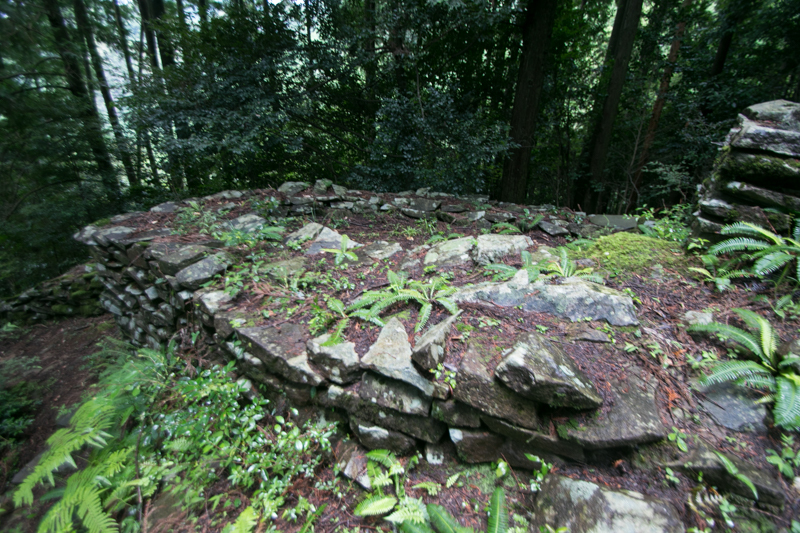 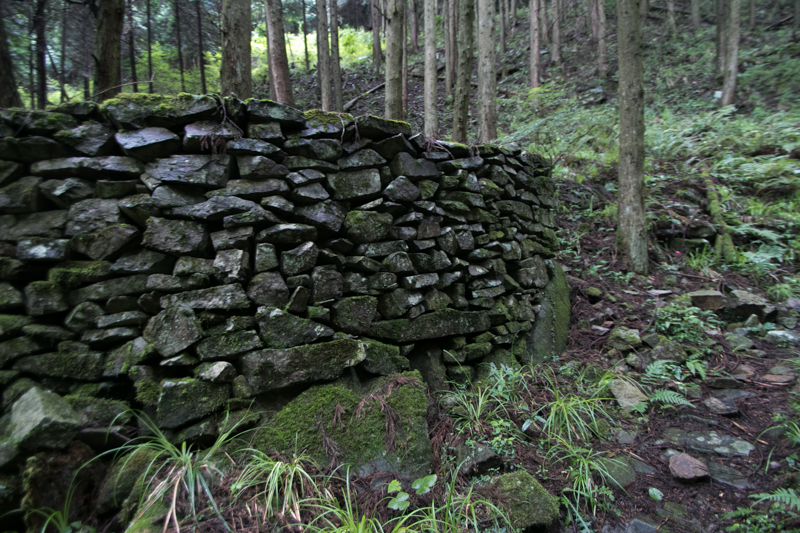 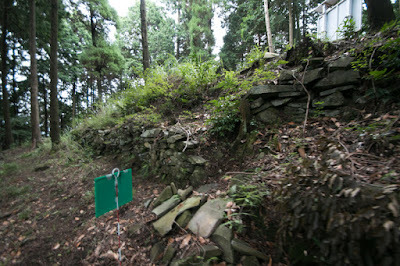 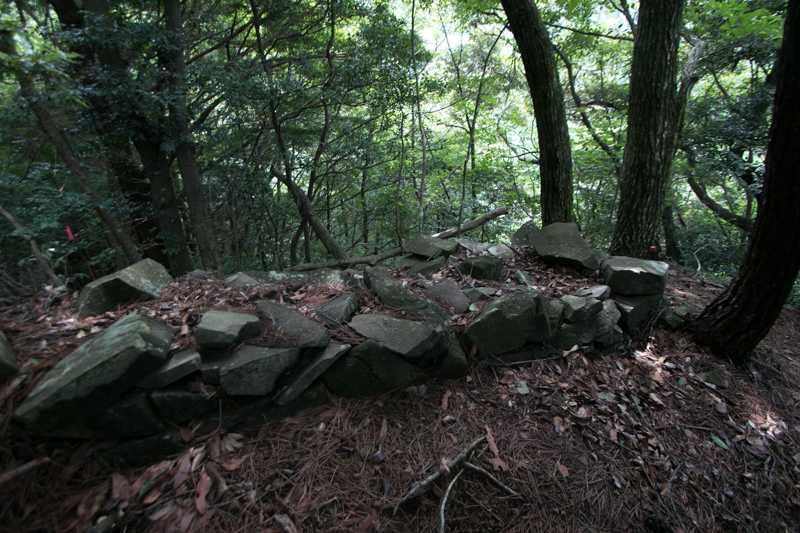 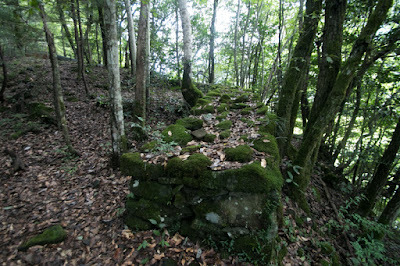 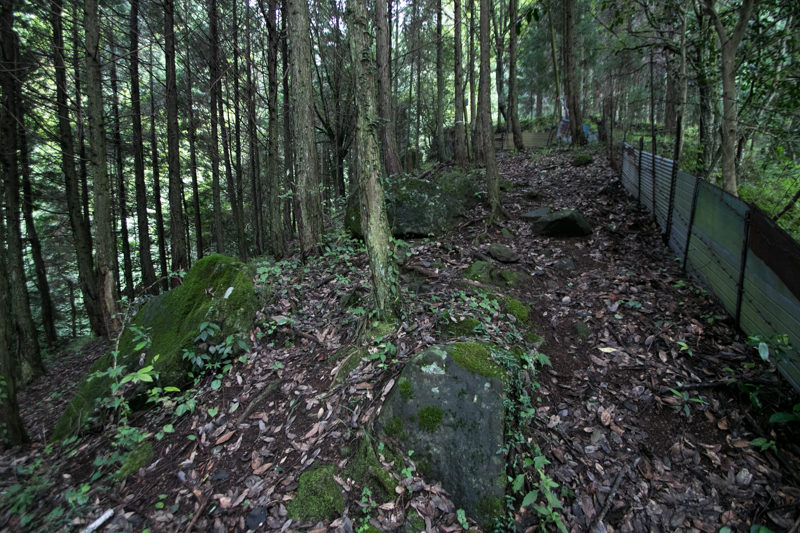 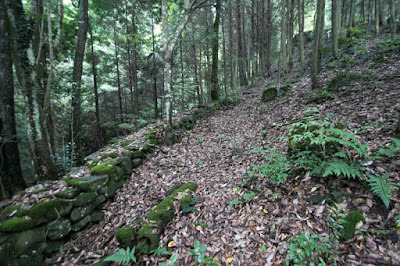 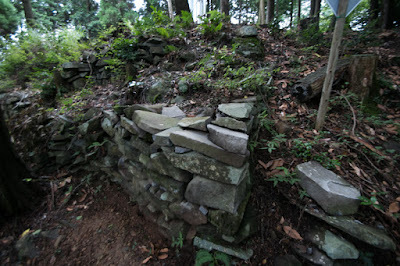 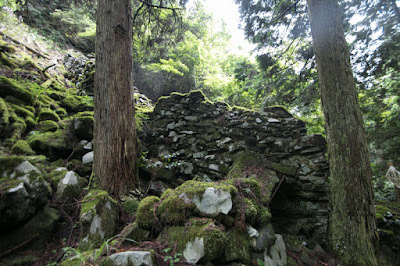 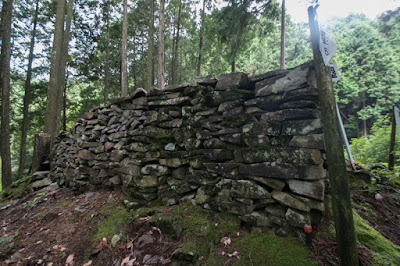 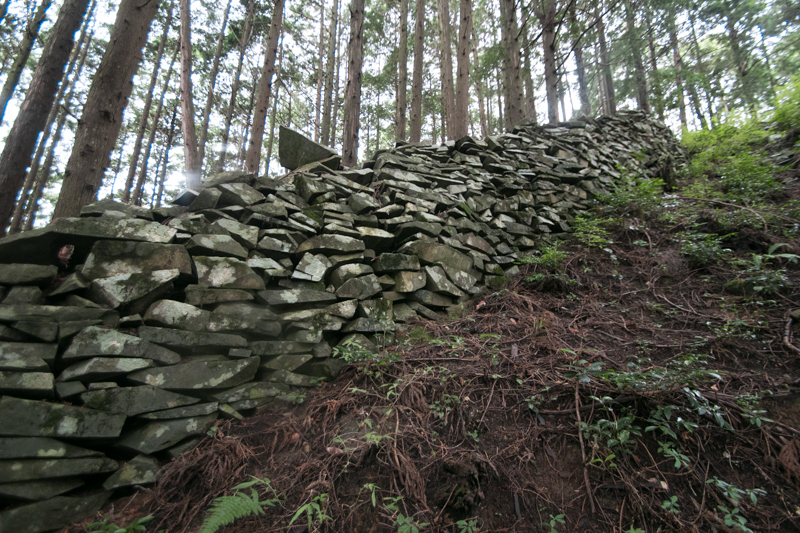 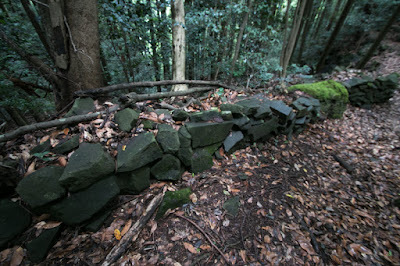 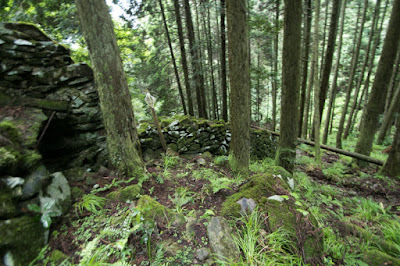 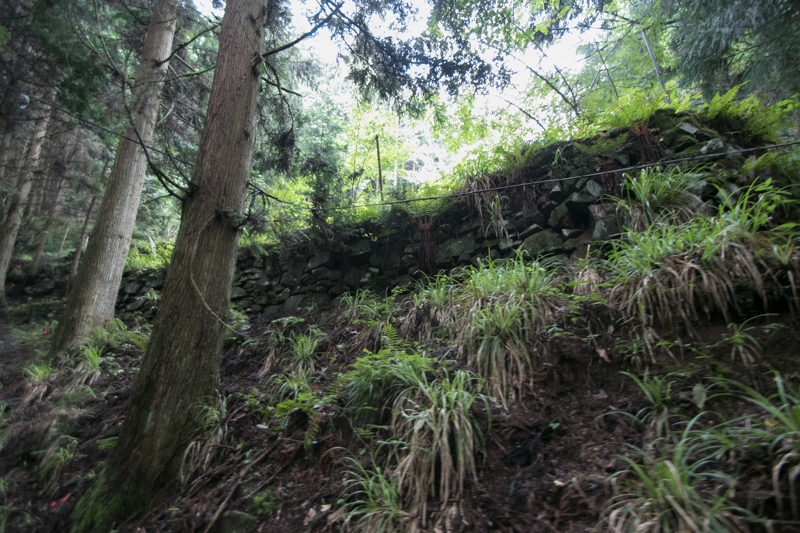 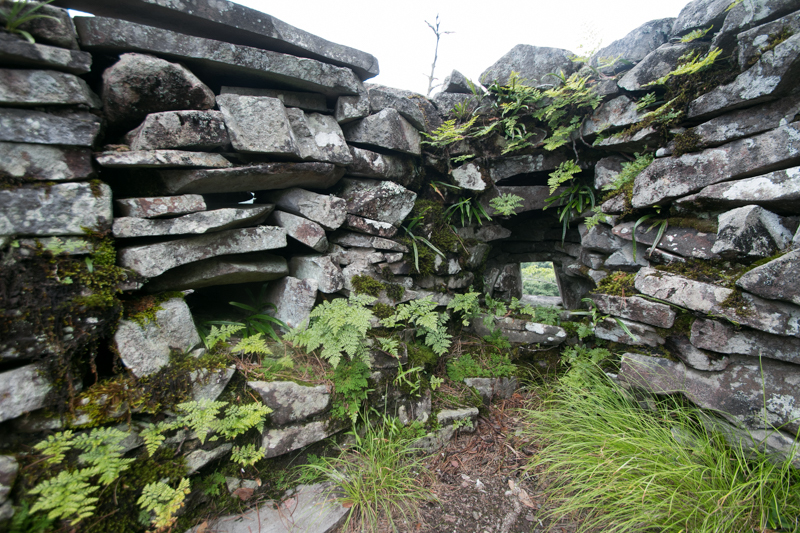 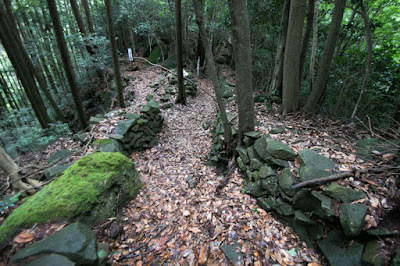 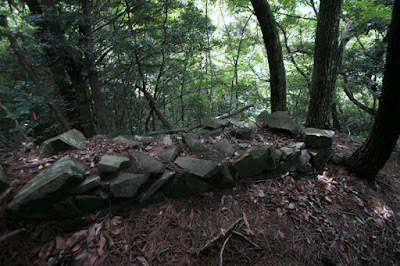 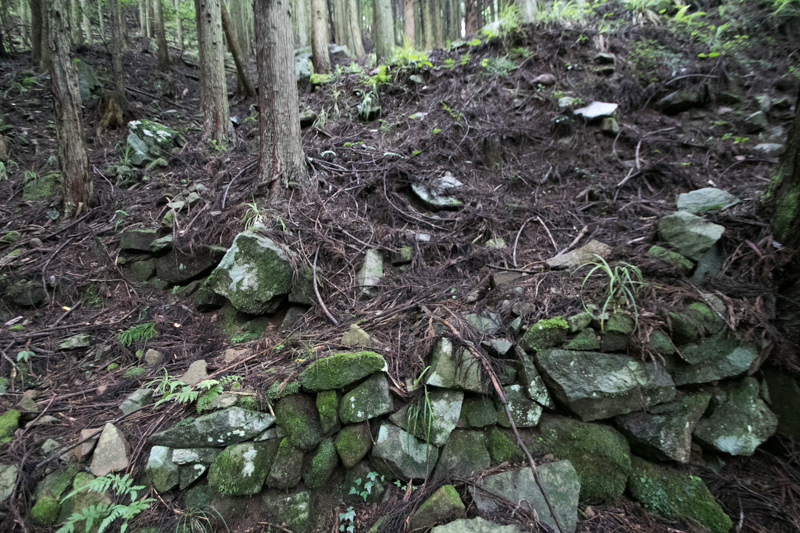 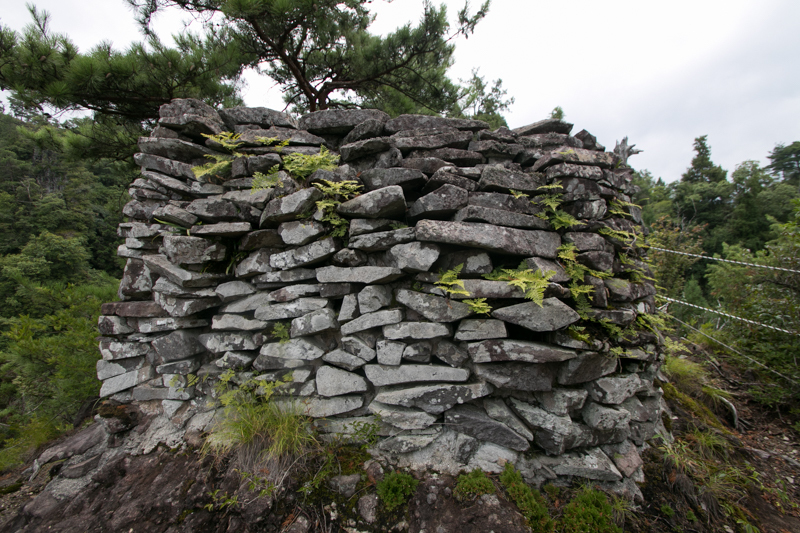 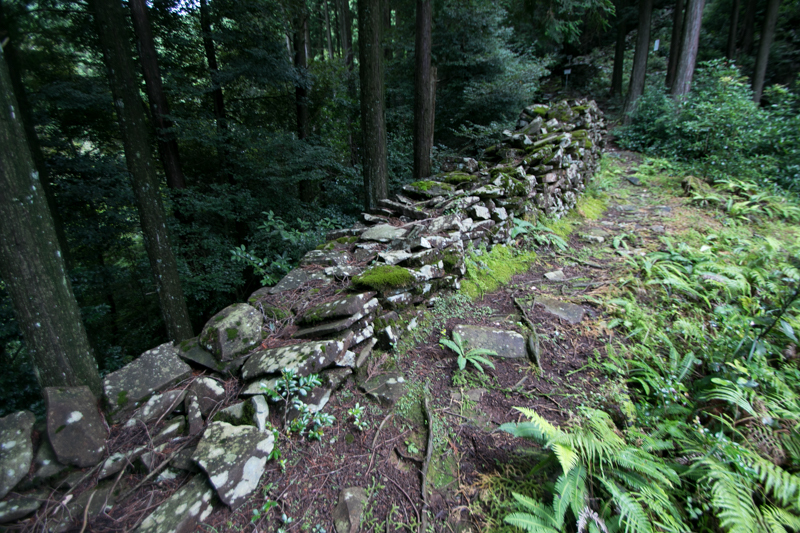 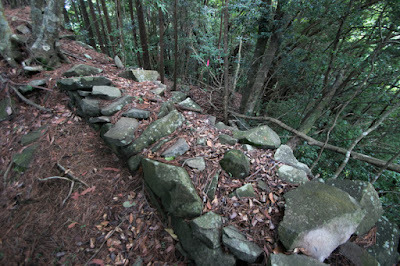 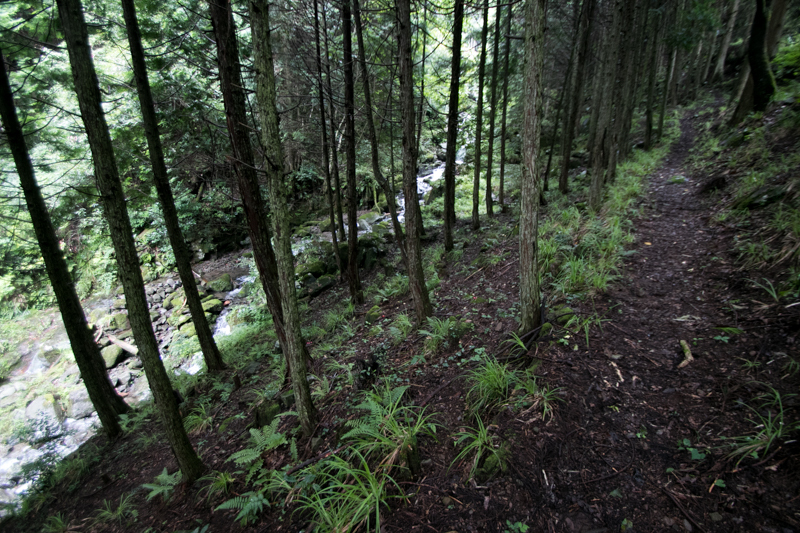 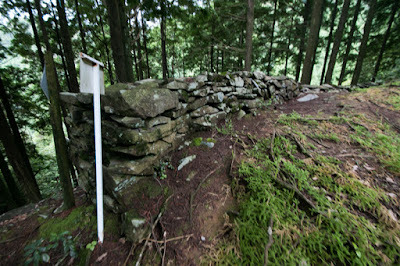 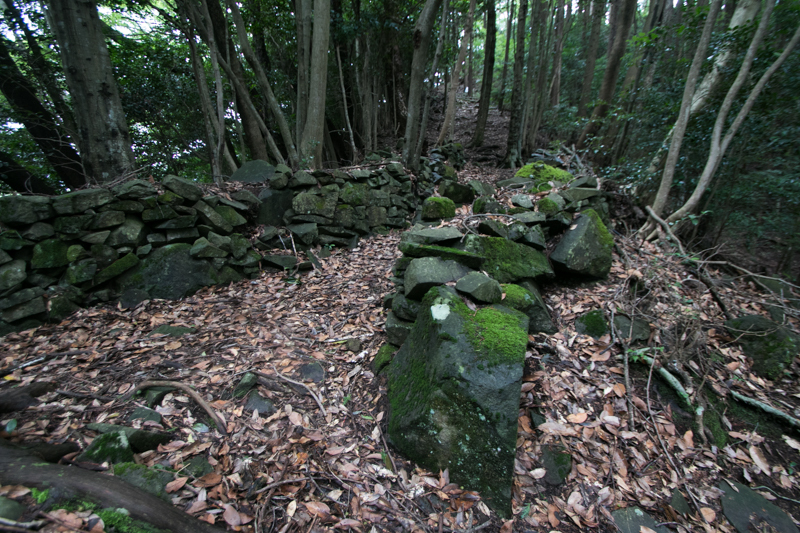 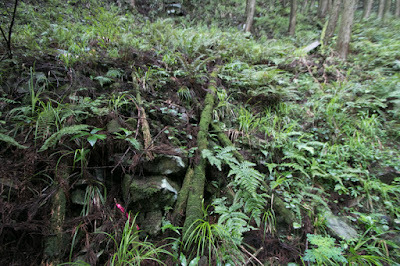 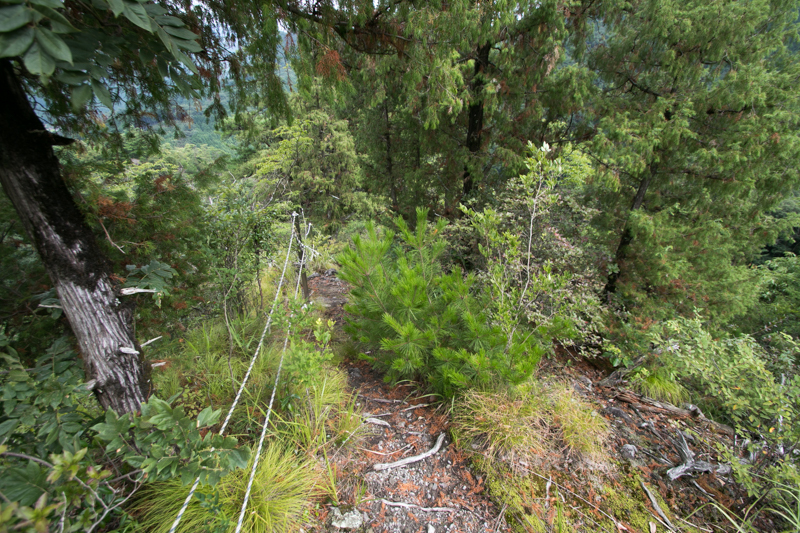 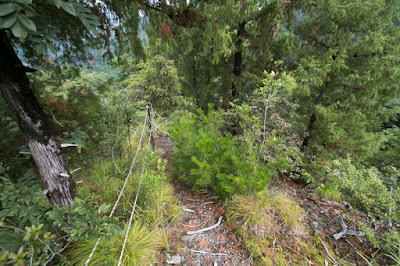 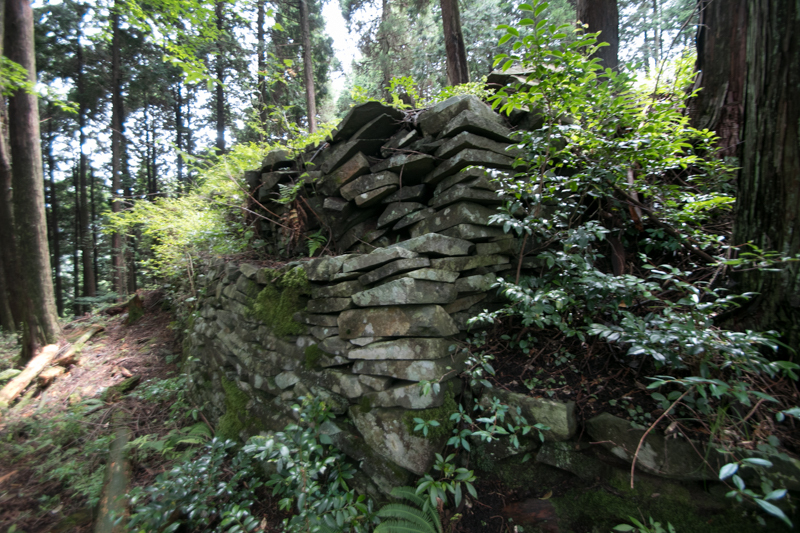 This area is protected by stone walls, and has corridor area at its east and south line. 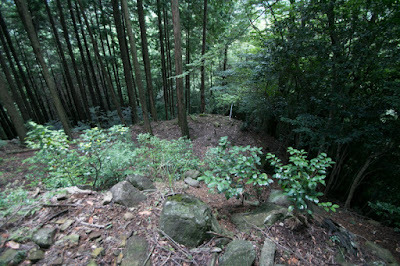 The valley between two peaks is an entrance into castle area. 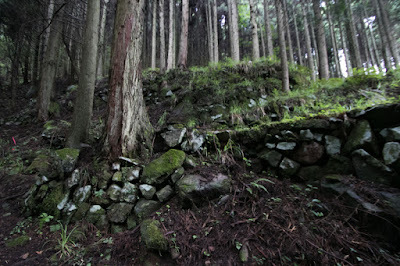 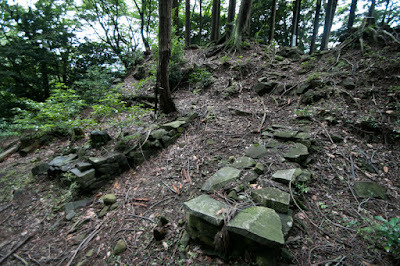 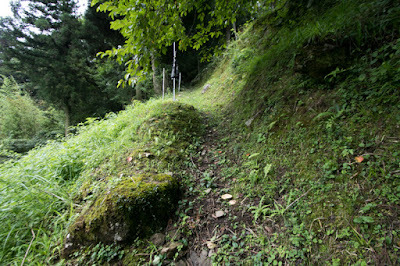 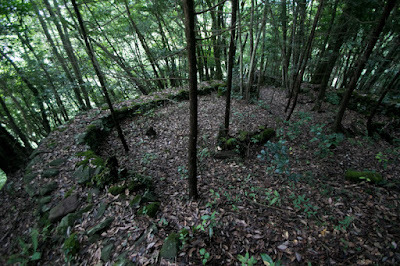 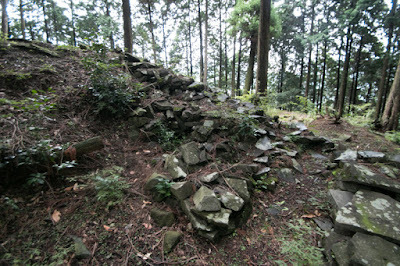 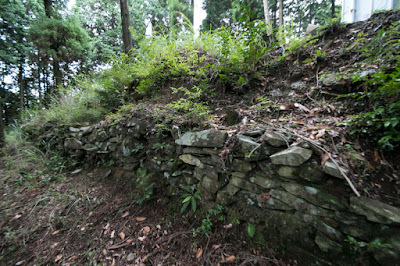 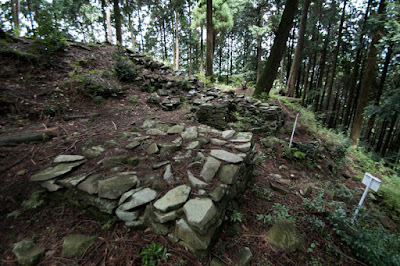 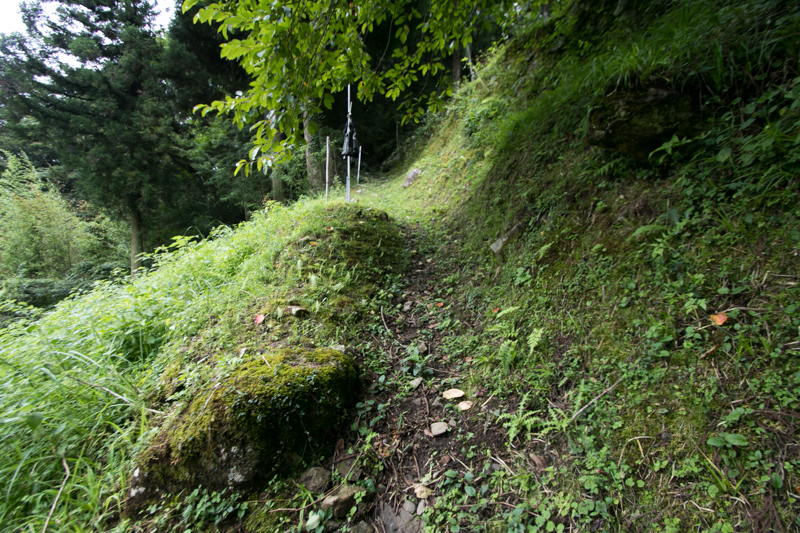 At the north exit of this valley line of stone walls separated inside and outside of the castle, and terraces might be used as the residence of retainers remains at the mouth of the valley. 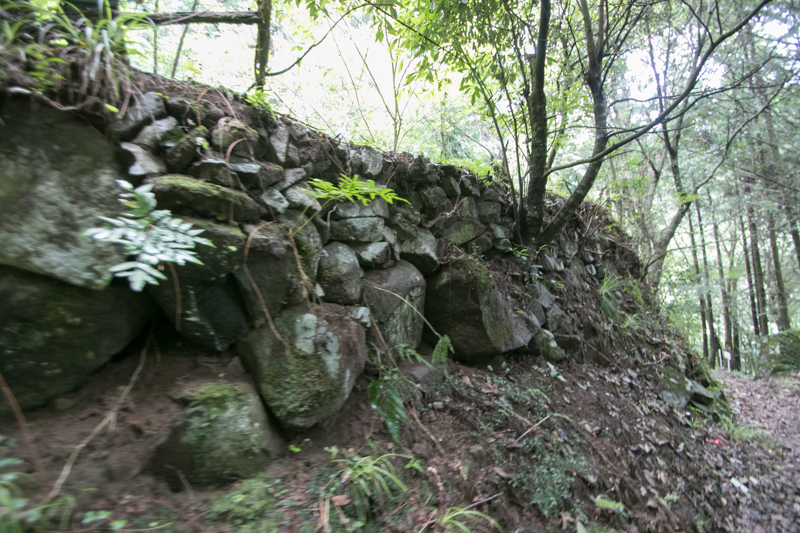 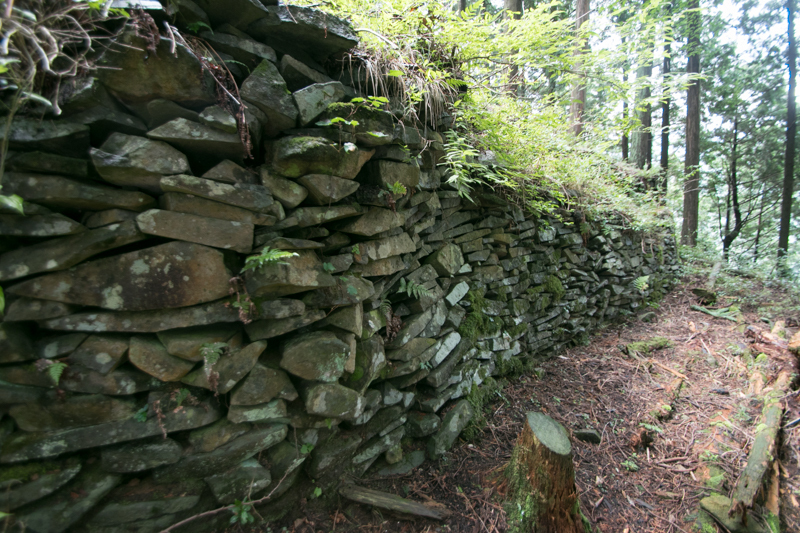 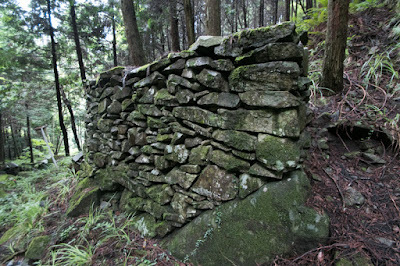 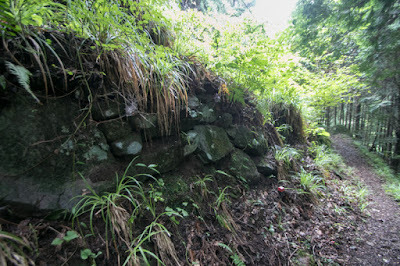 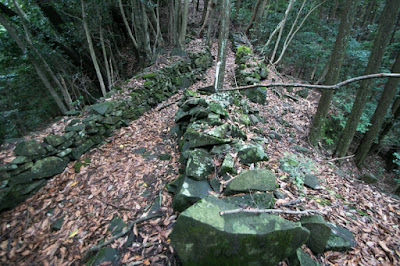 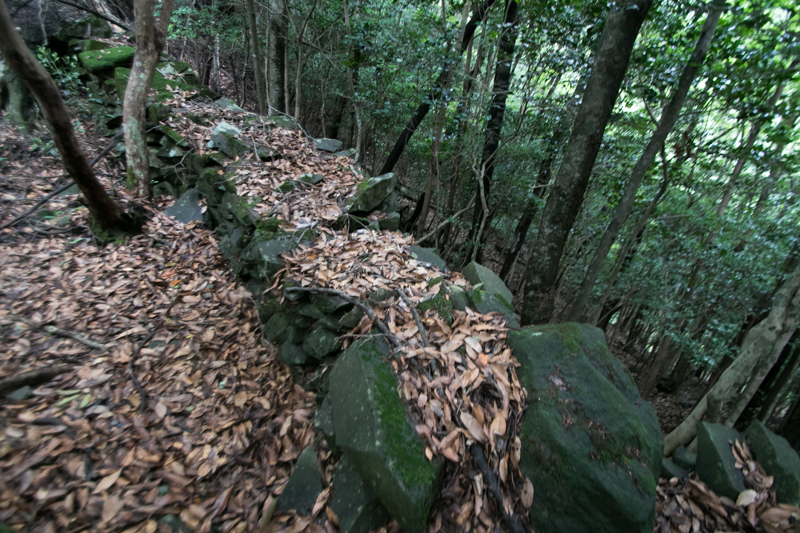 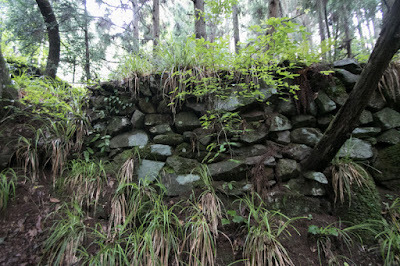 A long line of stone wall spreads from central area to the valley, alike the climbing stone walls of modern castles seen at Hikone castle or Matsuyama castle. 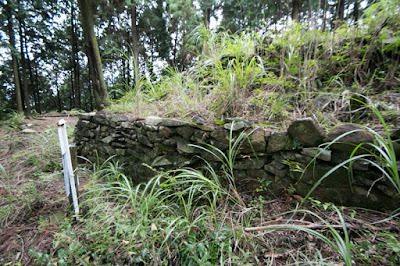 At the opposite of the valley, the residence of the lord was built at the side of eastern peak. 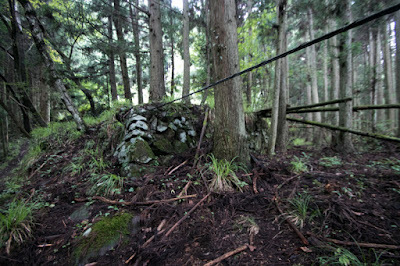 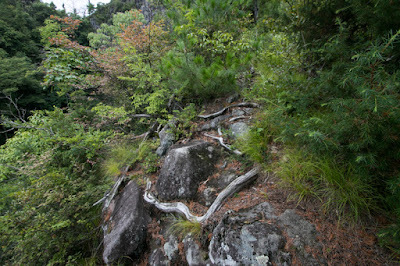 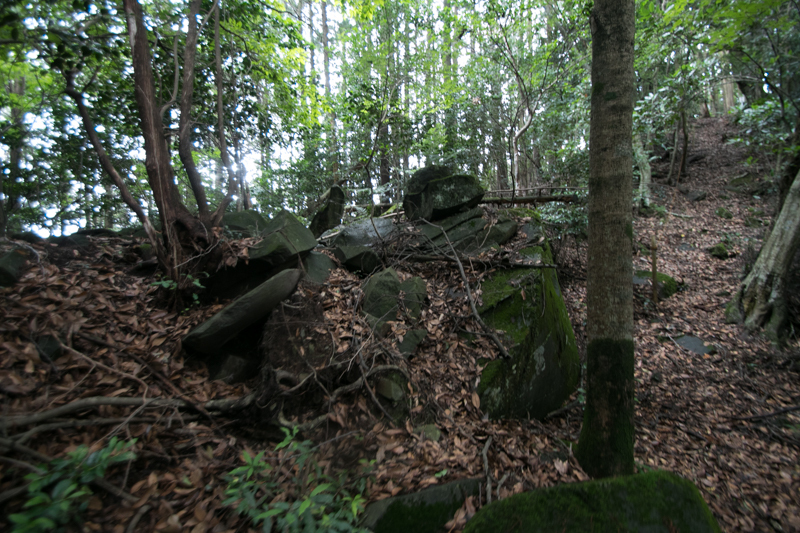 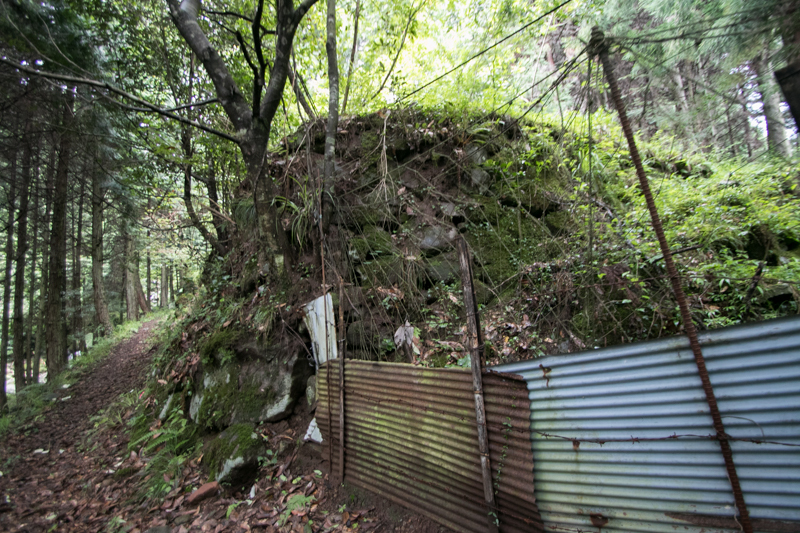 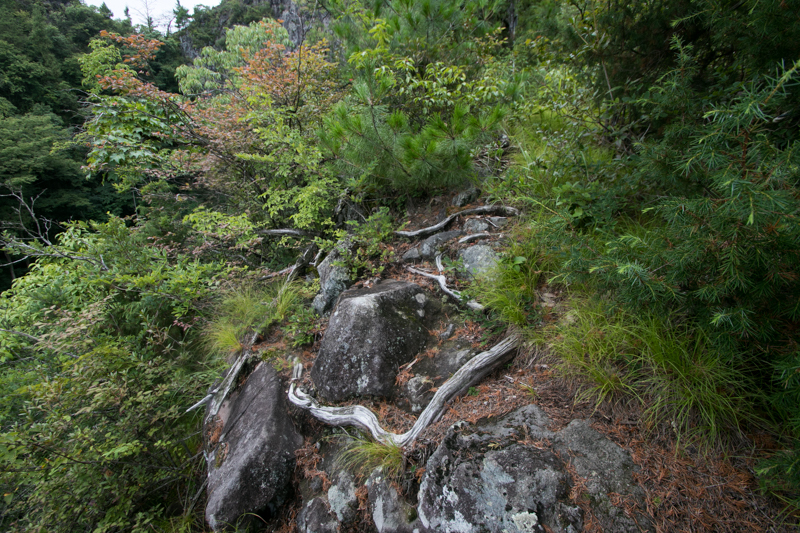 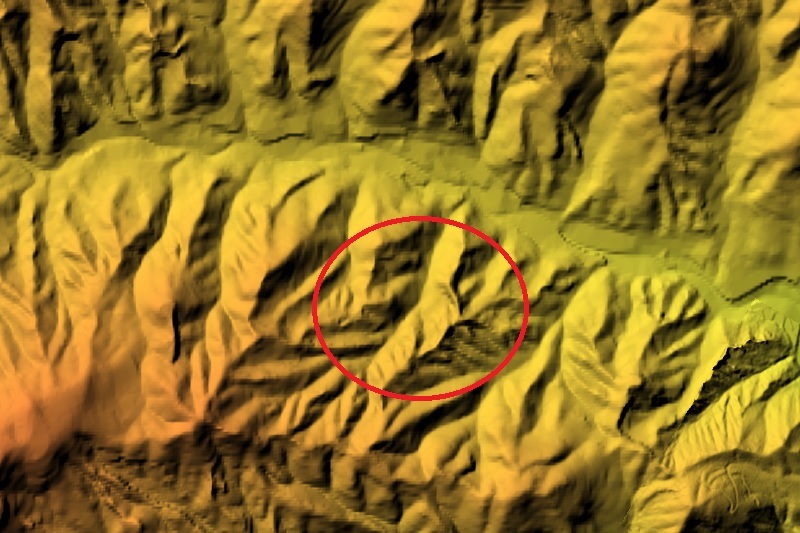 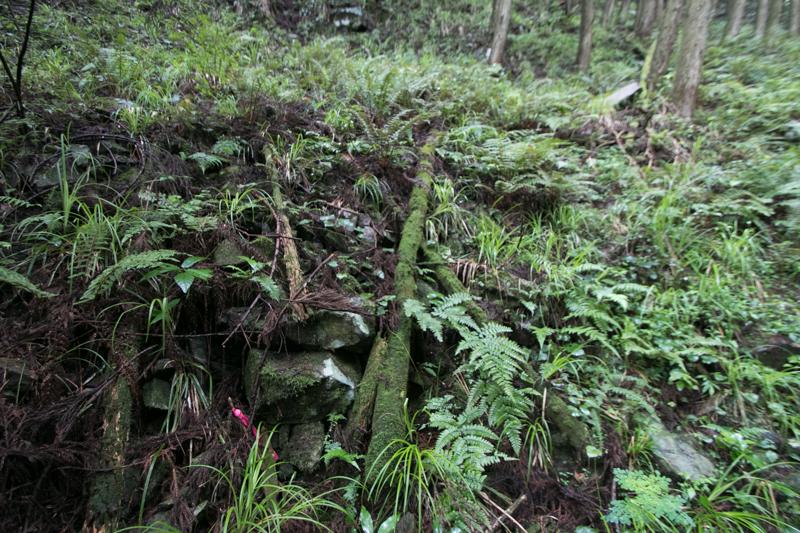 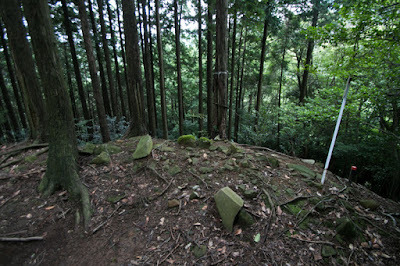 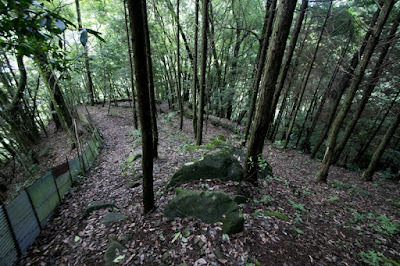 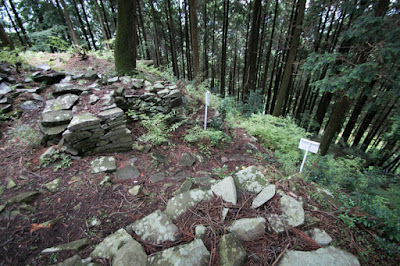 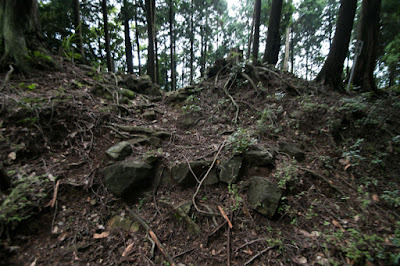 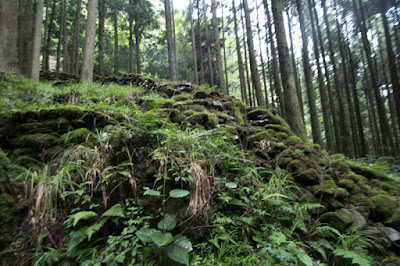 As this point was weak against the attack from eastern peak, along with the ridge of eastern peak there was a defense line utilizing the ridge over 1 kilometer. 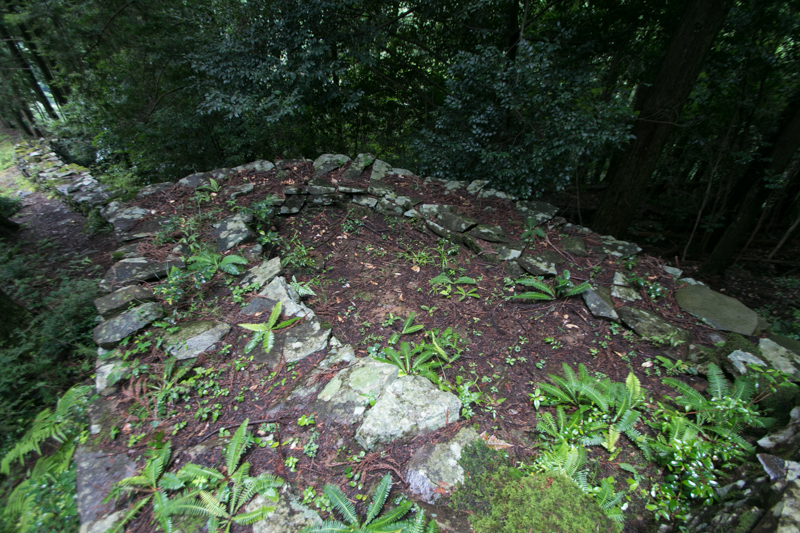 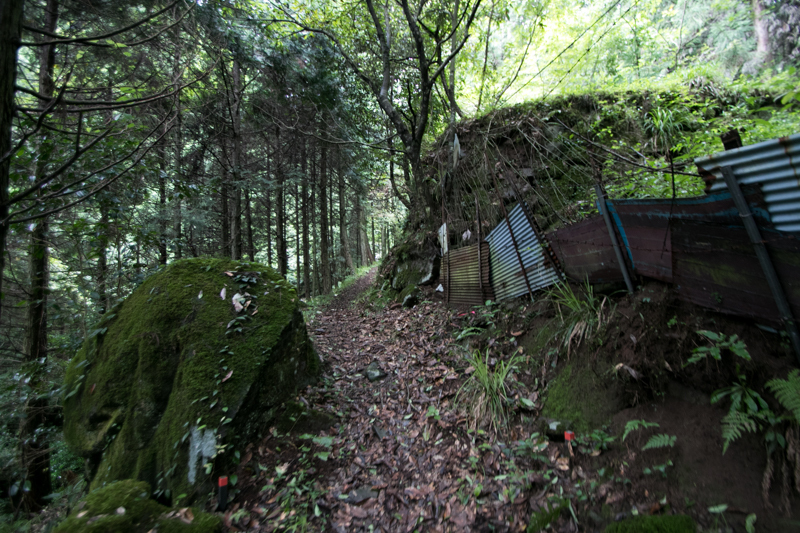 Especially just at the above of the residence, there remains a stone built pillbox like a horseshoe of 2 meter diameter with loopholes built by stones. As the castle mountain consist of fragile rocks, the valley is filled with is filled with numerous debris of rocks. 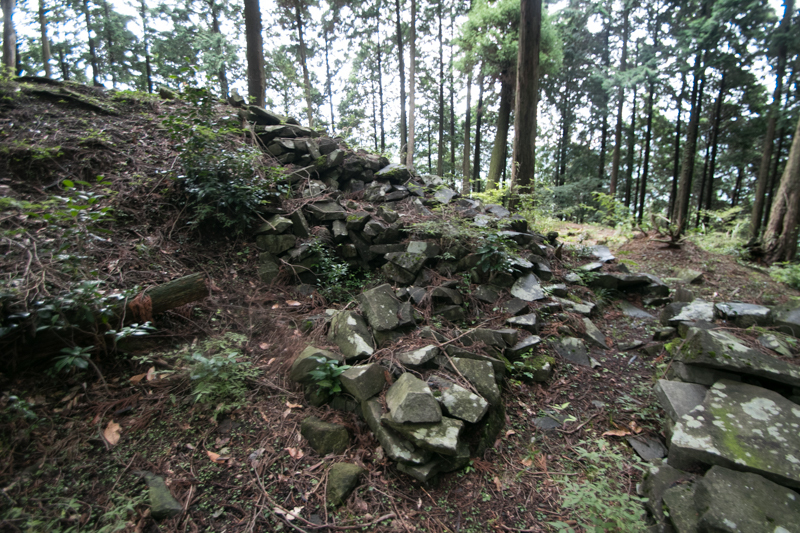 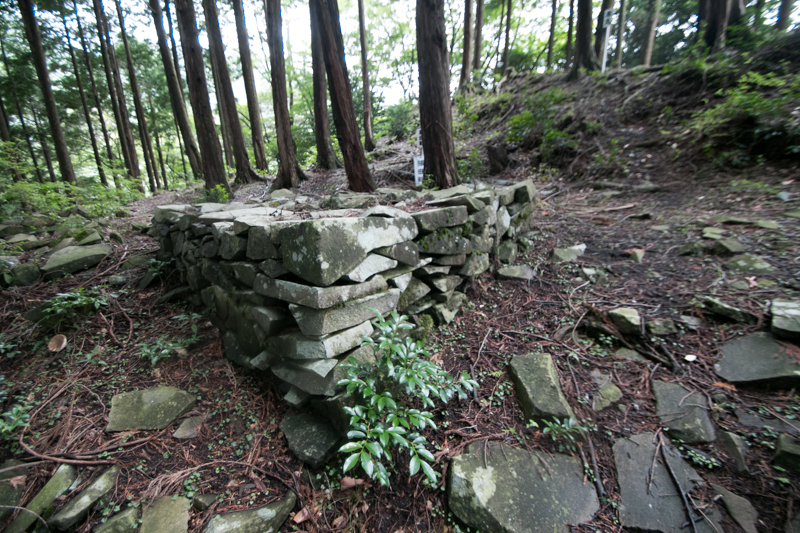 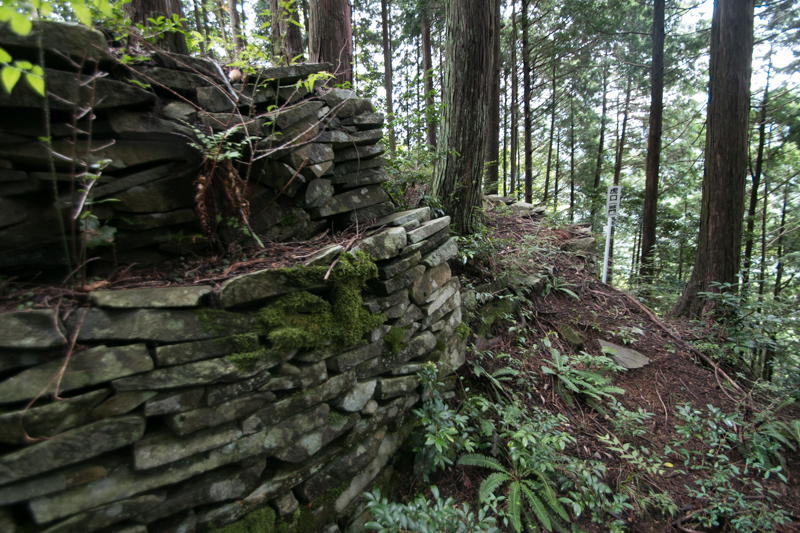 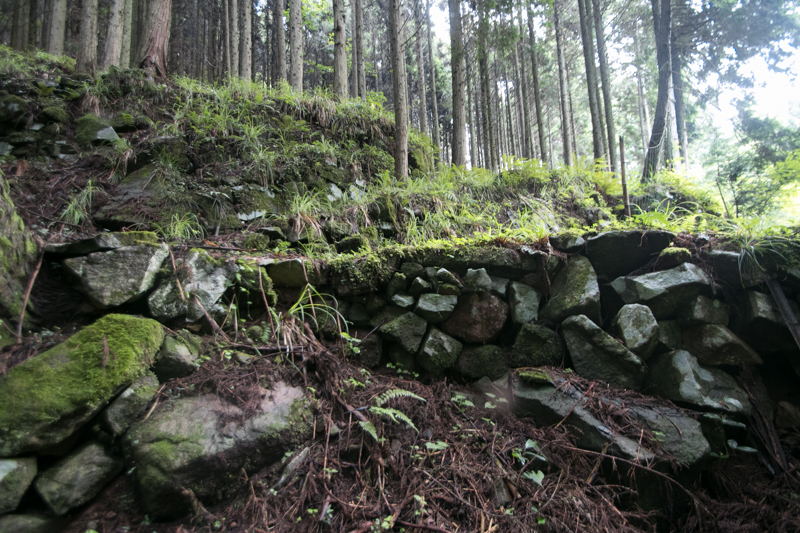 It was quite easy to pick these stones and build up stone walls just shaping these stones, thus Nagaiwa castle has an extraordinary scale of stone walls compared with neighbor castles. 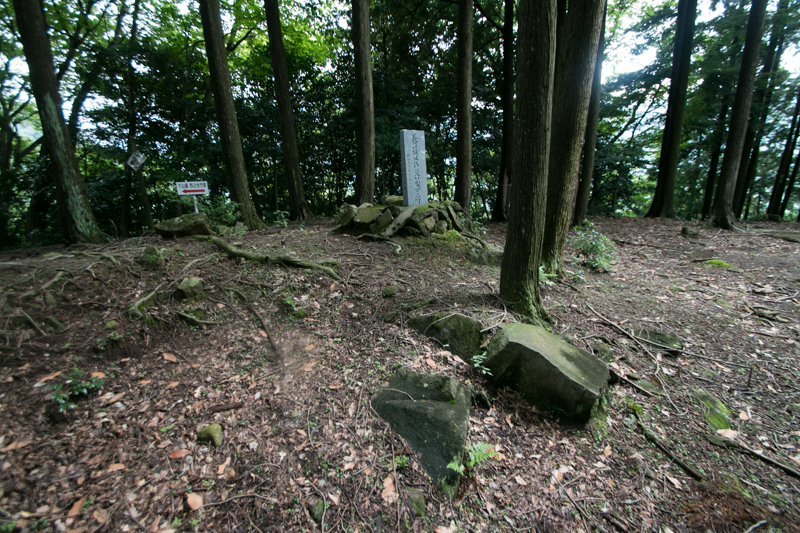 In 1578, Otomo clan significantly lost its power at the defeat of the battle of Mimikawa against Shimazu clan. 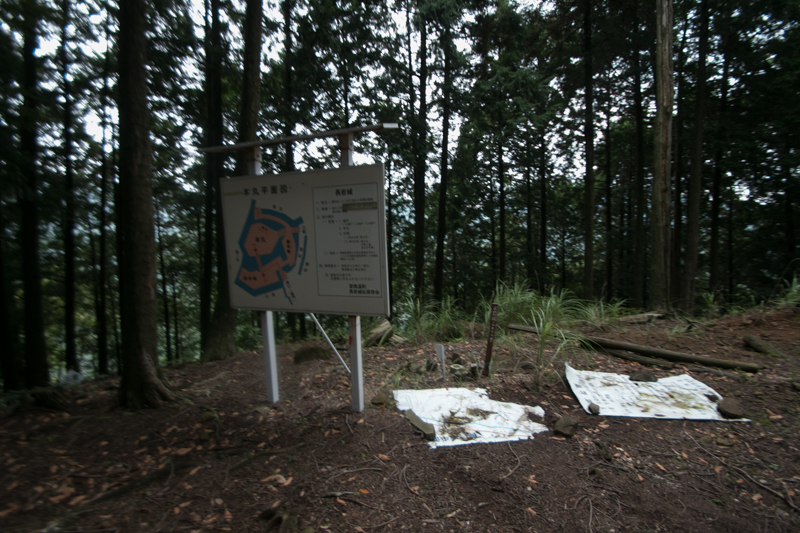 Looking at this situation, Buzen Utsunomiya clan and Nonaka clan both left Otomo clan then belonged to Shimazu clan, and Nonaka clan expanded their territory at neighbor area. 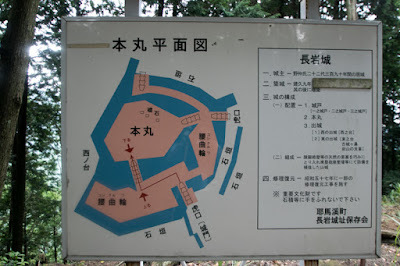 However, in 1587, central ruler Hideyoshi Toyotomi (1537-1598) made his campaign against Shimazu clan, and Buzen province became the territory of Yoshitaka Kuroda (1546-1604), an intelligent staff of Hideyoshi resided at Nakatsu castle (Oita prefecture). 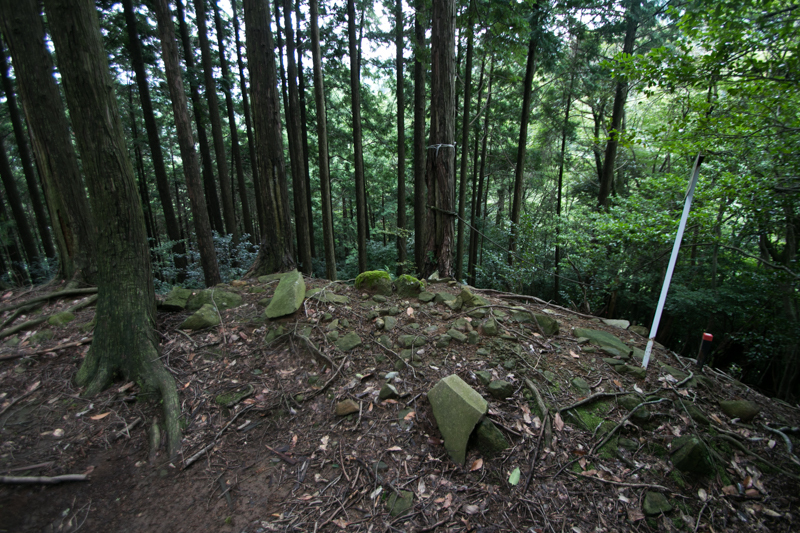 Buzen Utsunomiya clan and Nonaka clan left Shimazu clan and followed Hideyoshi, but they were deprived as the position of independent lords and were forced to be the retainer of Kuroda clan. 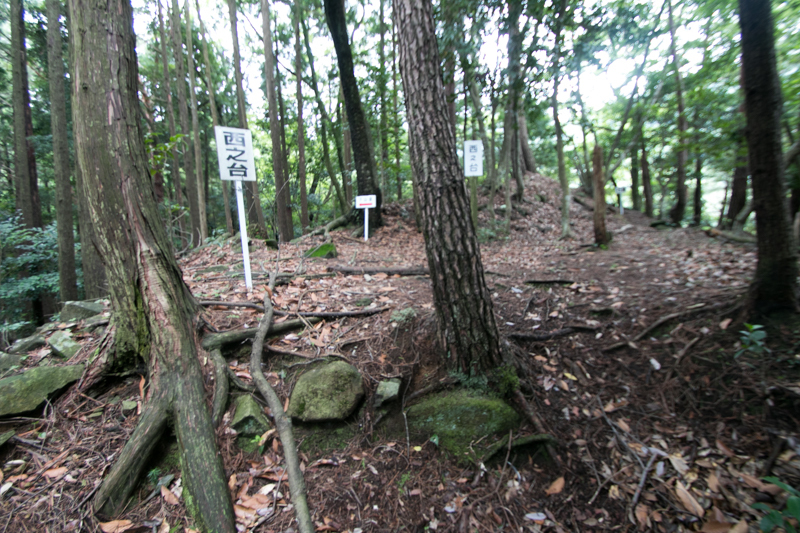 Facing this situation, Buzen Utsunomiya clan and fellows revolted against Kuroda clan in 1587, and Nonaka clan followed their main family. 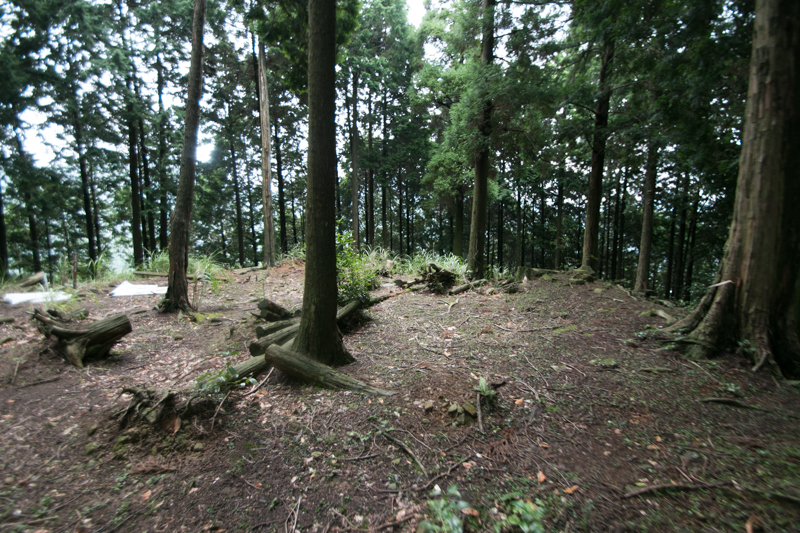 Once Utsunomiya clan broke Kuroda army at guerilla tactics at their main base Kiidani castle, but facing the protracting battle of Kuroda army finally agreed with Kuroda clan. 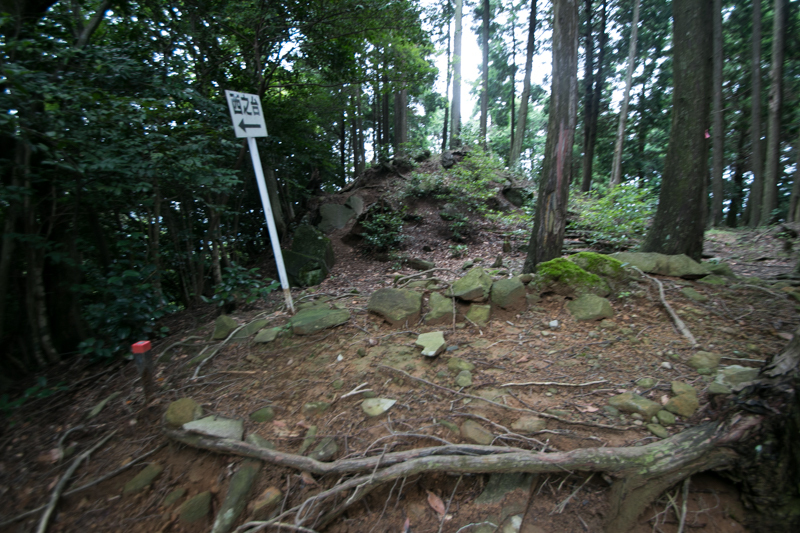 Next Kuroda army attacked Shigekane Nonaka (?-1588), the last leader of Nonaka clan at Nagaiwa castle. 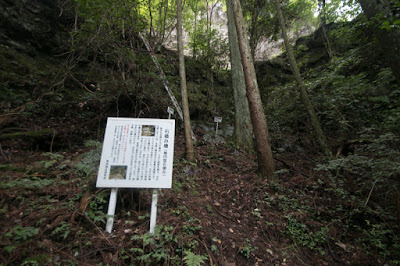 Shigekane bravely fought against overwhelming Kuroda army, but finally killed himself and Nonaka clan ended its history. 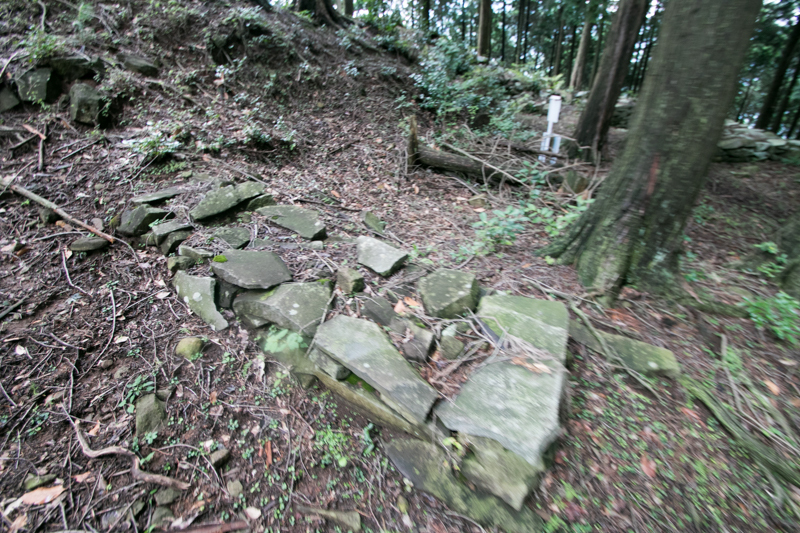 Just after that Yoshitaka Kuroda assassinated the people of Utsunomiya clan, and whole Buzen province became the territory of Kuroda clan. 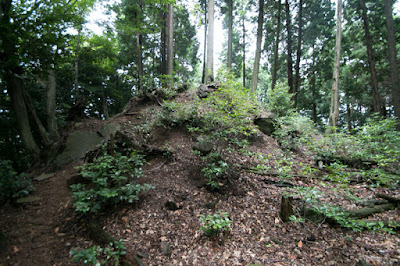 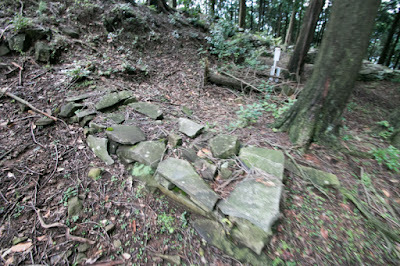 After the battle Nagaiwa castle was abolished and not used any more. Currently no building was left but line of stone walls and stone built structures still remain at the two peaks and inside valleys. Lines of stone walls and gates still shows this was a main base of traditional and strong local lord of the area. 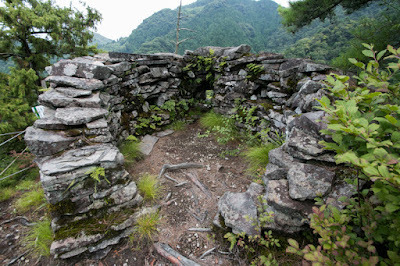 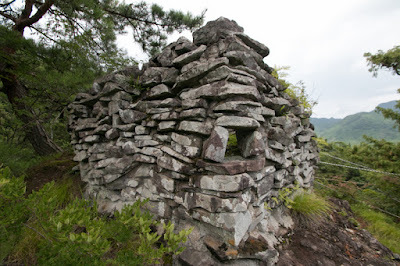 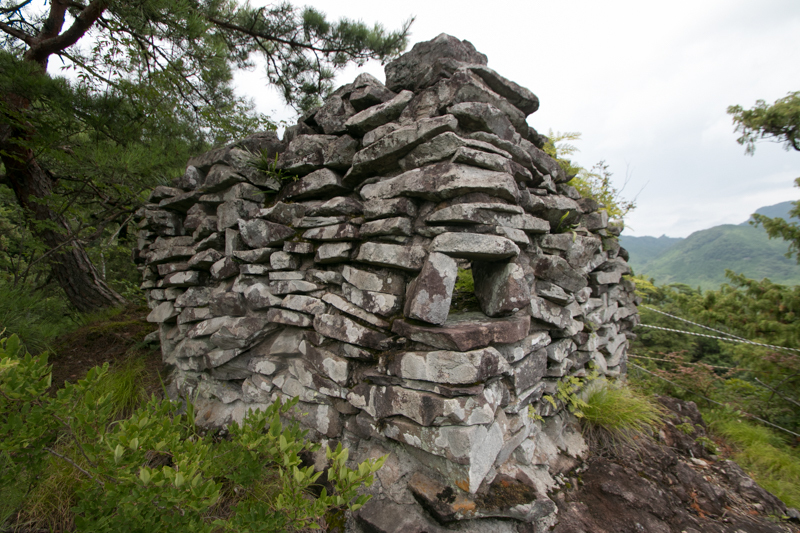 The castle site locates deep inside of the mountain and need careful to walk around creeks and steep slopes covered with rocks, but it is still worth visiting of this castle ruin. 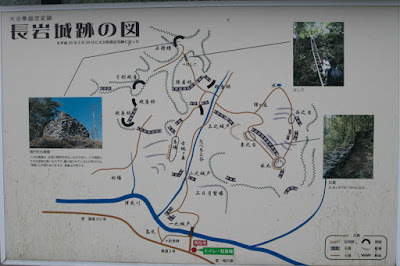 40 minutes drive from Higashi-Kyushu Jidoshado Expressway Nakatsu interchange to hillside parking via Route 10, Route 212 and Oita Prefecture Road 2. 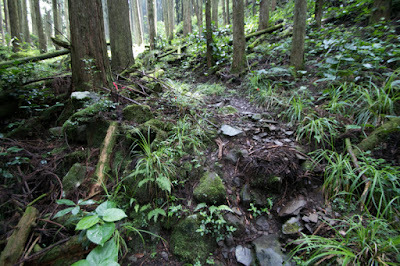 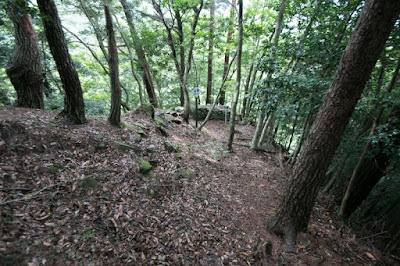 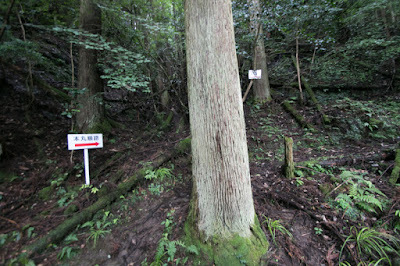 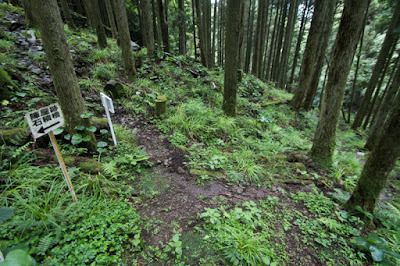 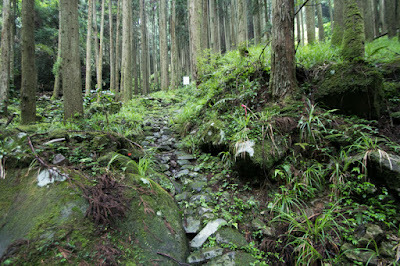 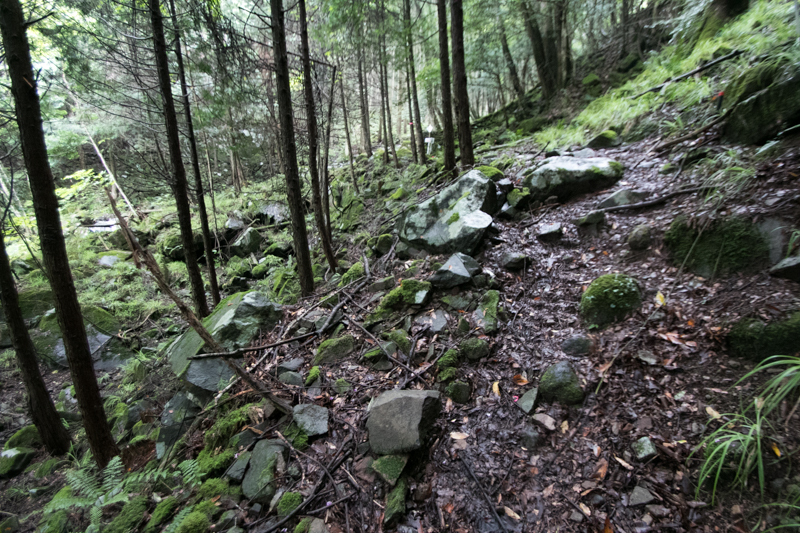 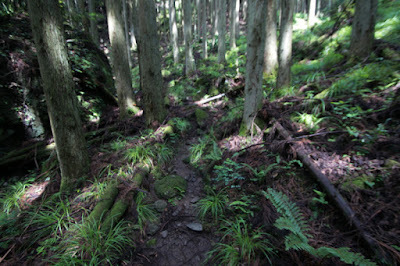 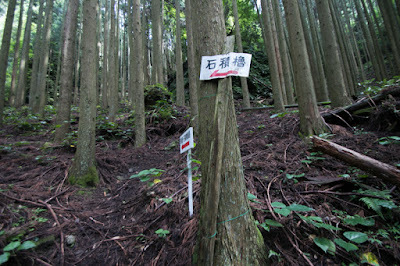 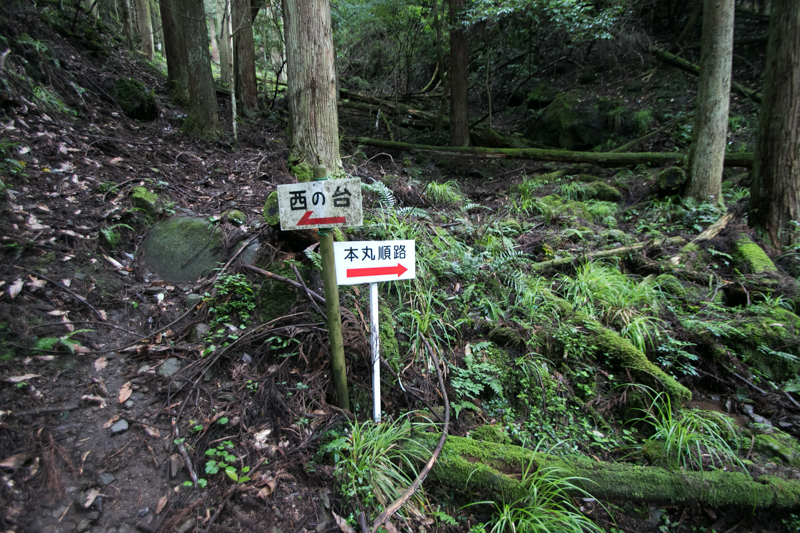 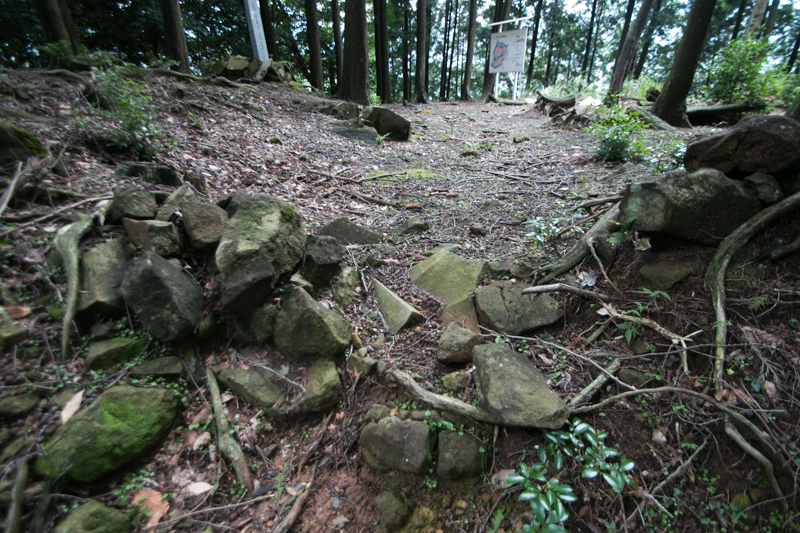 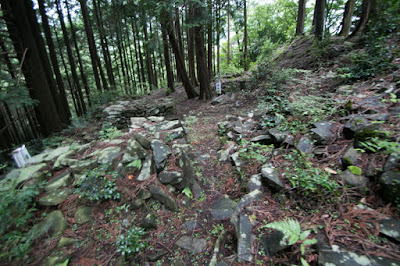 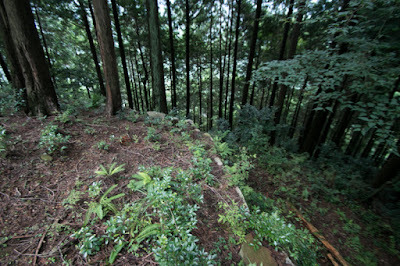 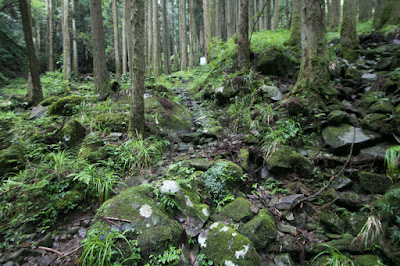 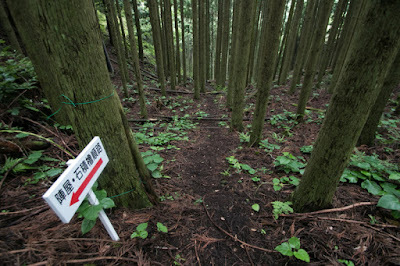 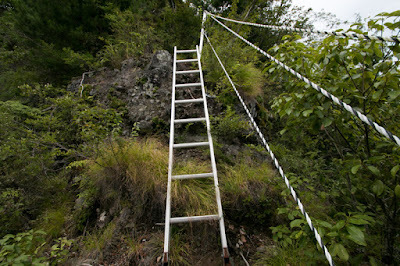 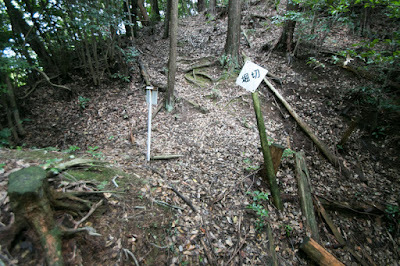 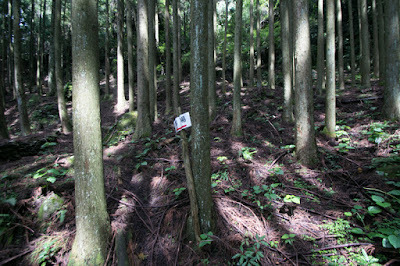 30 minutes walk from hillside parking to hilltop castle and be careful for creeks at rainy days.